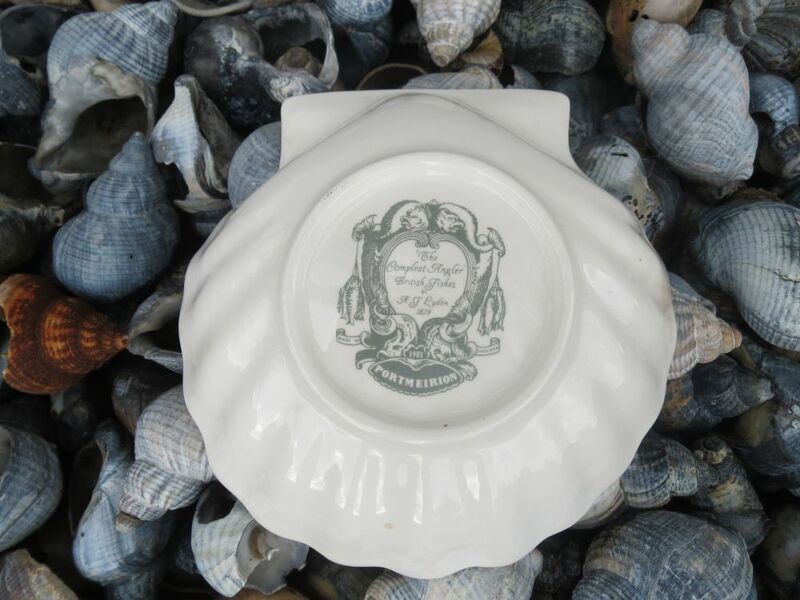 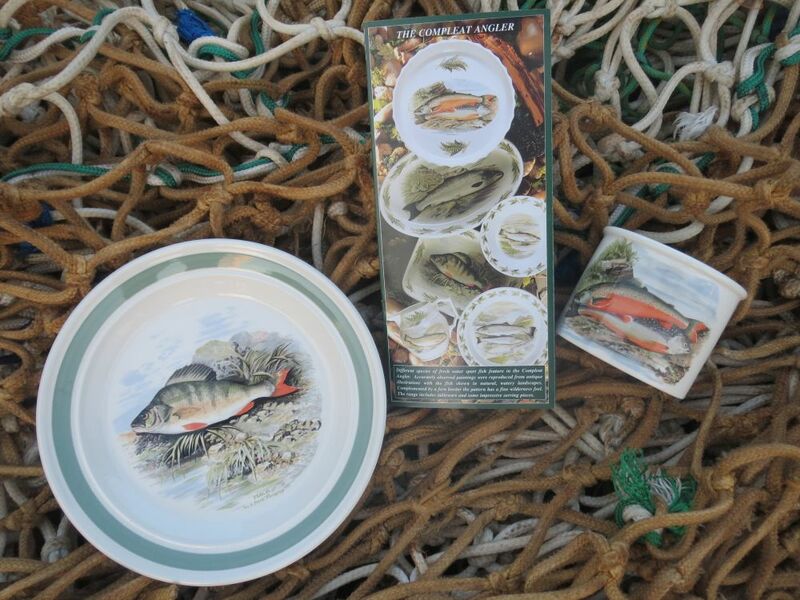 In 1980 Portmeirion introduced a range of fisherman’s fish: The Compleat Angler. 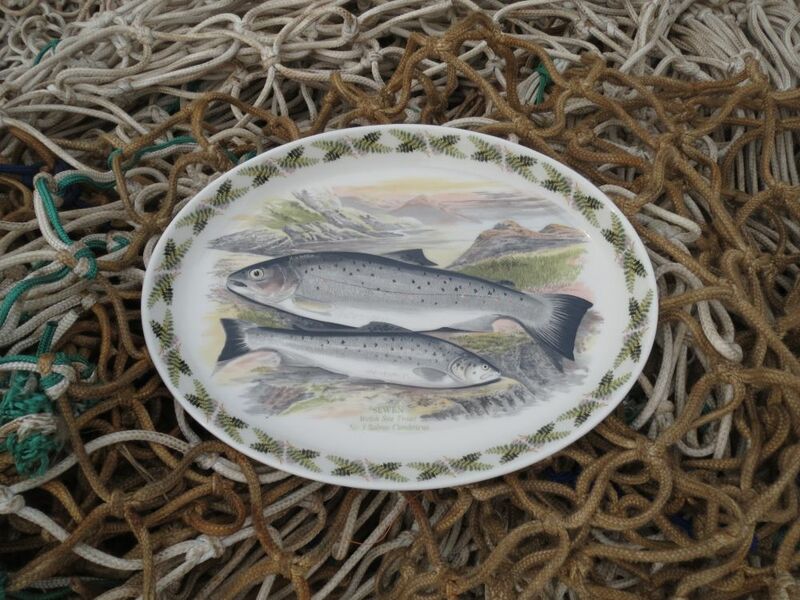 The paintings were taken from The Compleat Angler – British Fishes, by M J Lydon, published in 1879. 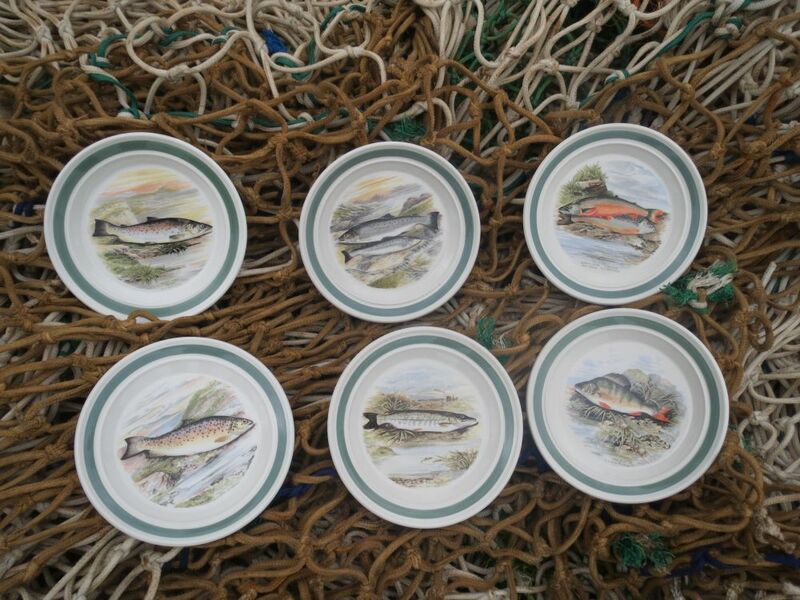 There were seven fish motifs: here are the Great Lake Trout, the Welsh Trout, the Alpine Char, the Gillaroo, the Pike and the Perch. 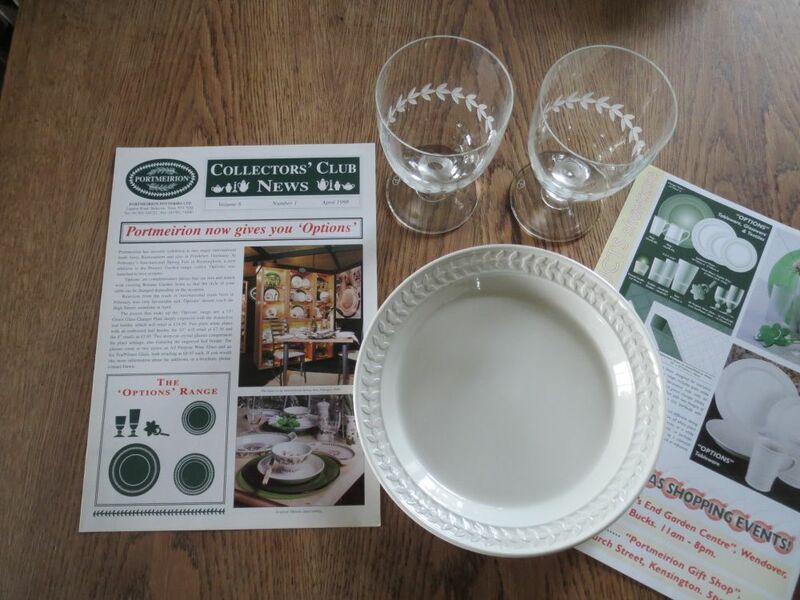 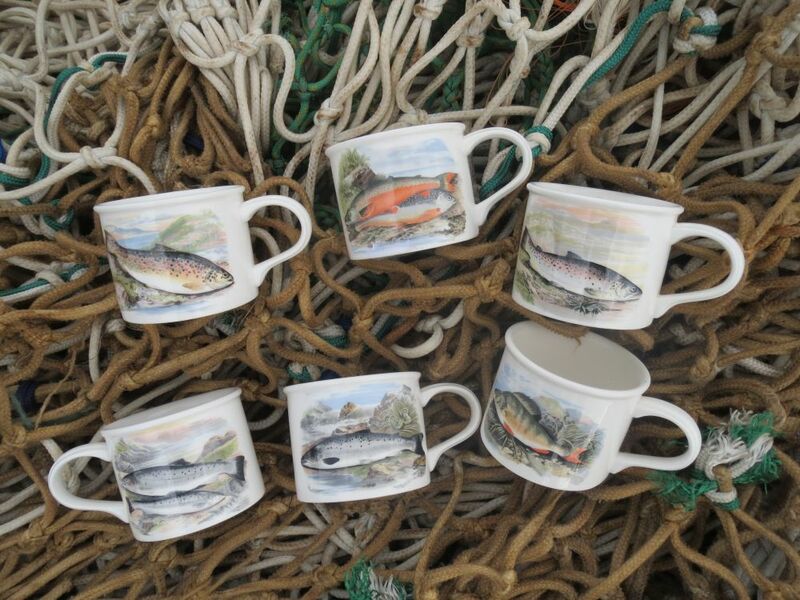 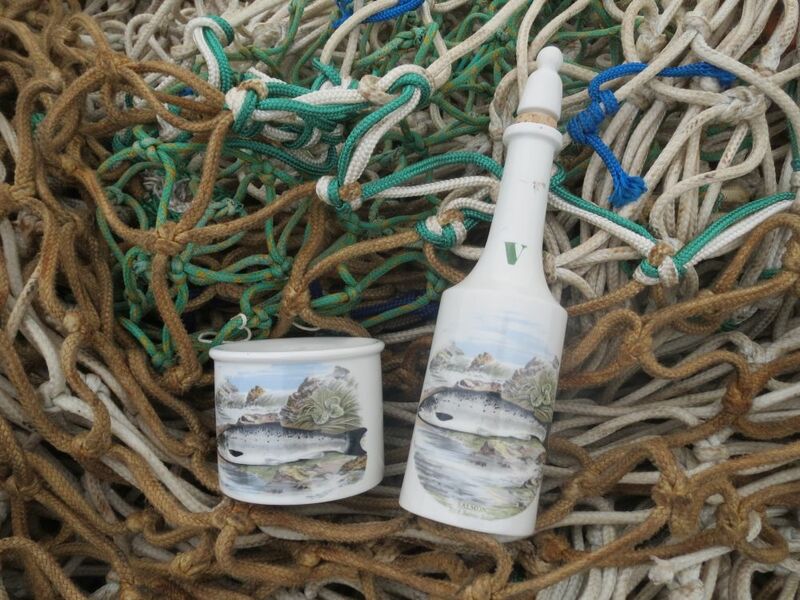 On the cups are the Gillaroo, the Alpine Char, the Great Lake Trout, the Welsh Trout, the Salmon and the Perch. 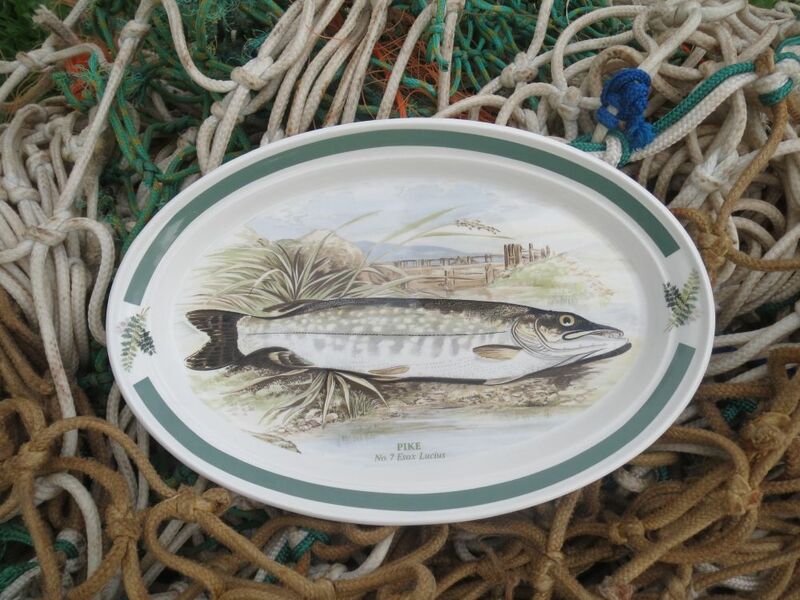 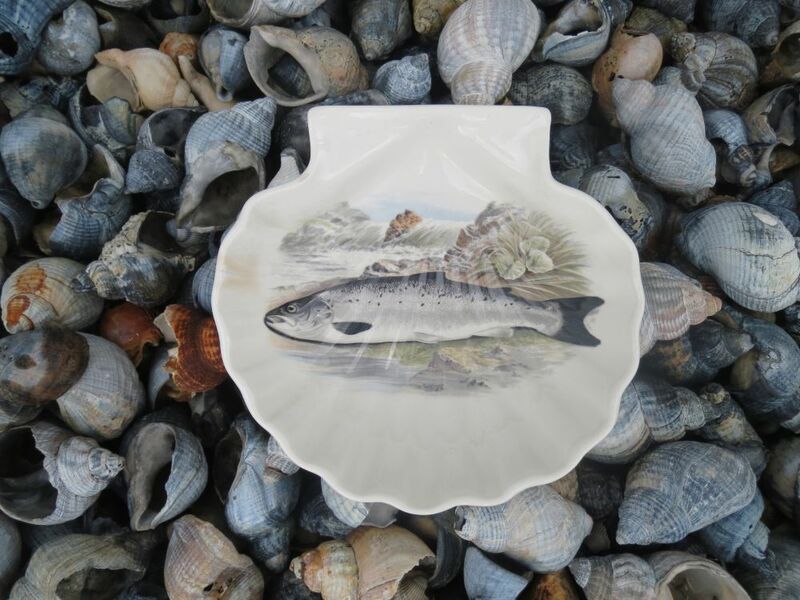 The Pike, here on an oval dish, is the seventh fish and not as frequently seen as the other six. 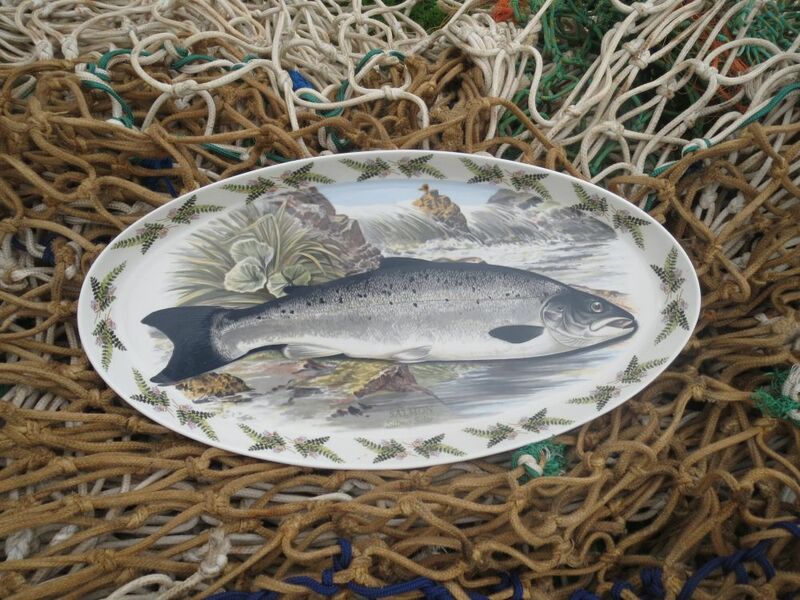 The fish on this 19 inch fish platter is the Salmon. 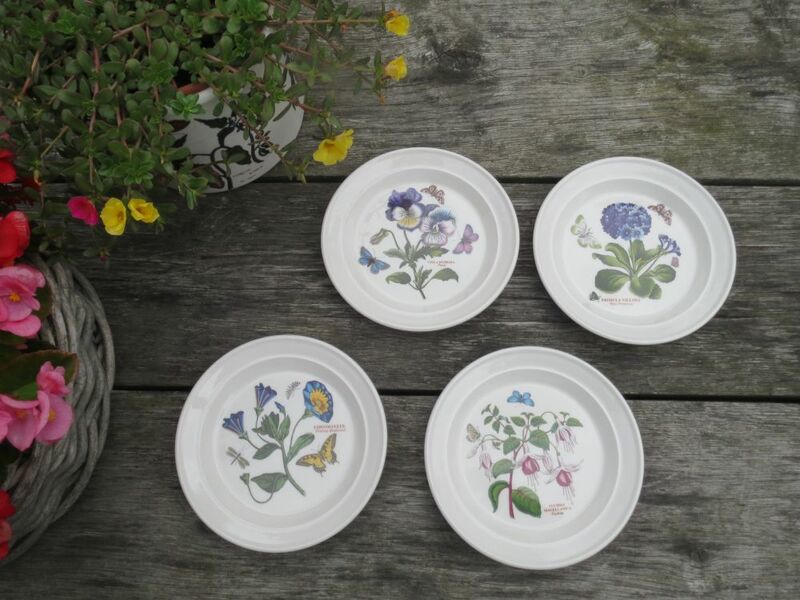 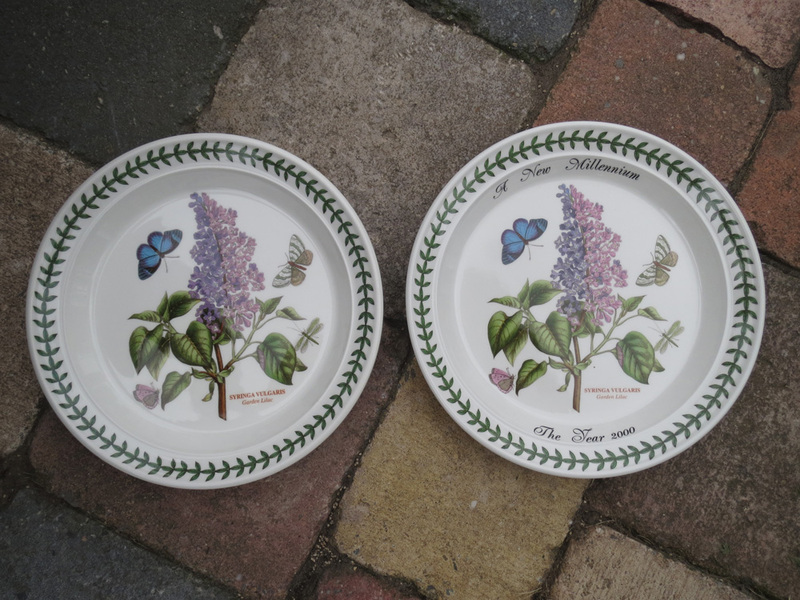 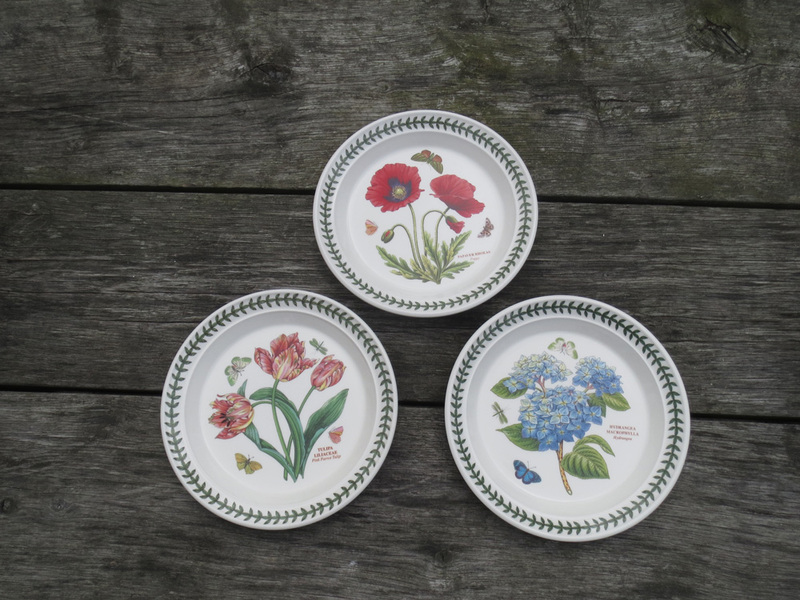 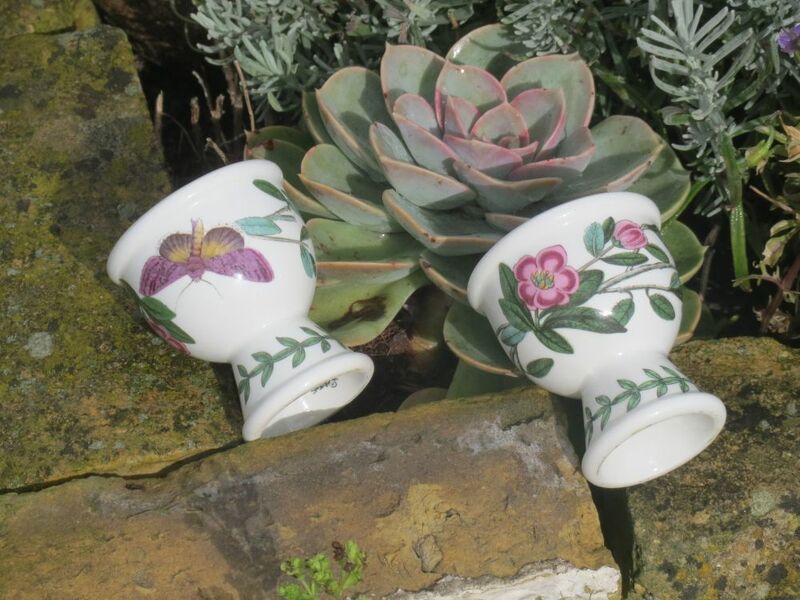 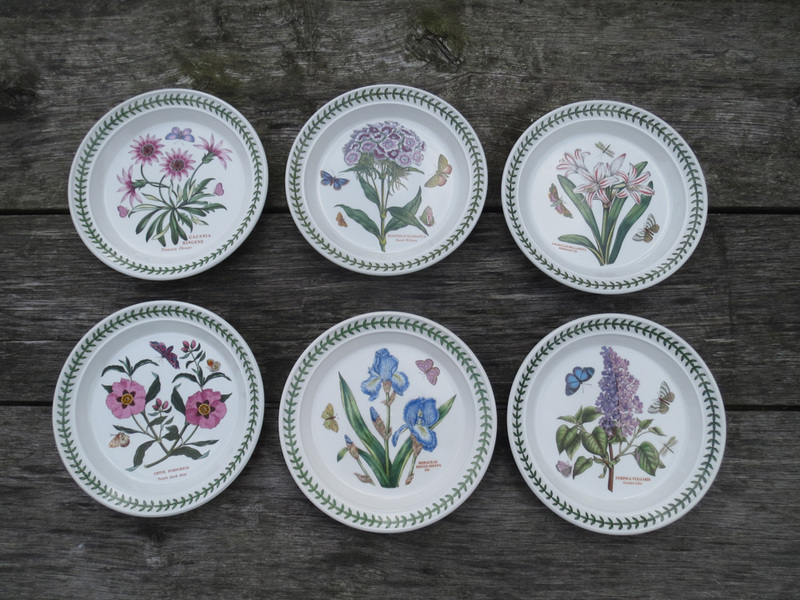 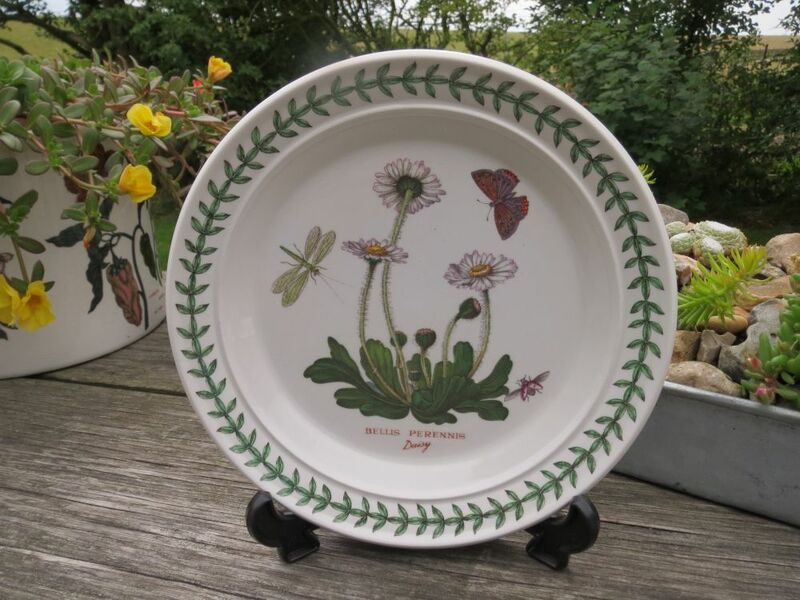 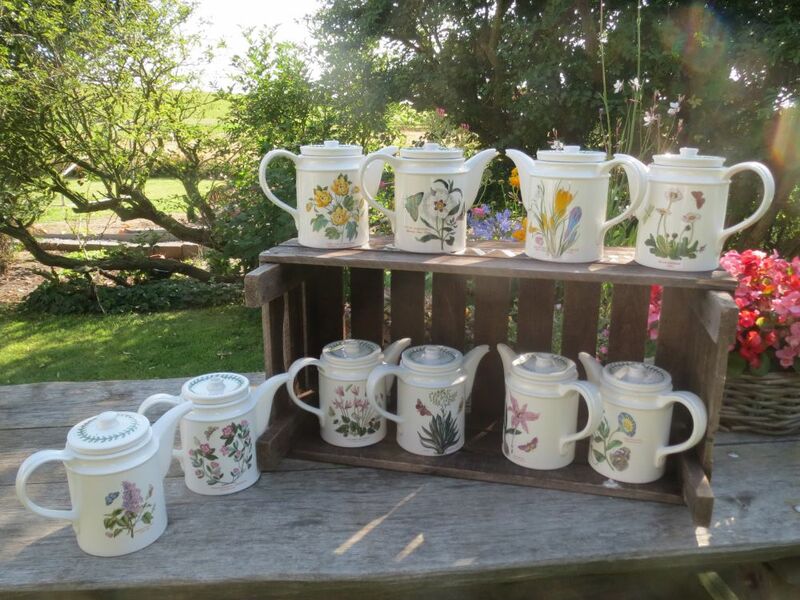 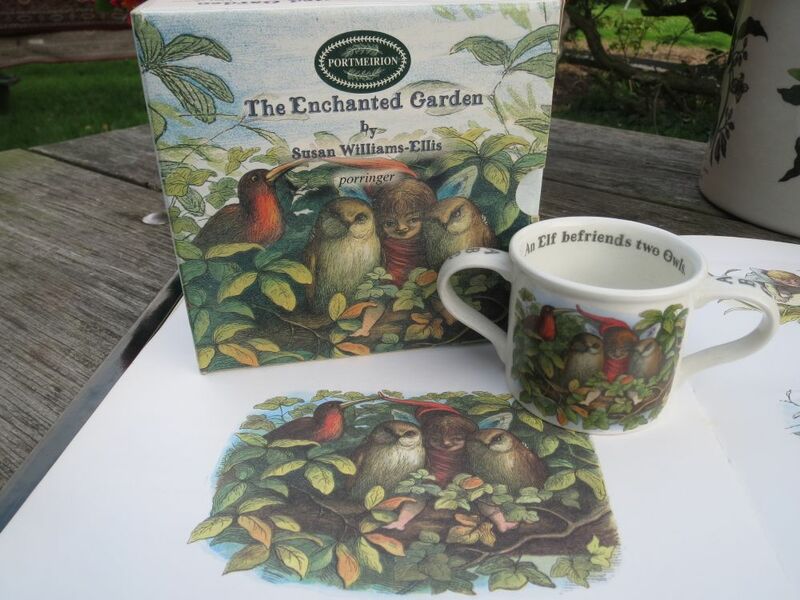 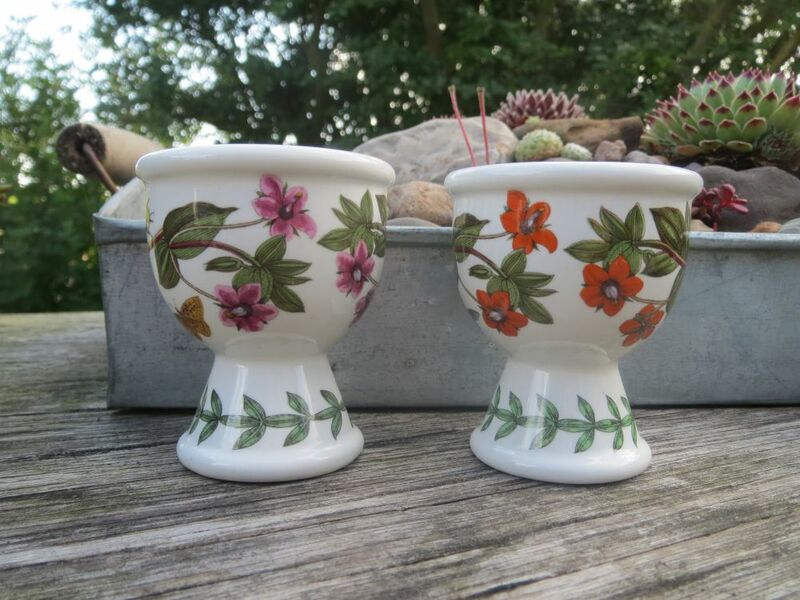 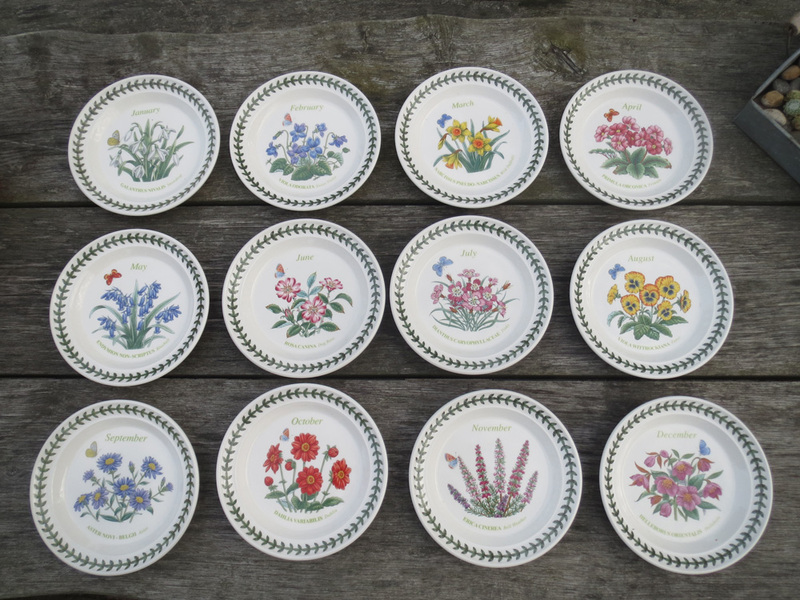 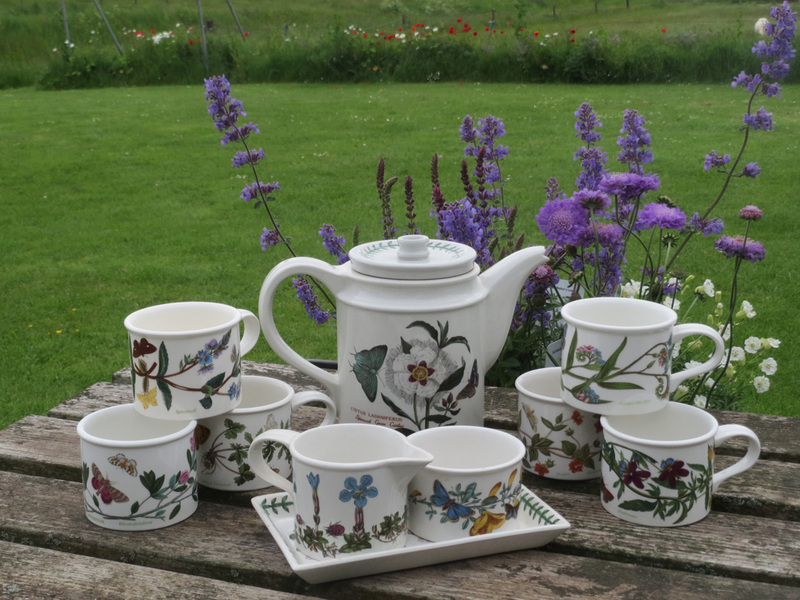 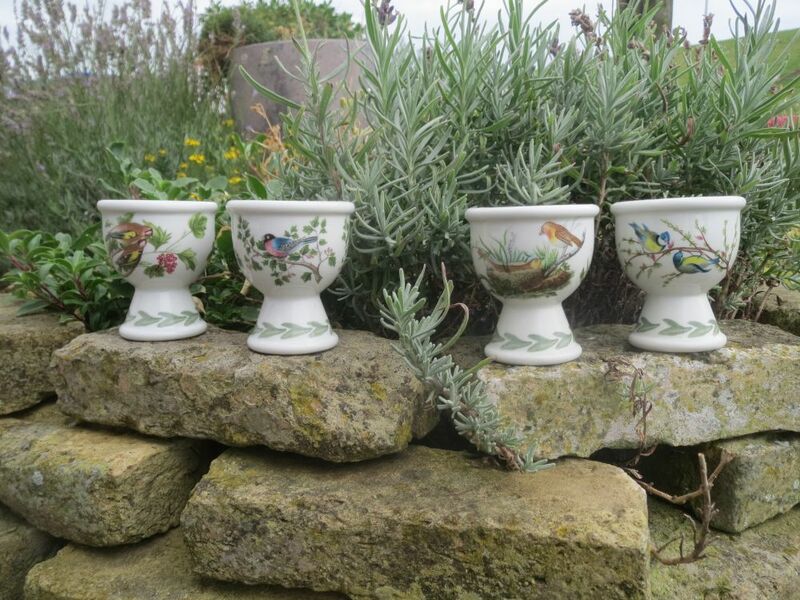 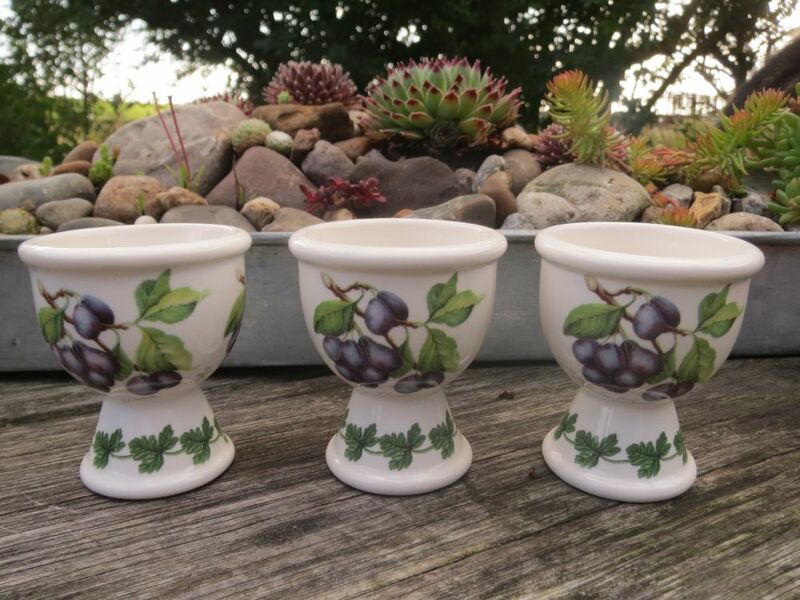 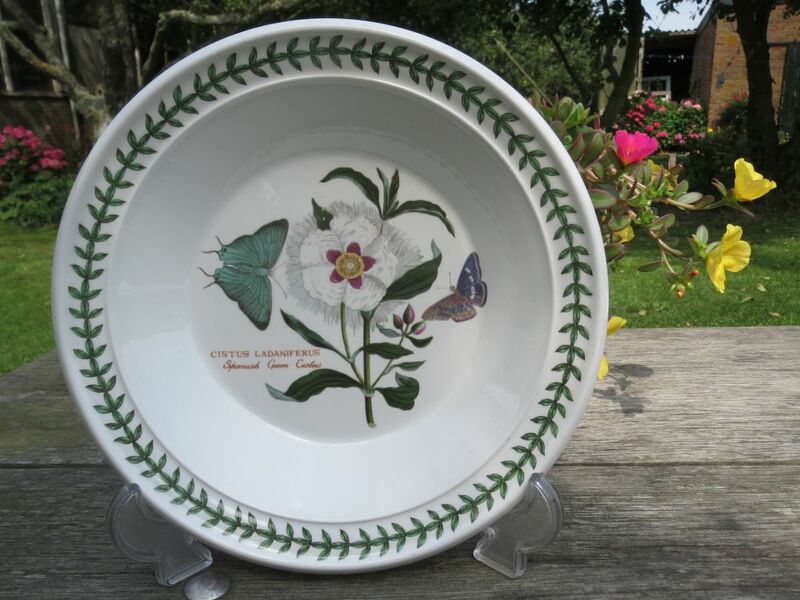 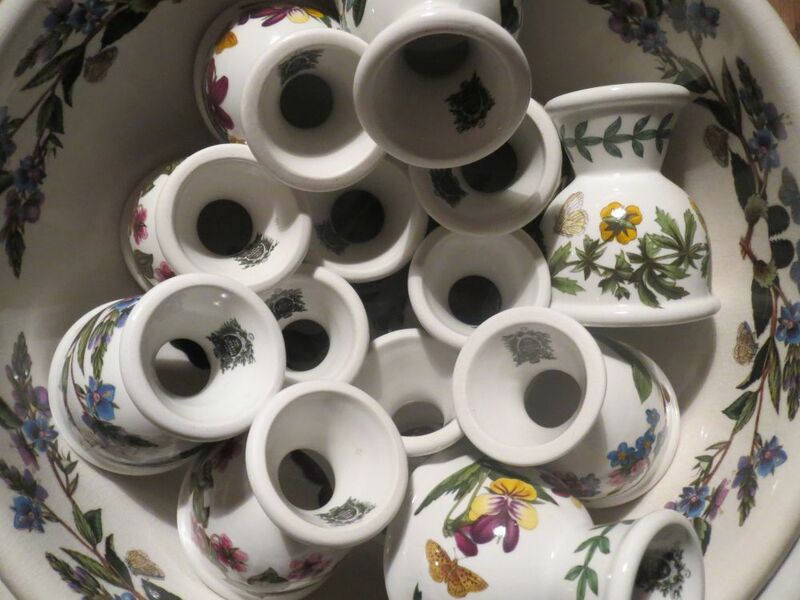 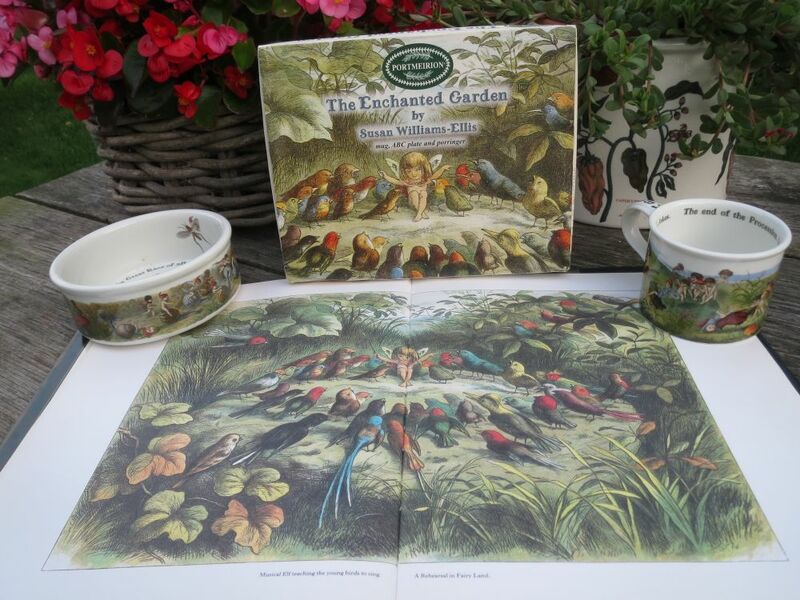 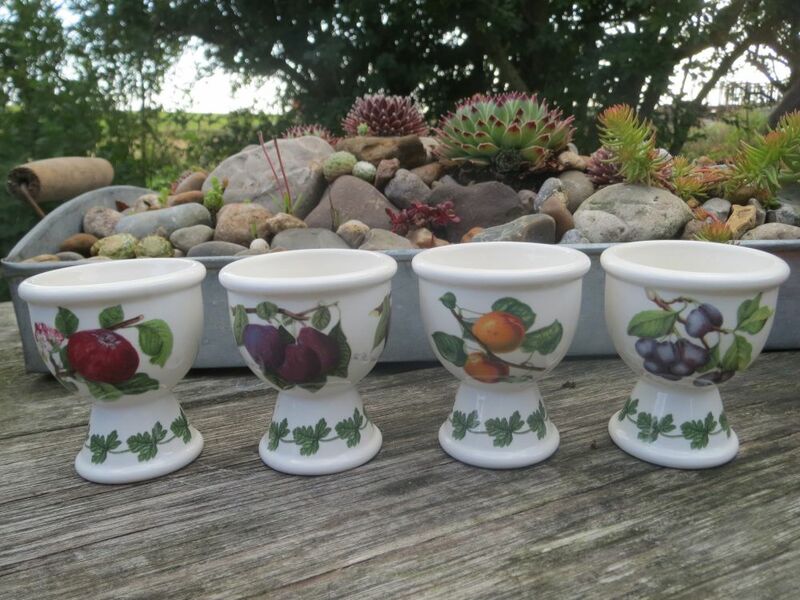 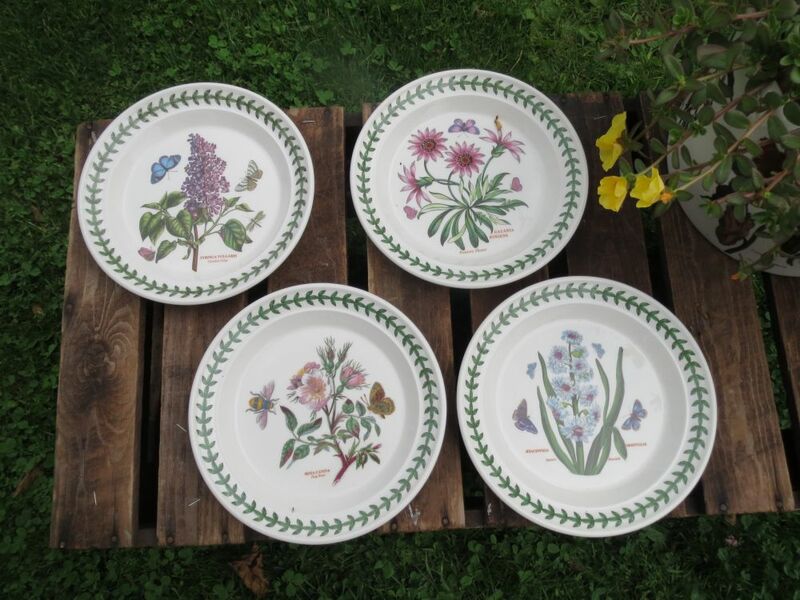 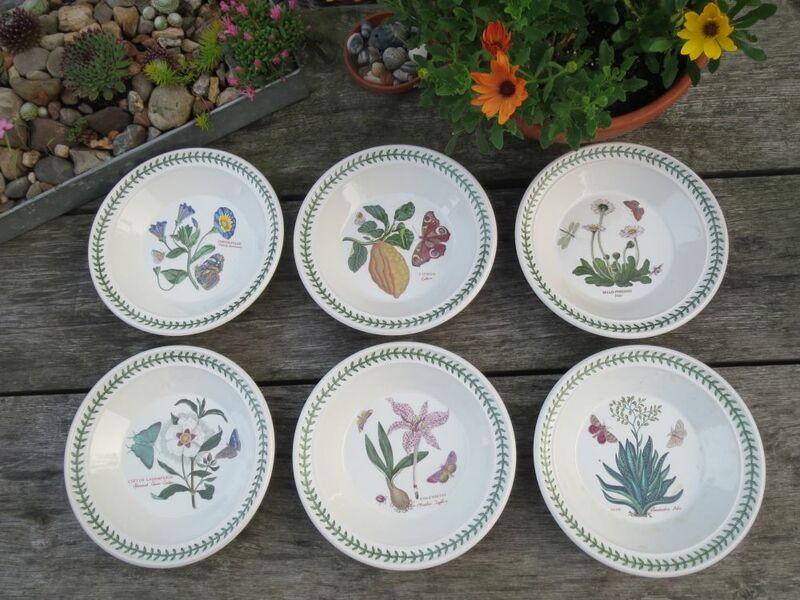 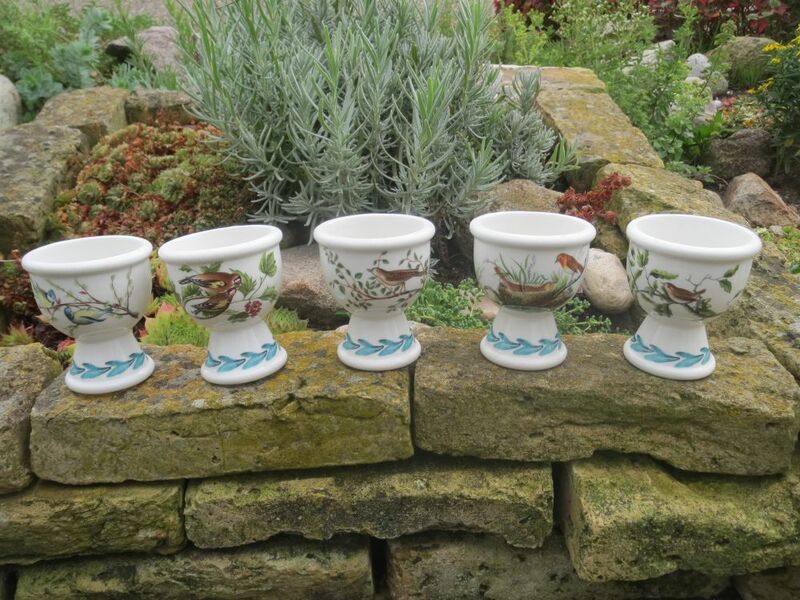 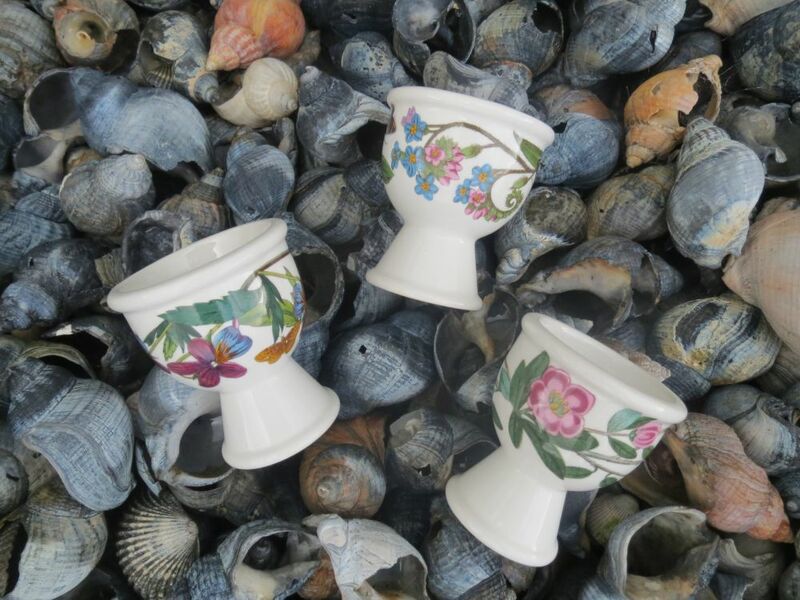 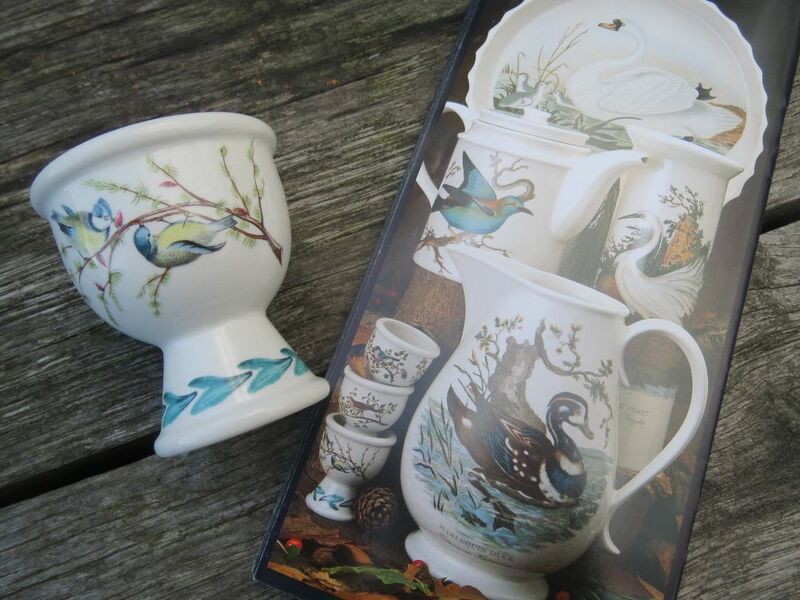 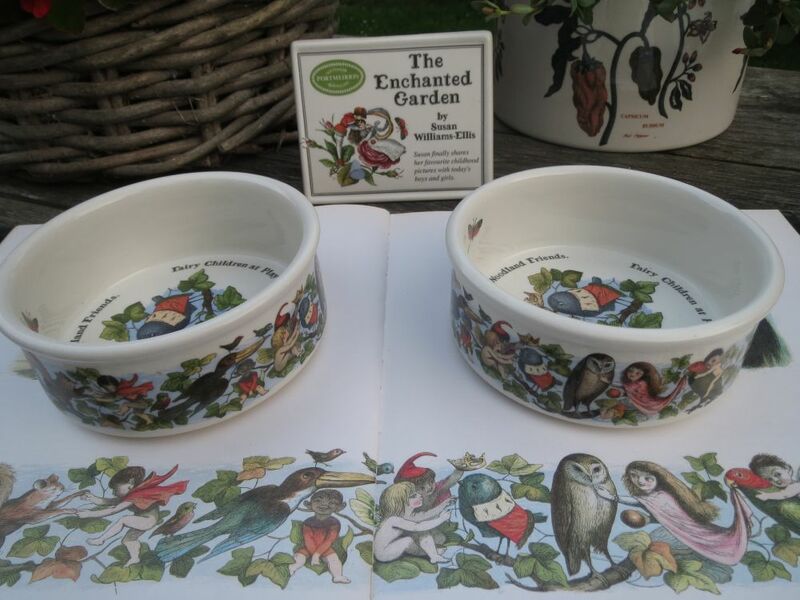 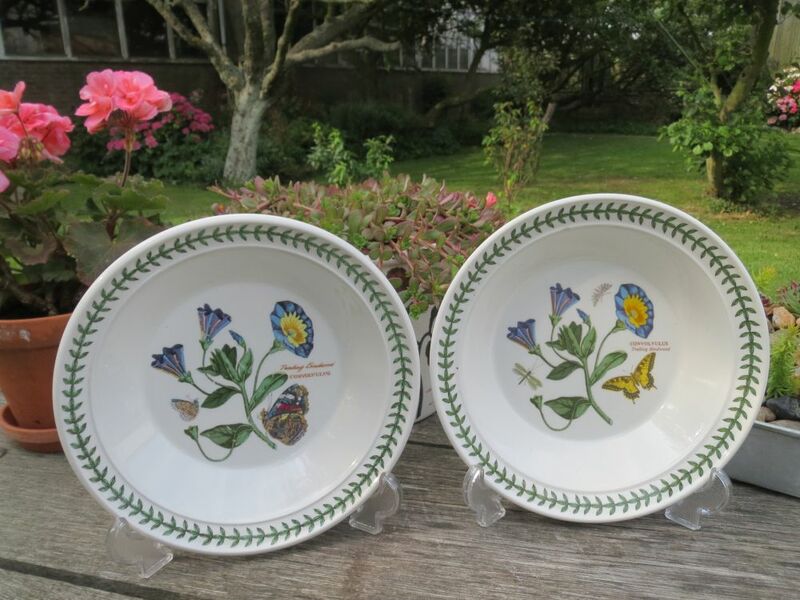 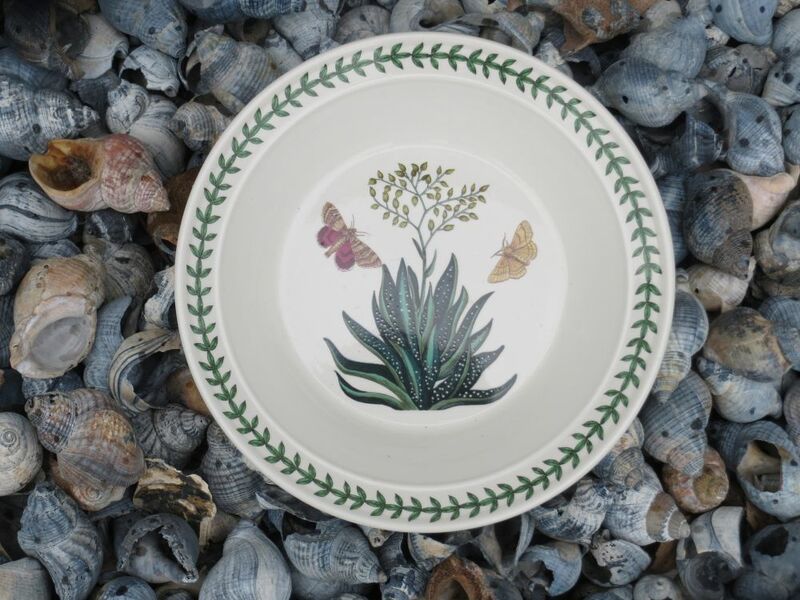 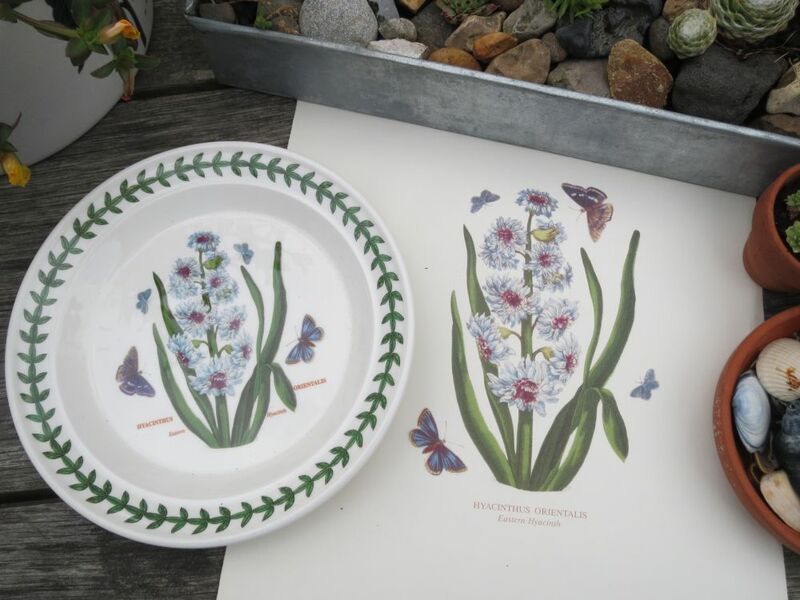 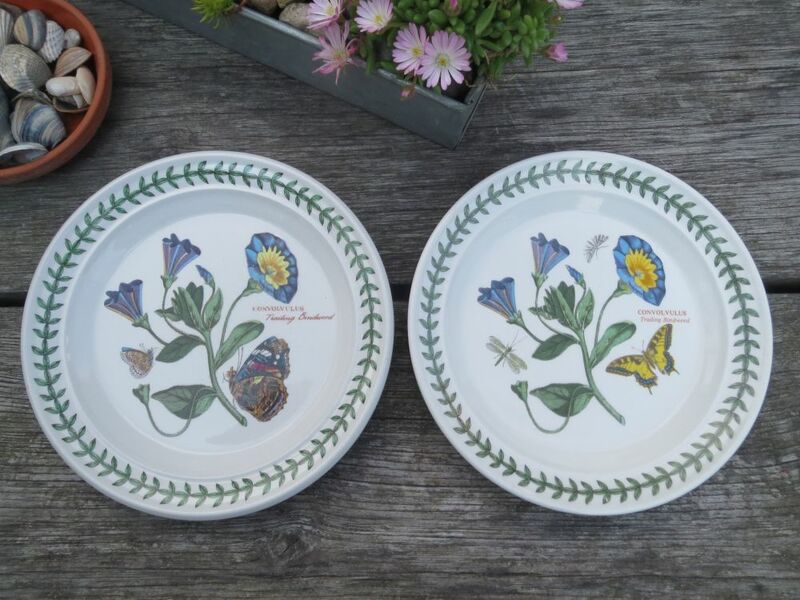 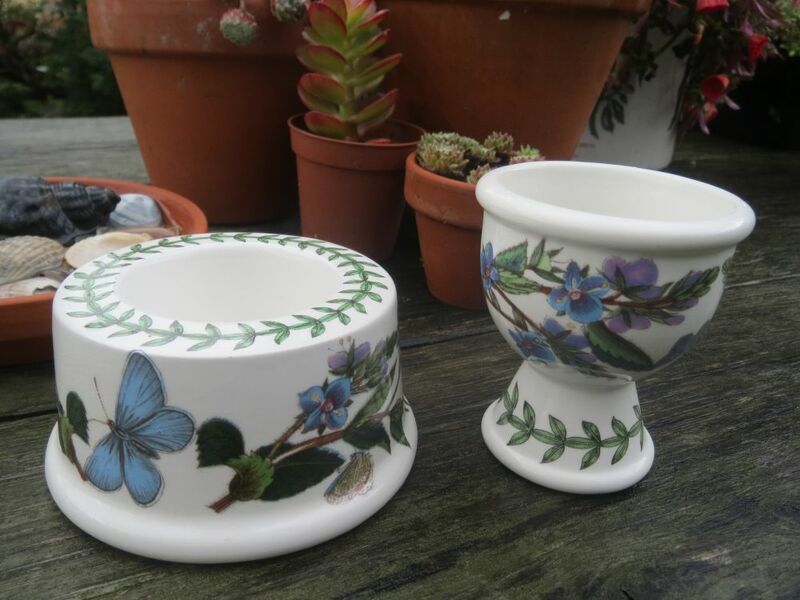 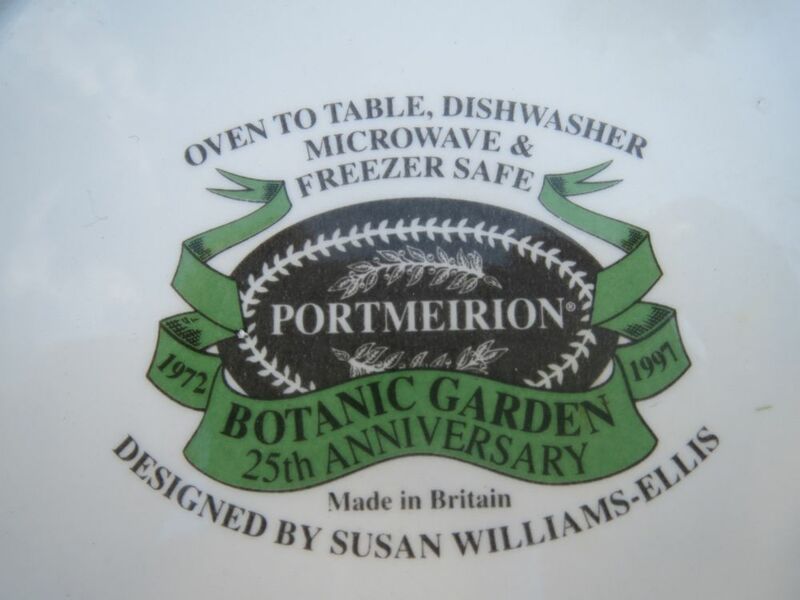 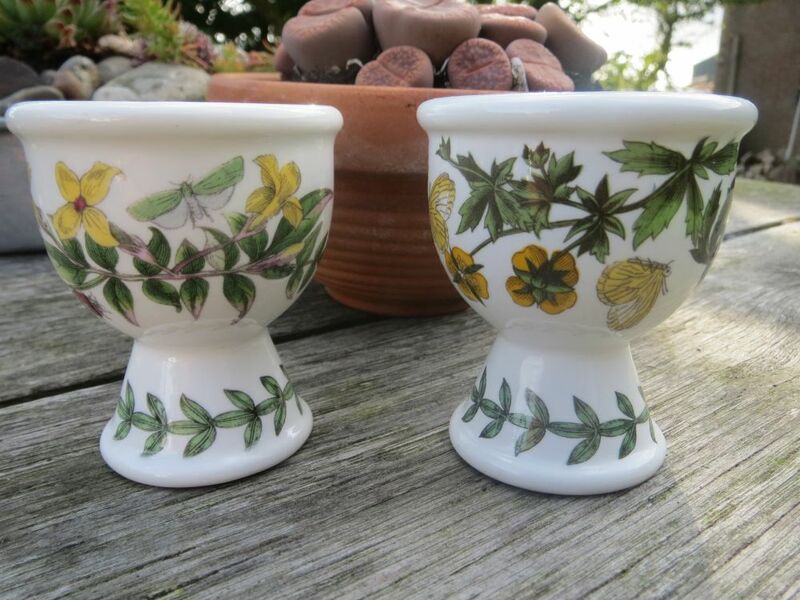 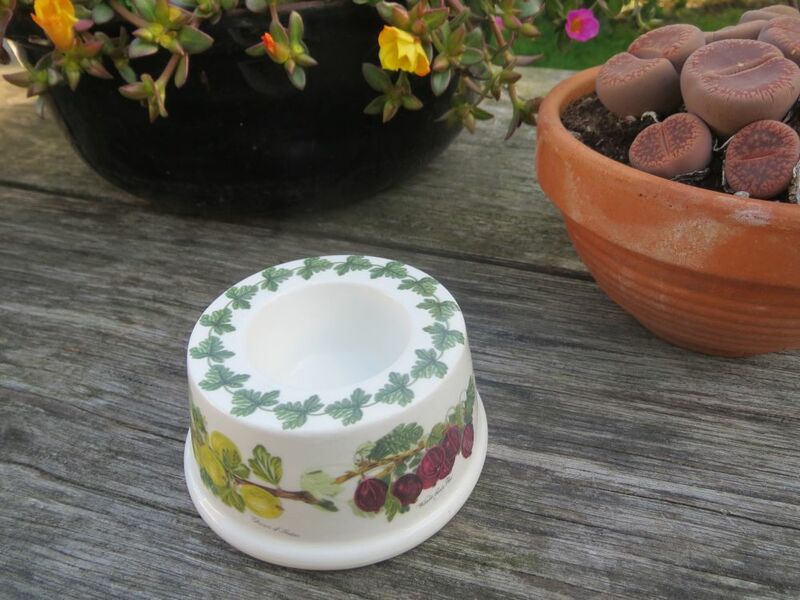 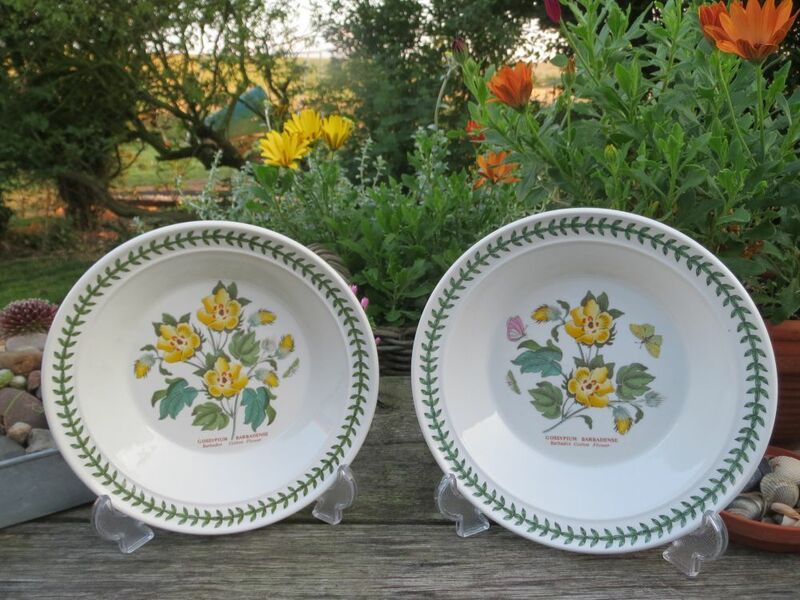 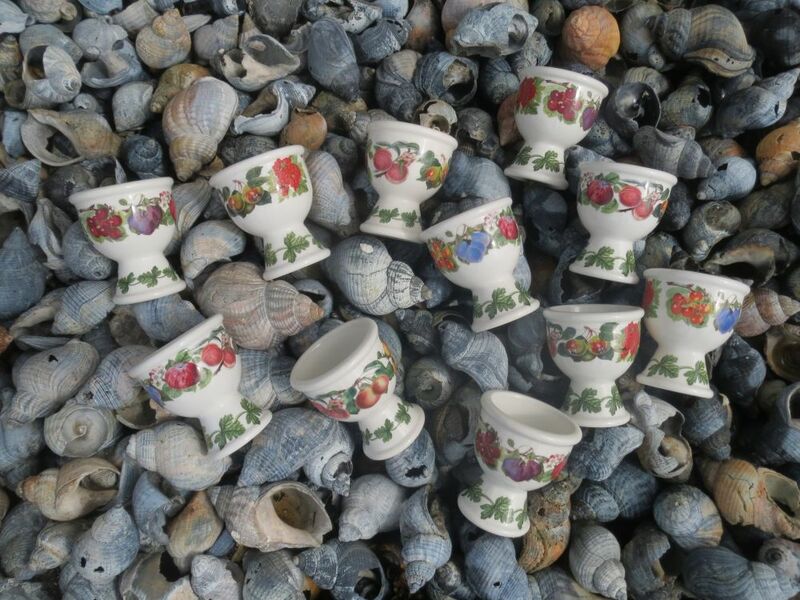 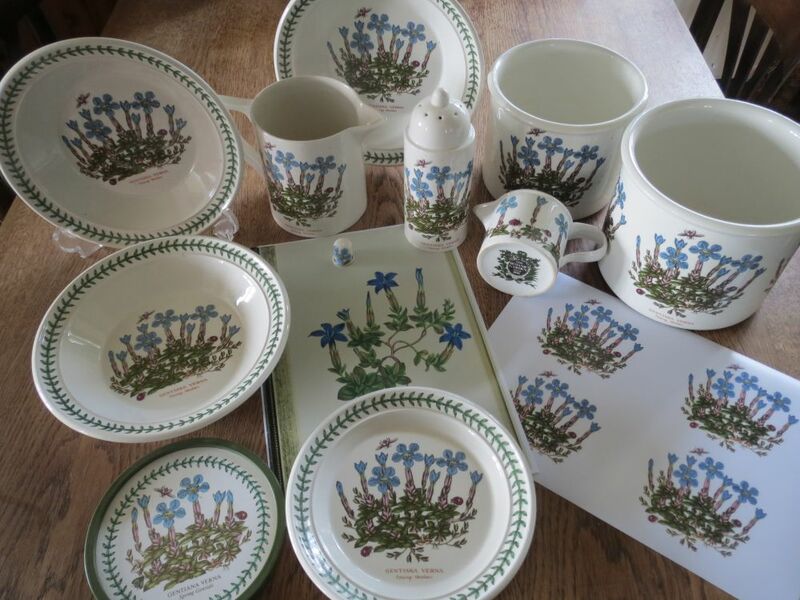 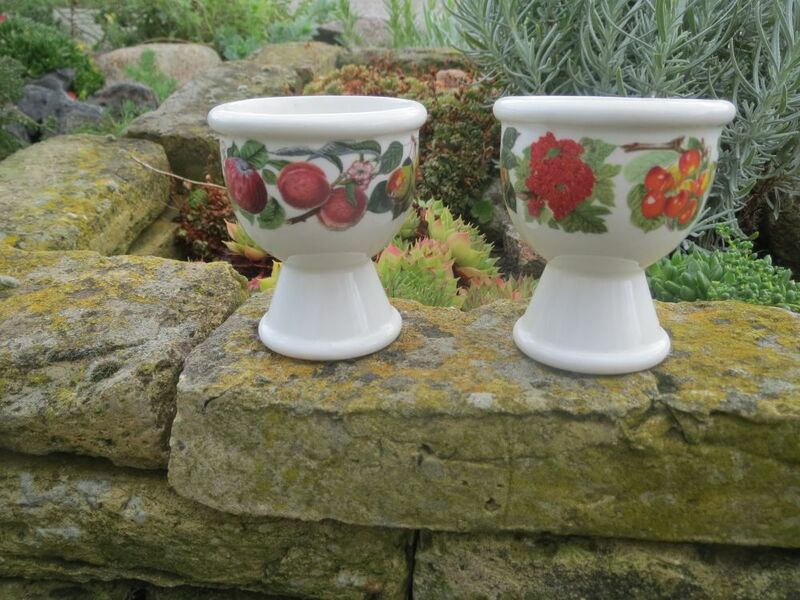 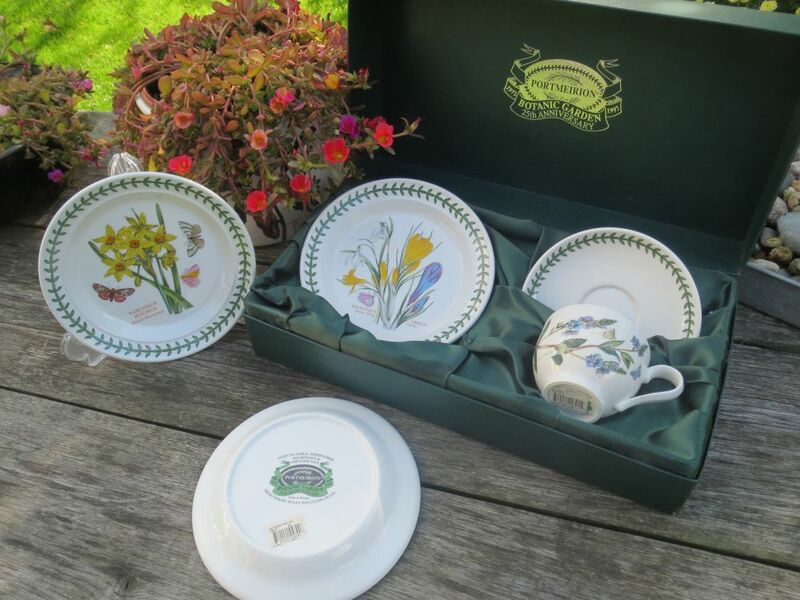 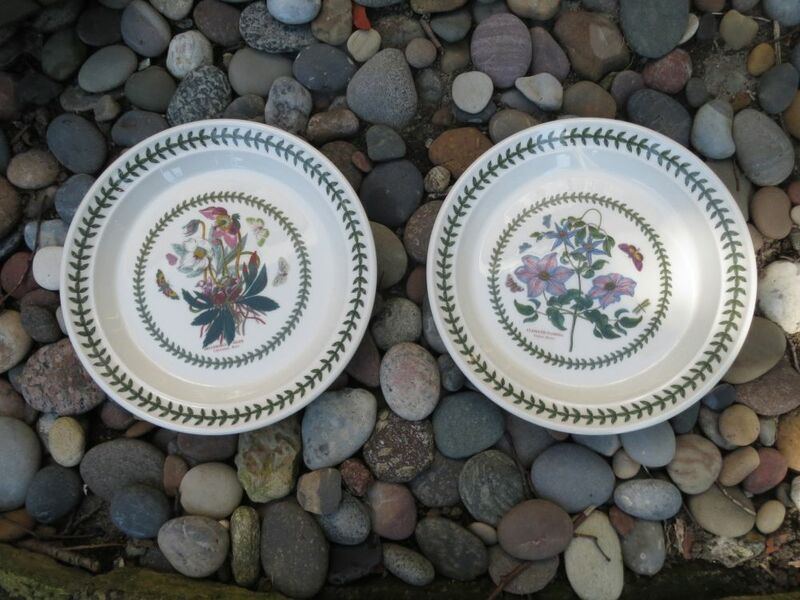 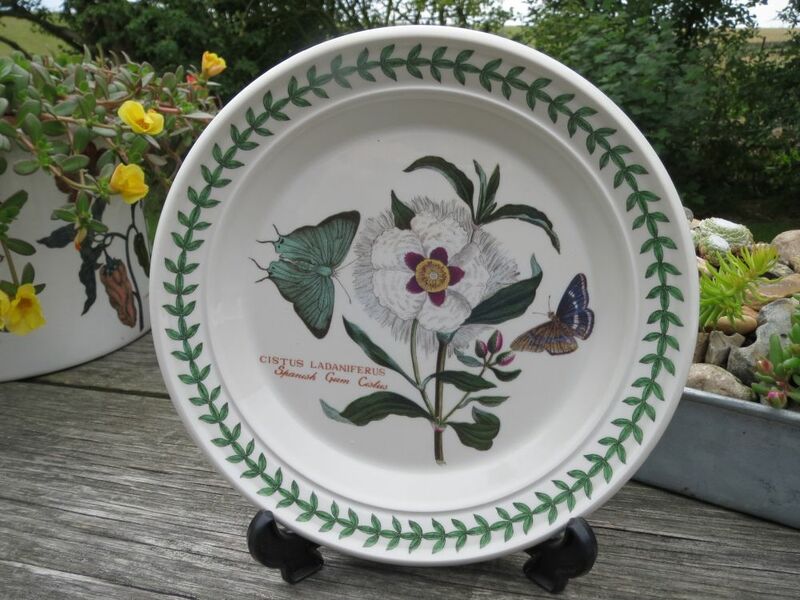 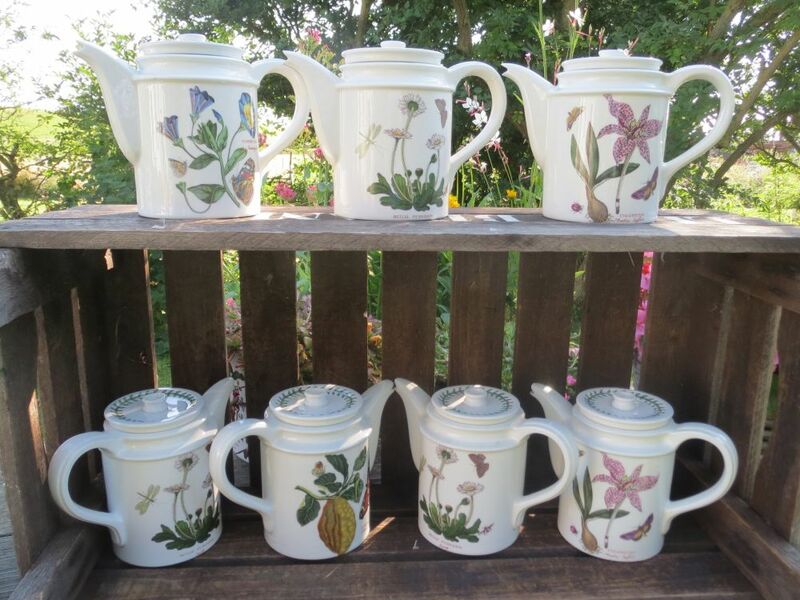 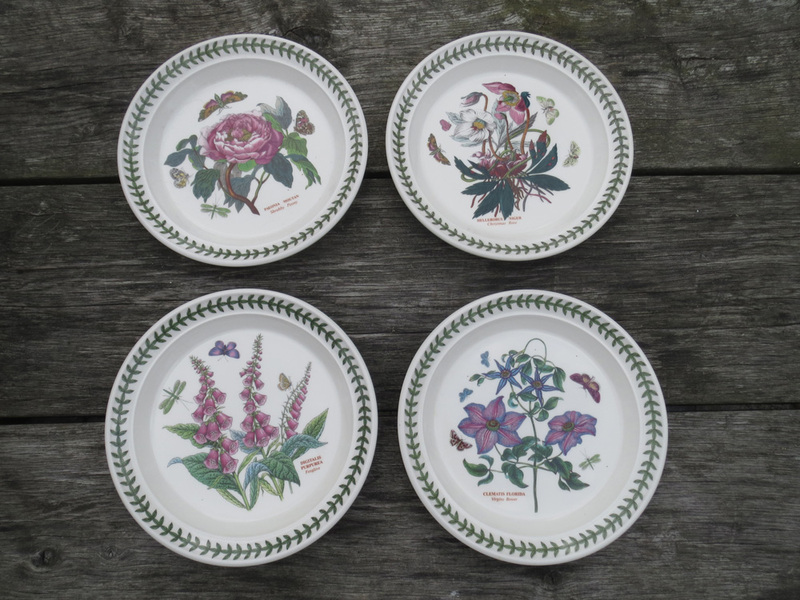 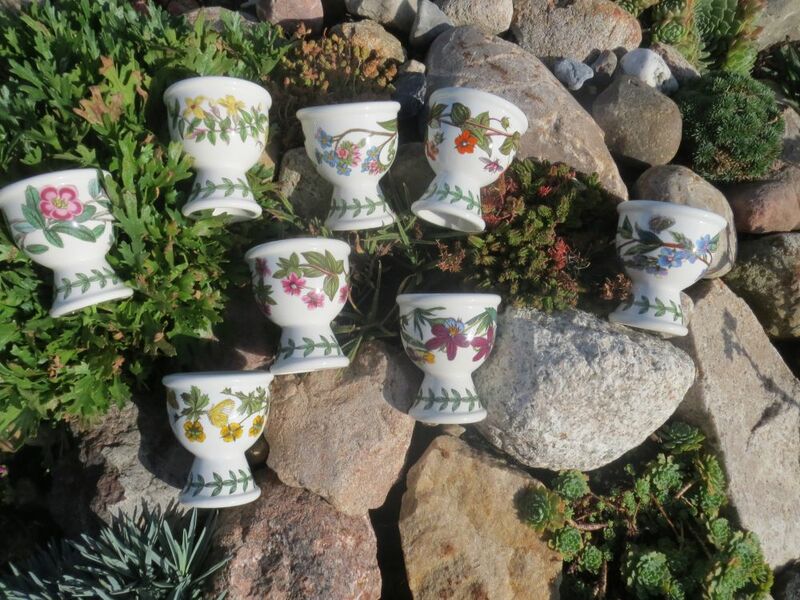 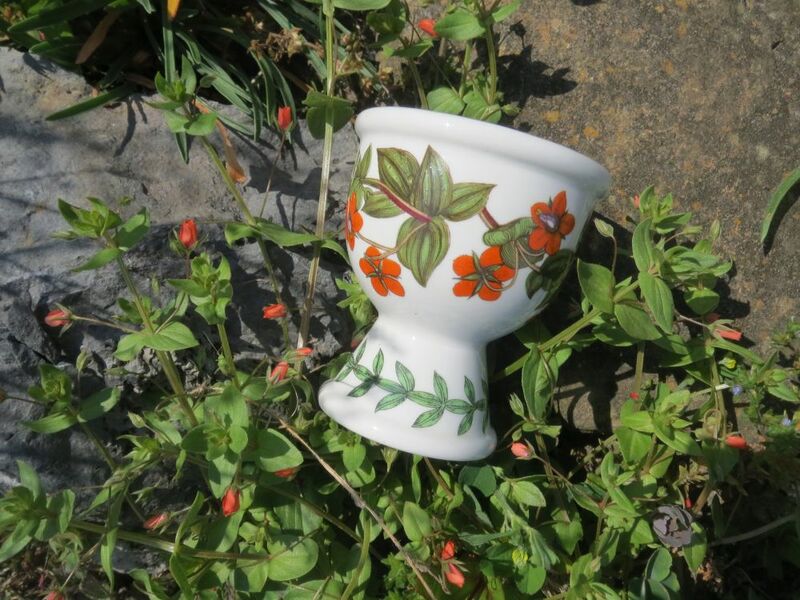 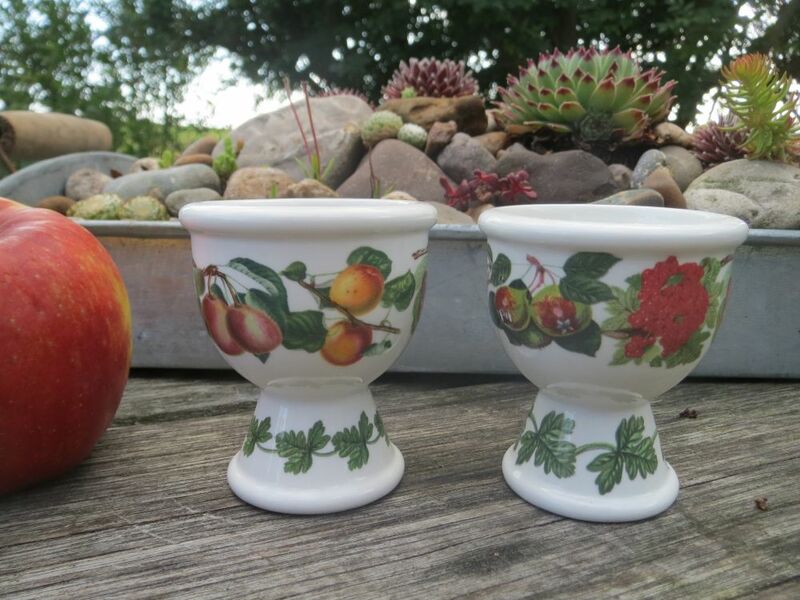 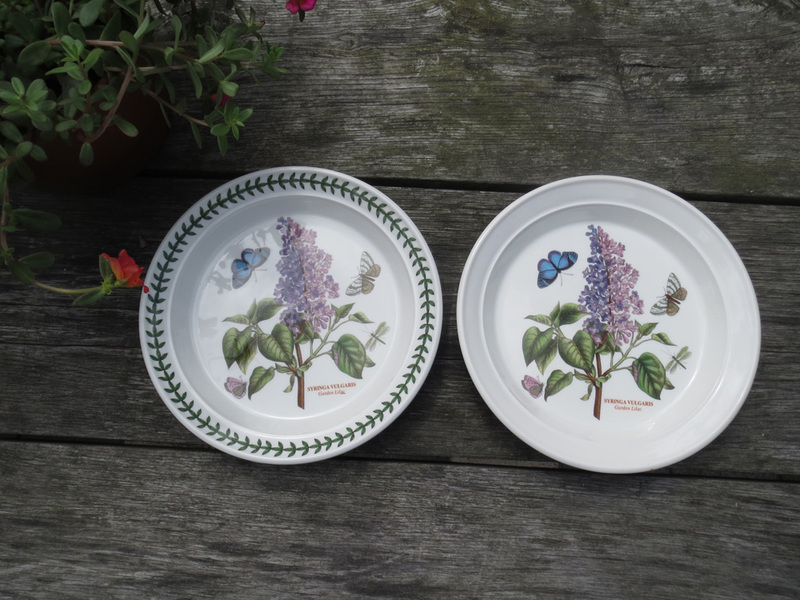 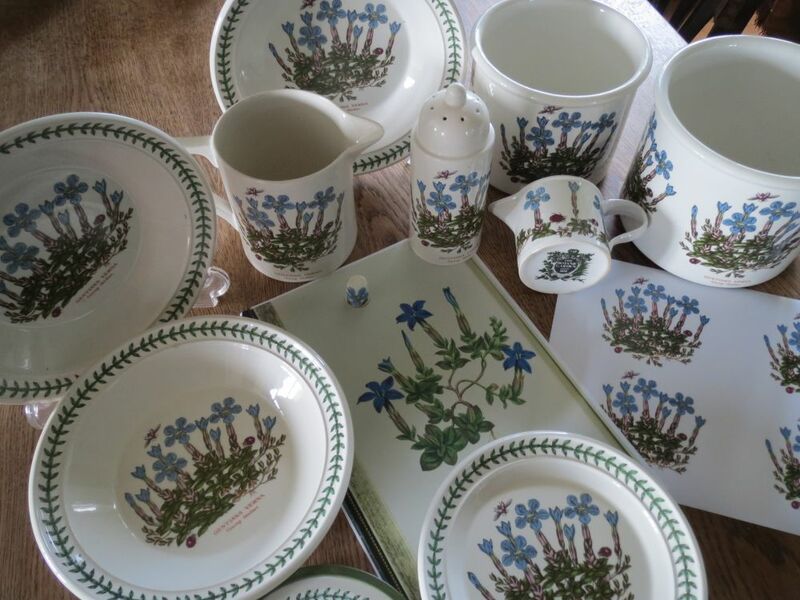 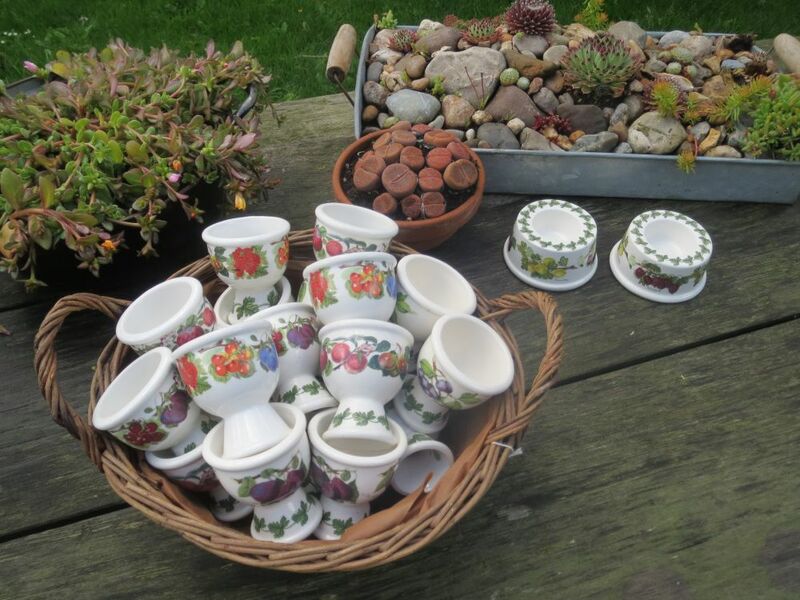 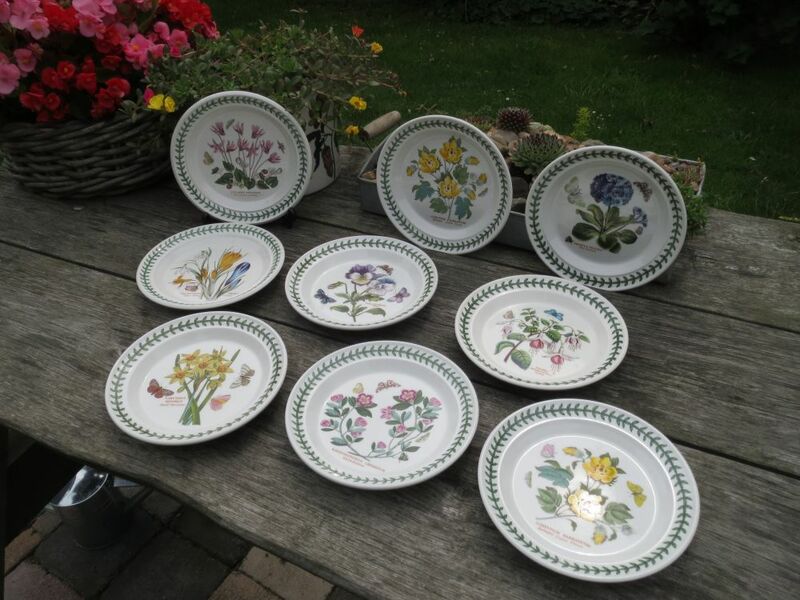 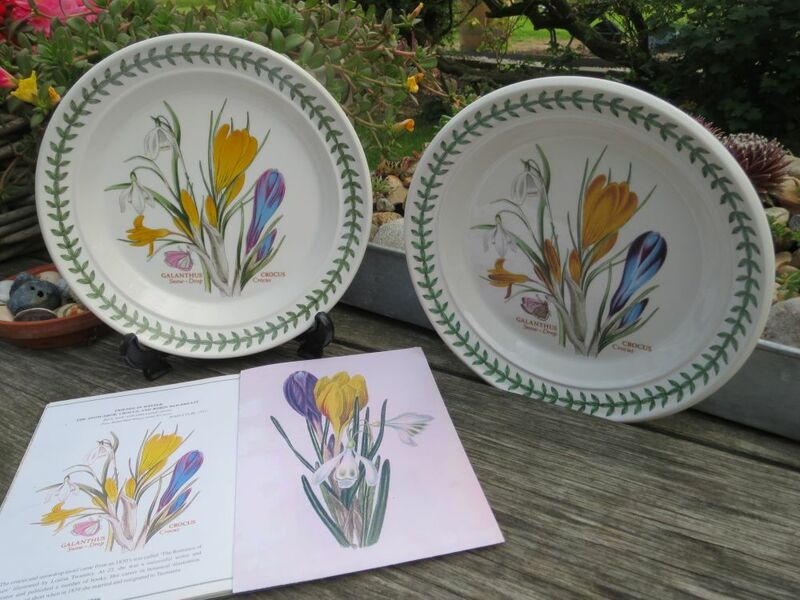 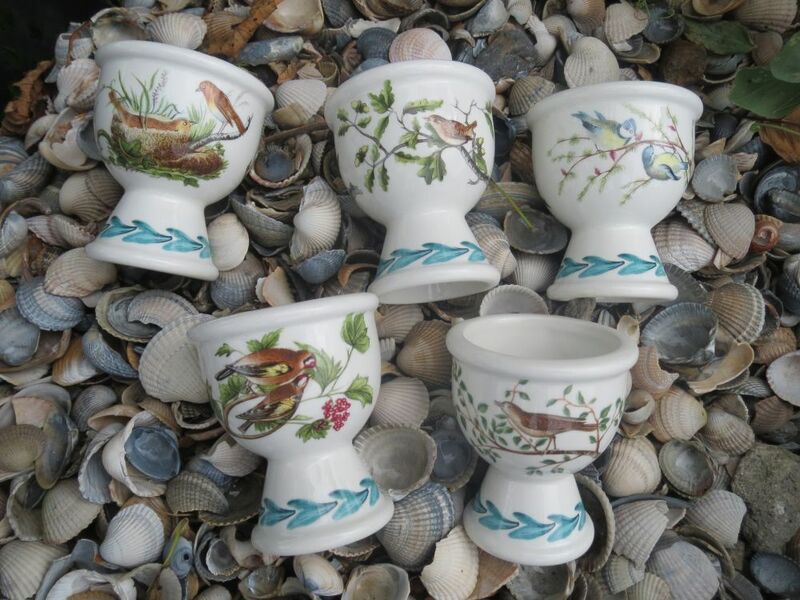 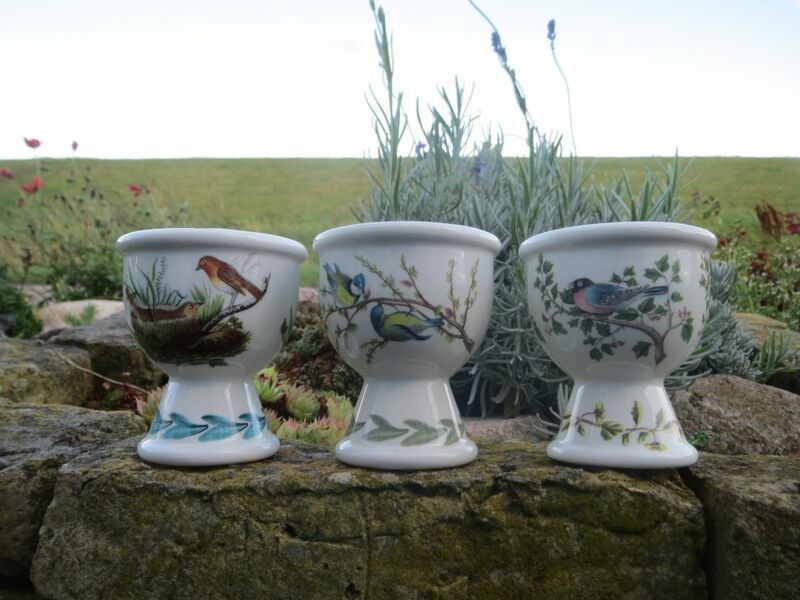 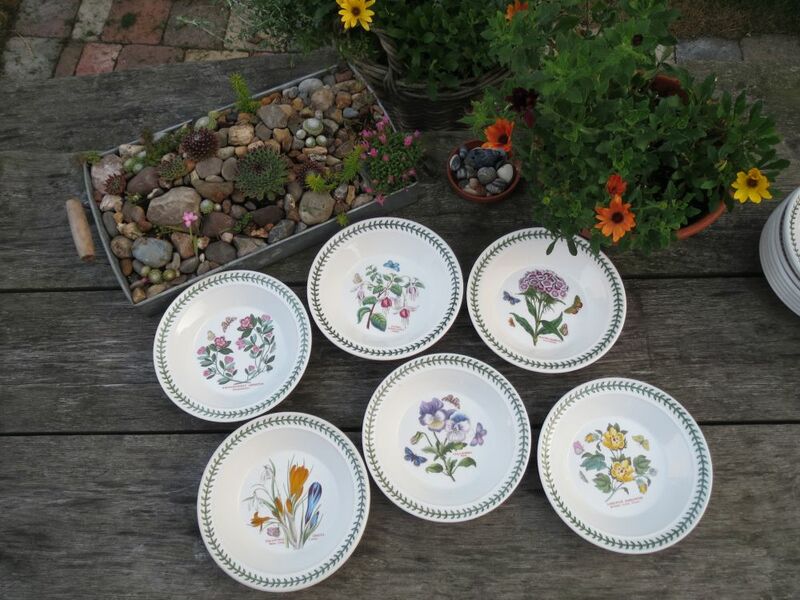 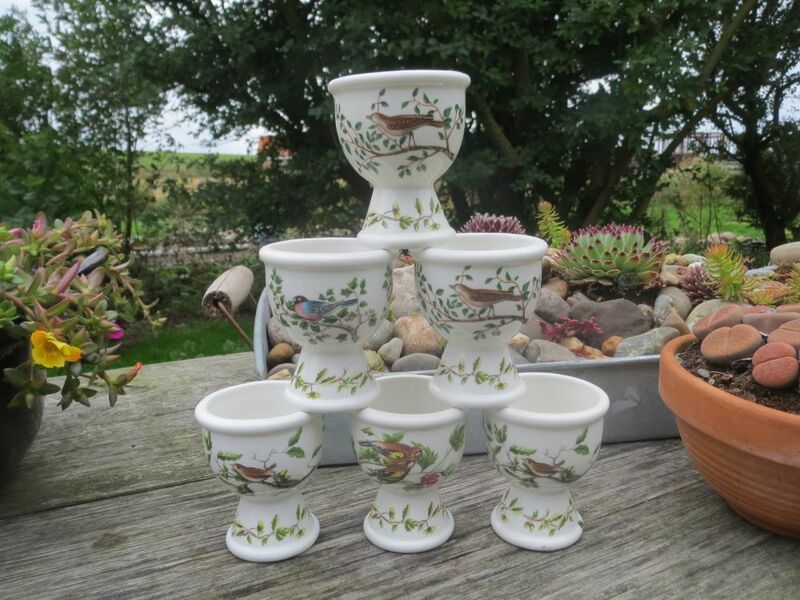 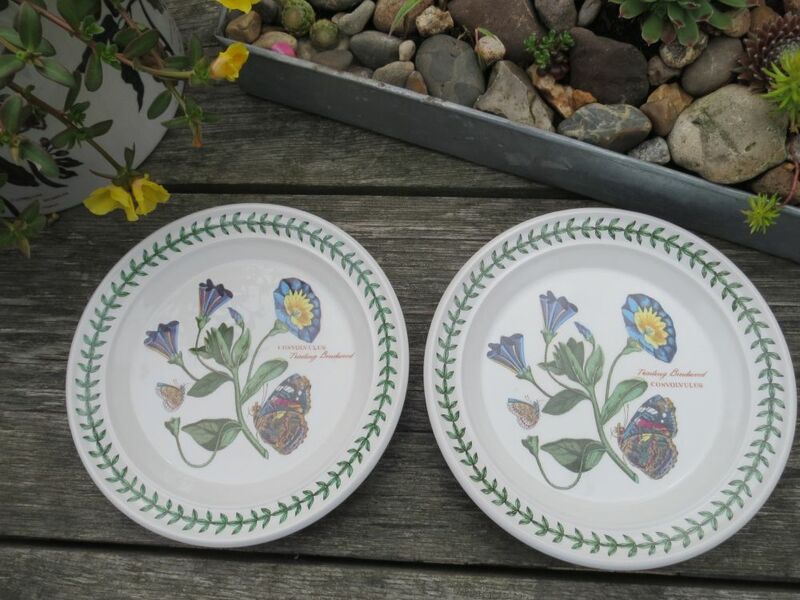 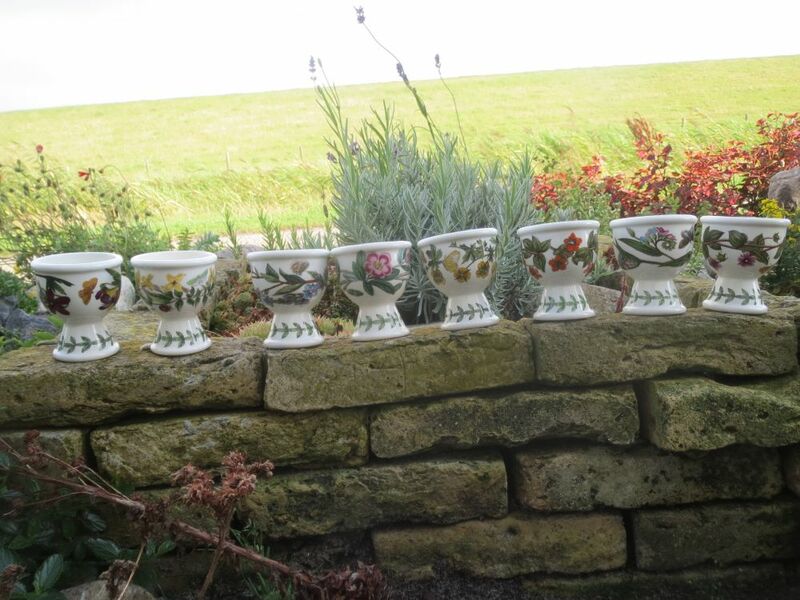 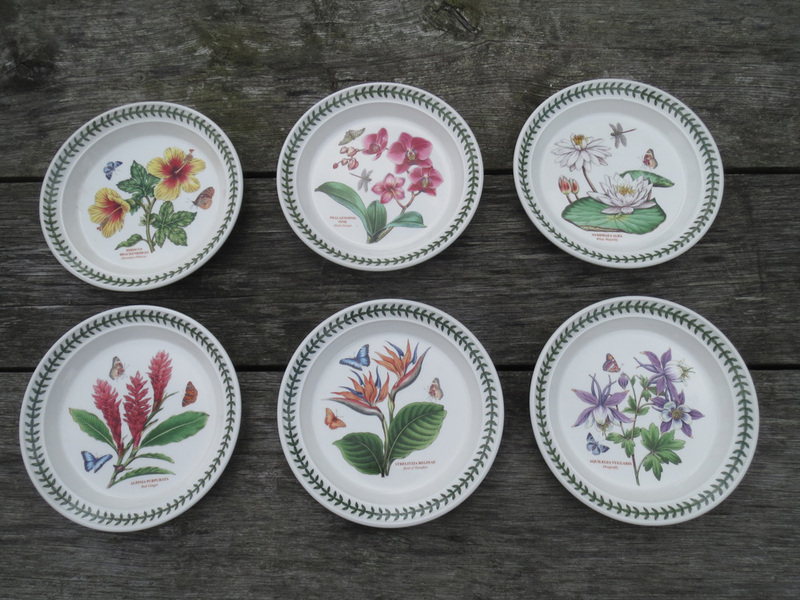 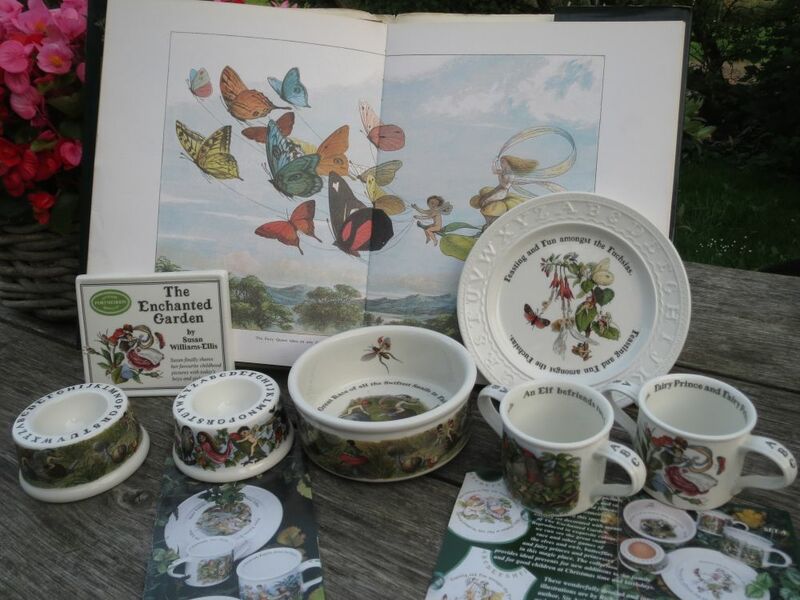 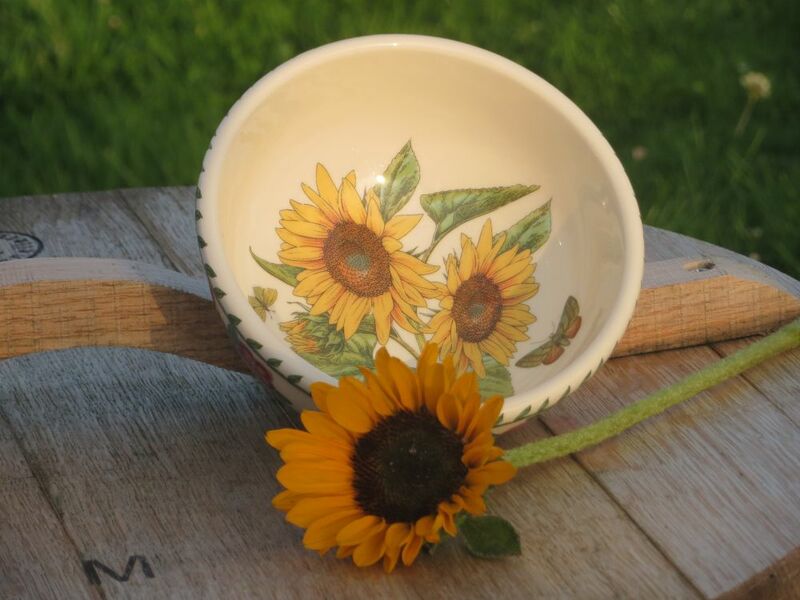 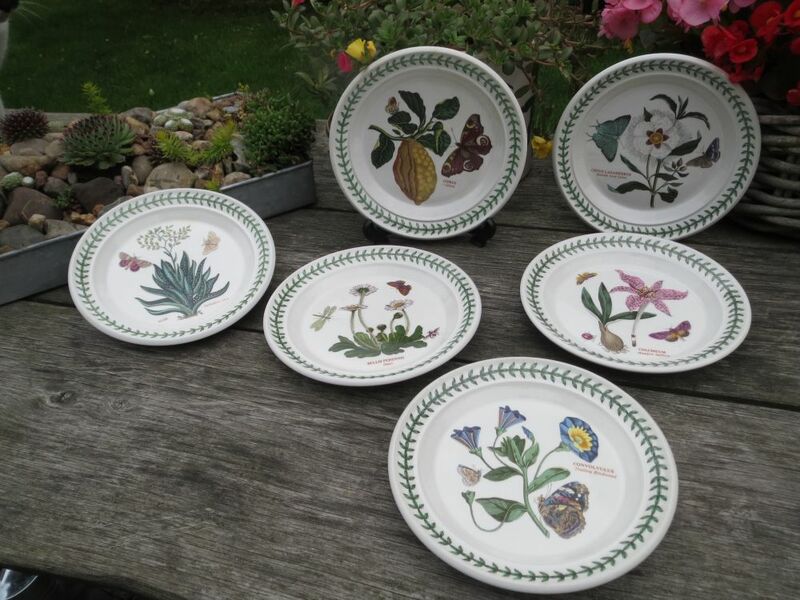 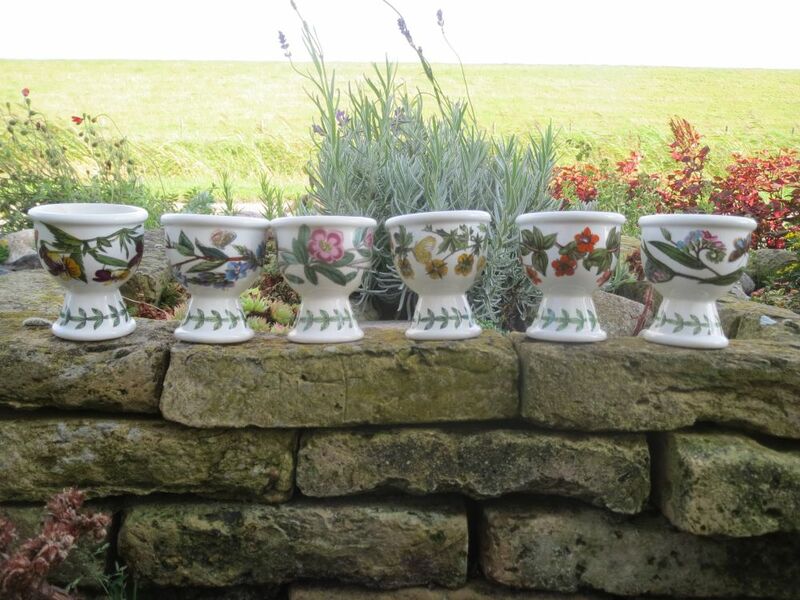 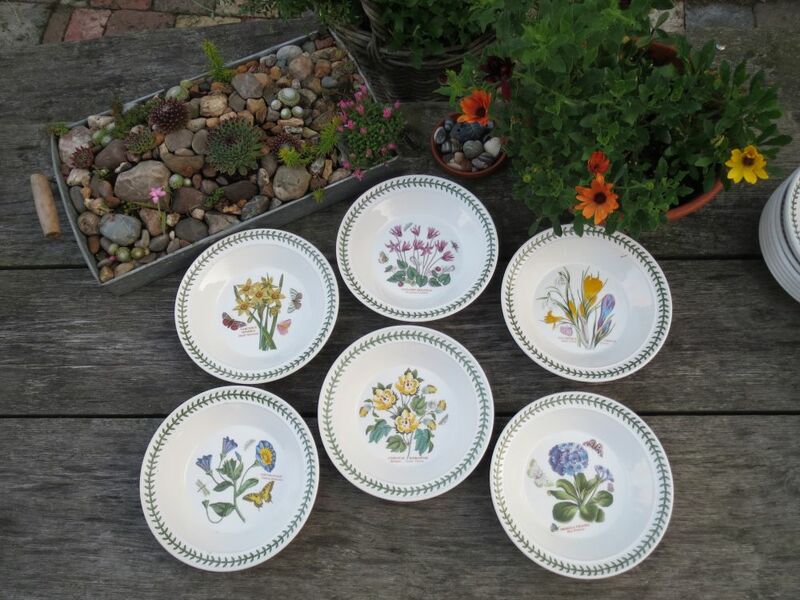 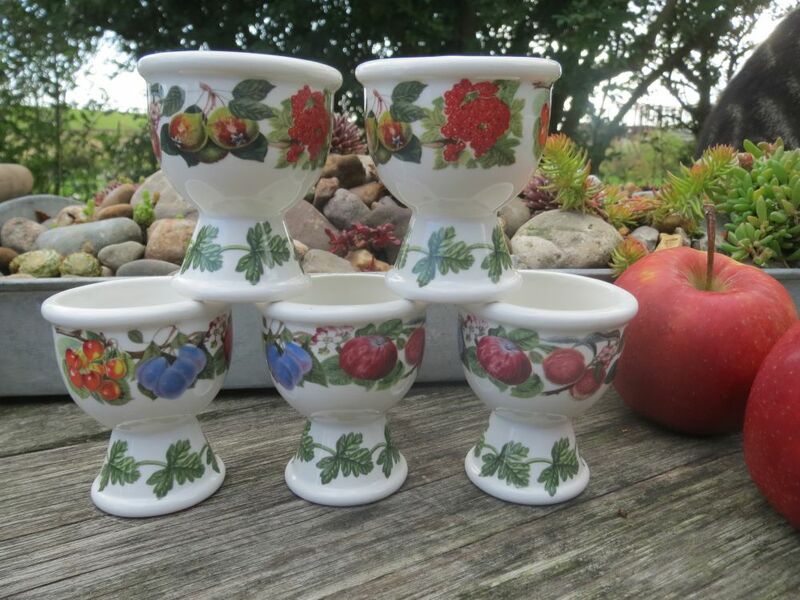 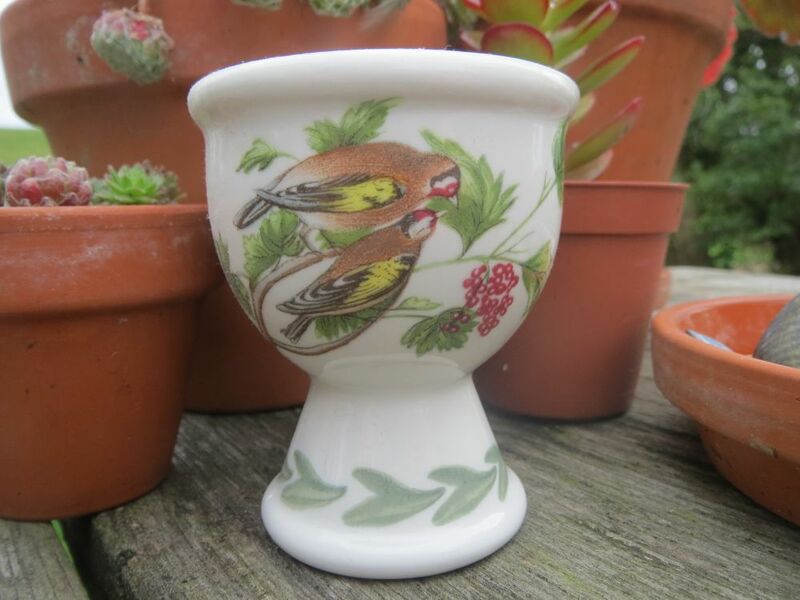 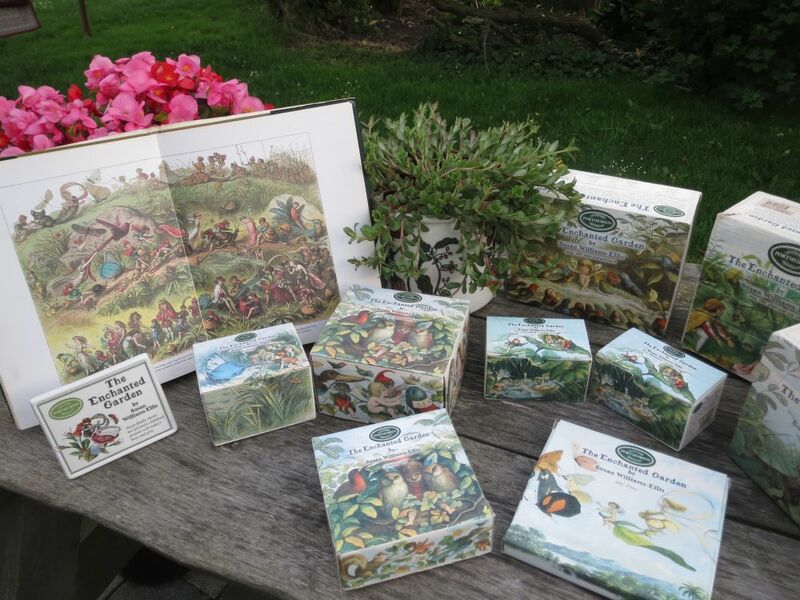 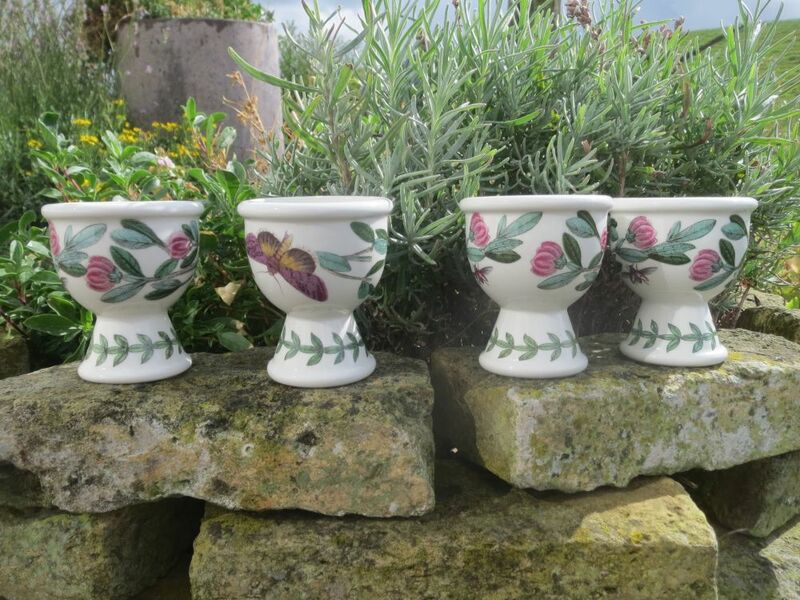 The original six footed egg cups in the Botanic Garden range were: Heartsease, Speedwell, Rhododendron, Common Tomentil, Scarlet Pimpernel and Forget-me-Not. 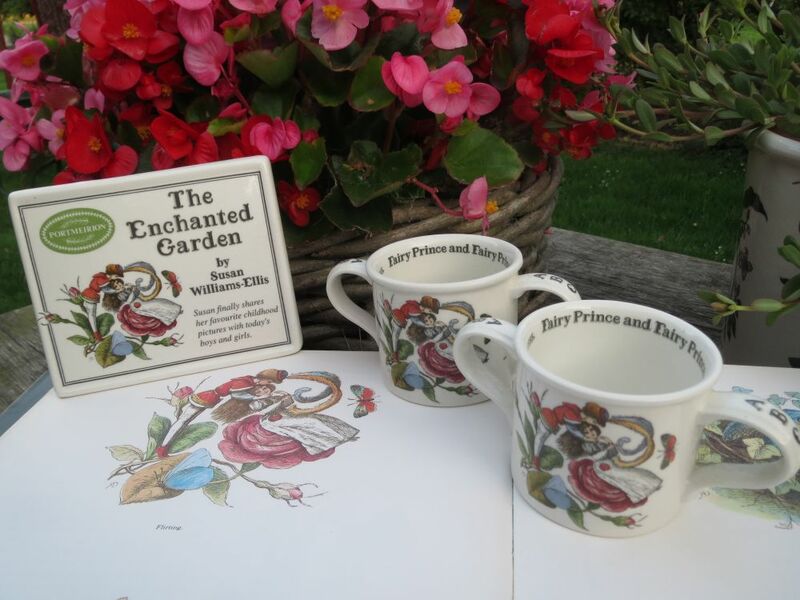 The Scarlet Pimpernel occurs in various shades of red. 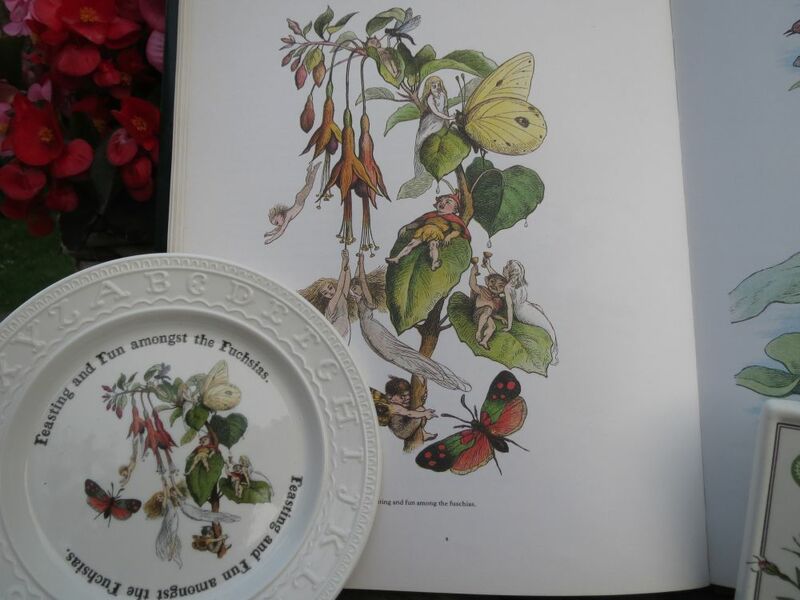 The Common Tomentil was later replaced by the Yellow Jasmin. 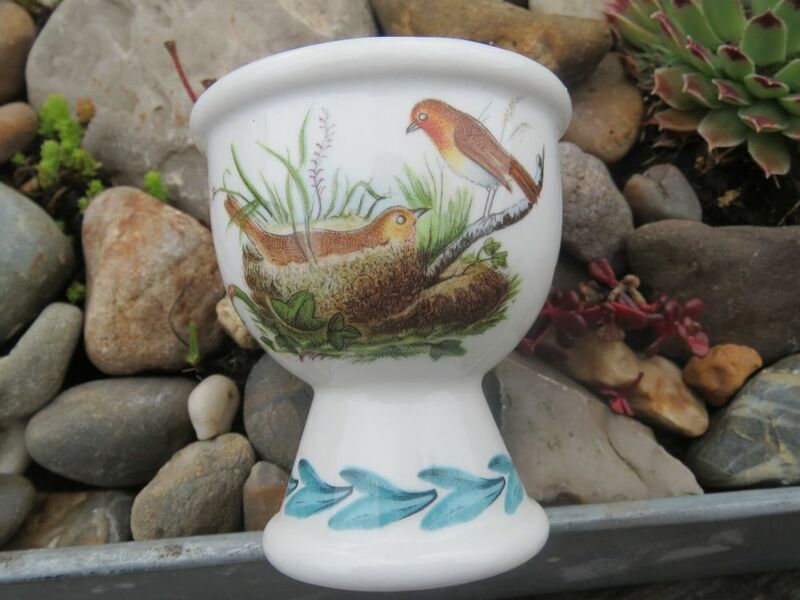 There are six different birds on the eggcups. 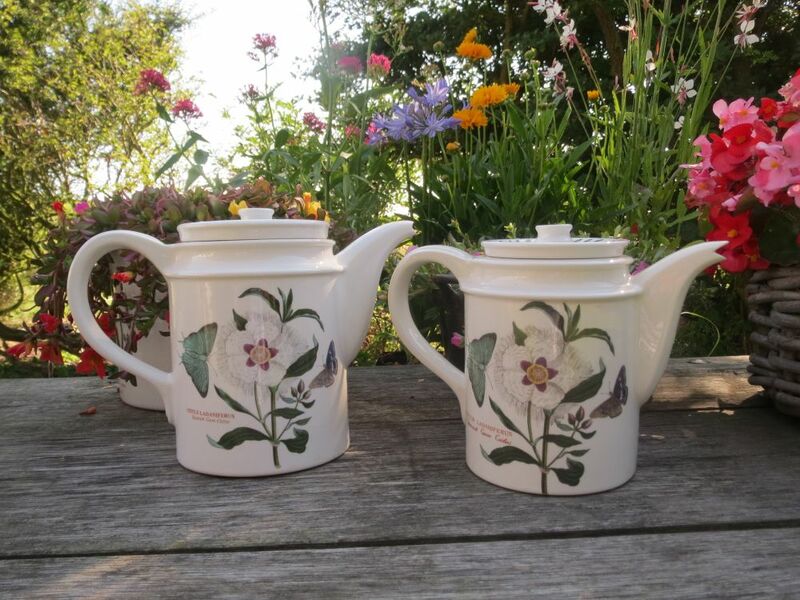 There were two sizes in the tea pots, a 7 inch pot containing 2.25 pints and a smaller 6 inch pot containing 1.5 pints. 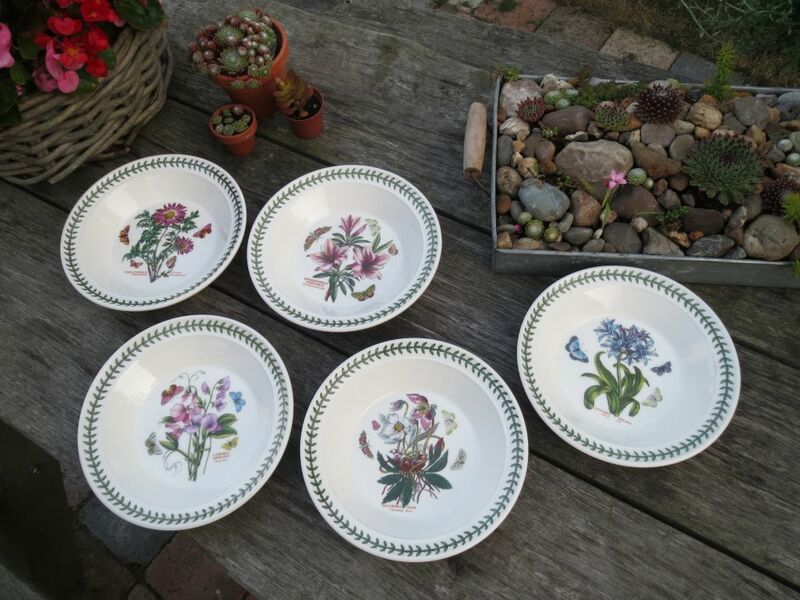 Here are the Rhododendron, the Barbados Cotton Flower, the Ivy Leafed Cyclamen and the Snow-drop and Crocus, all the larger size. 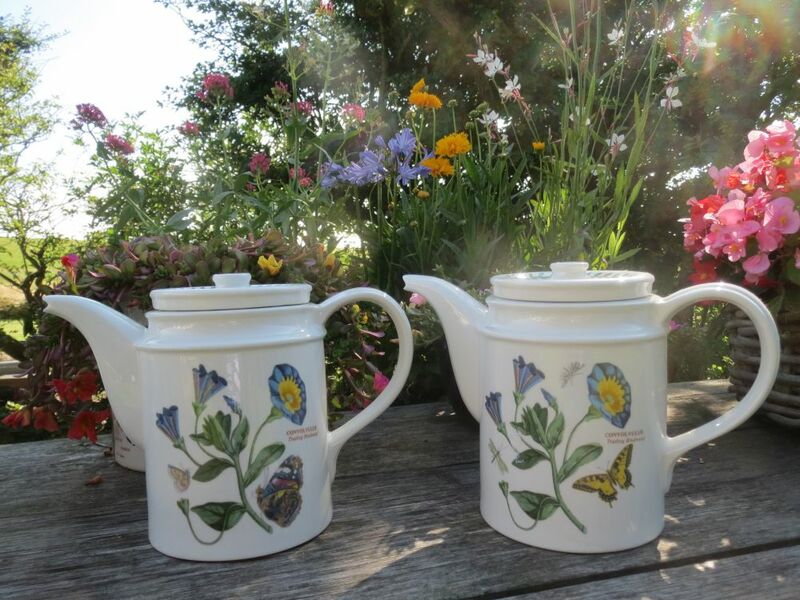 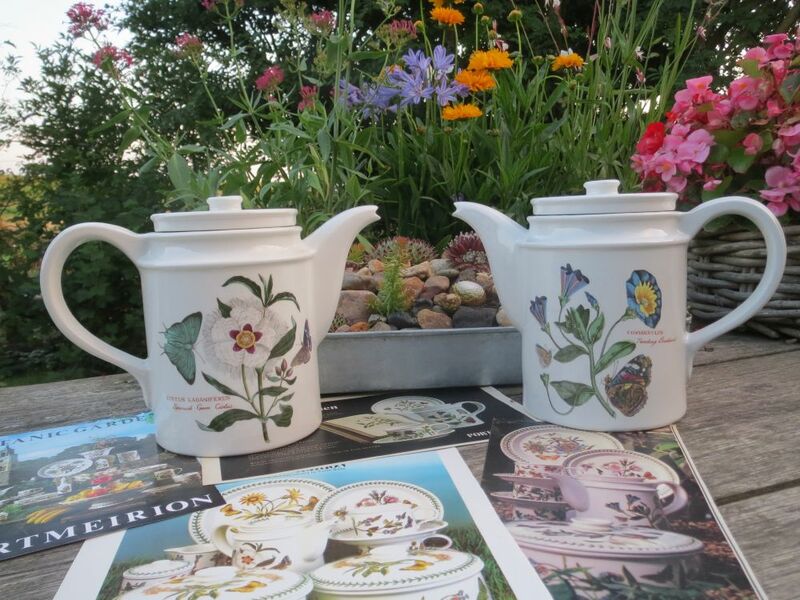 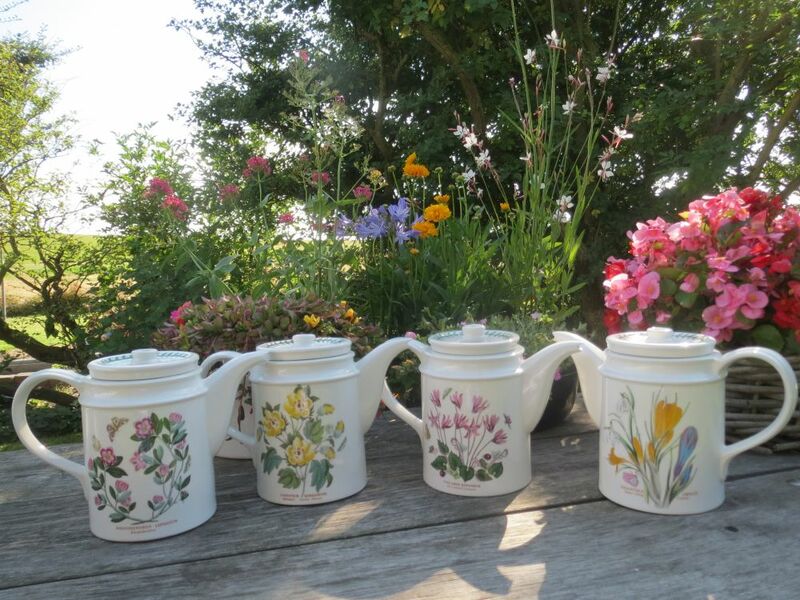 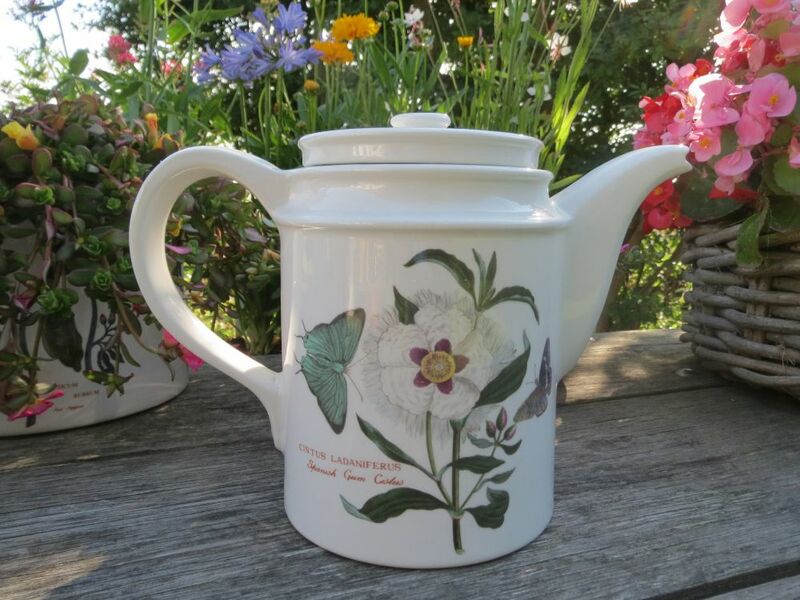 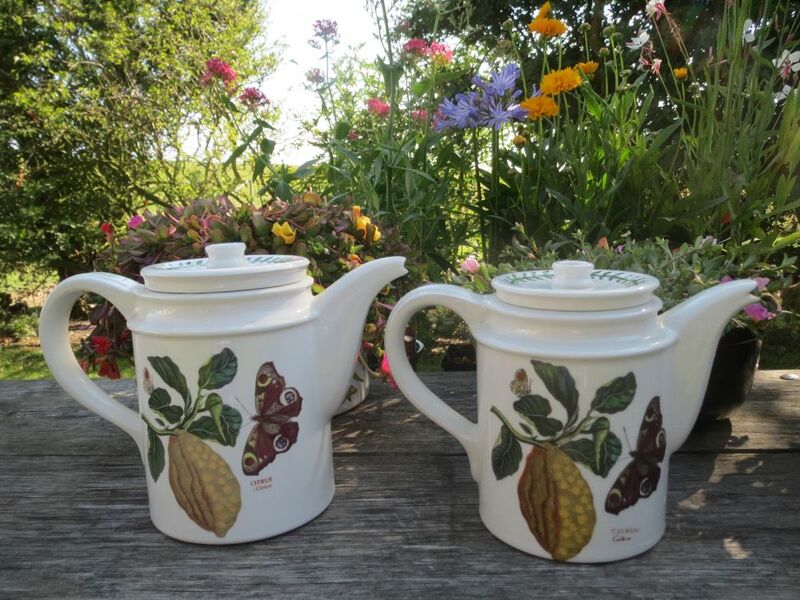 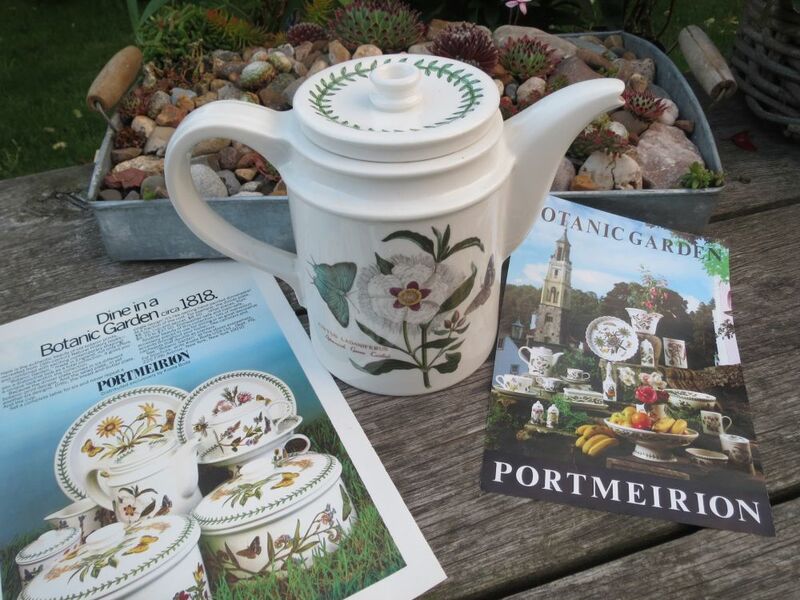 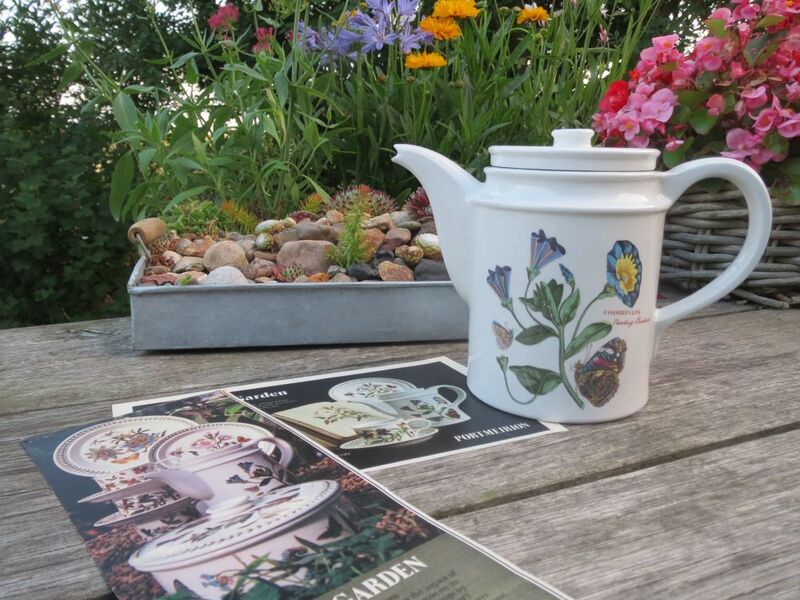 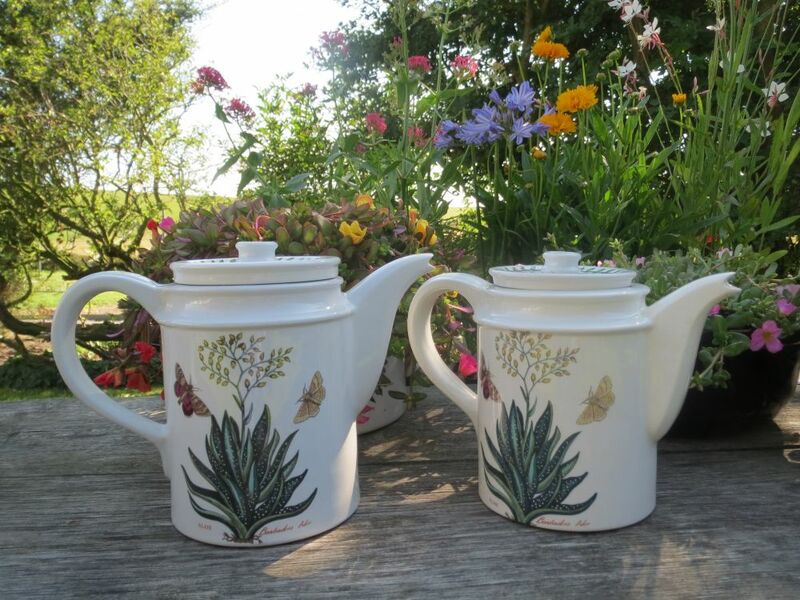 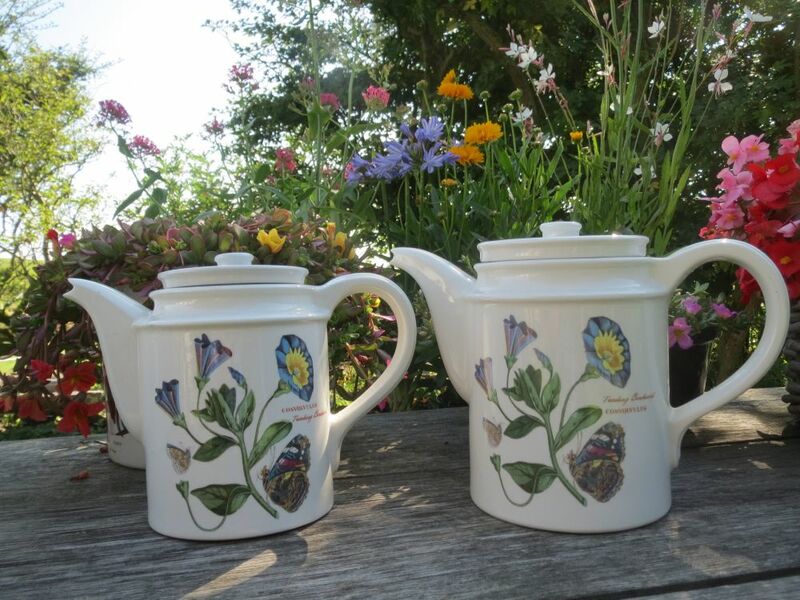 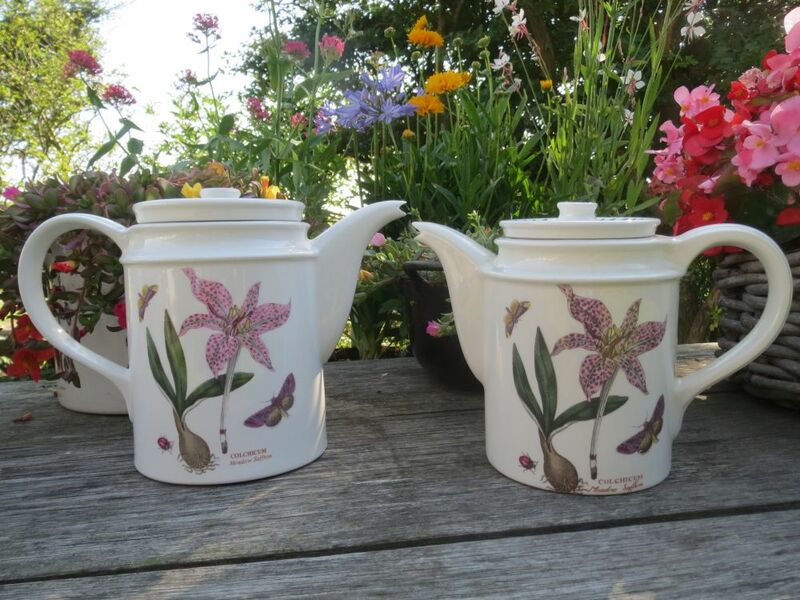 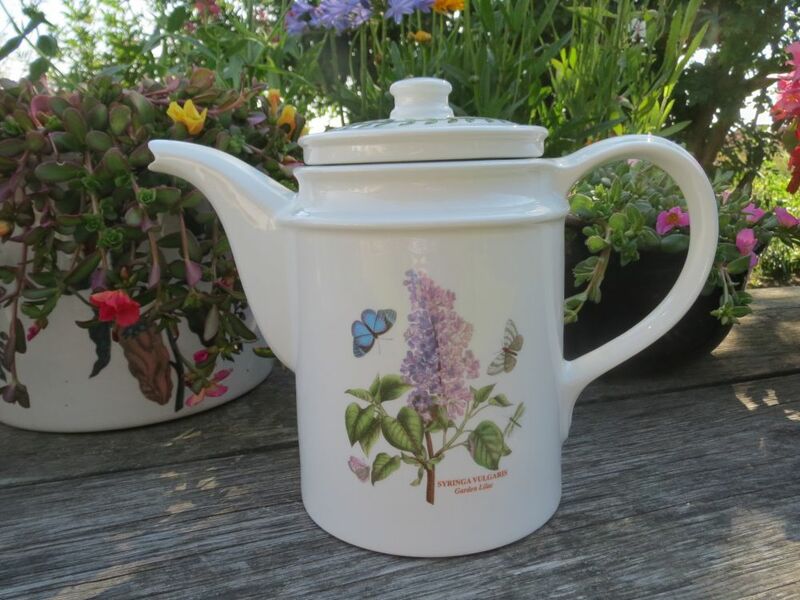 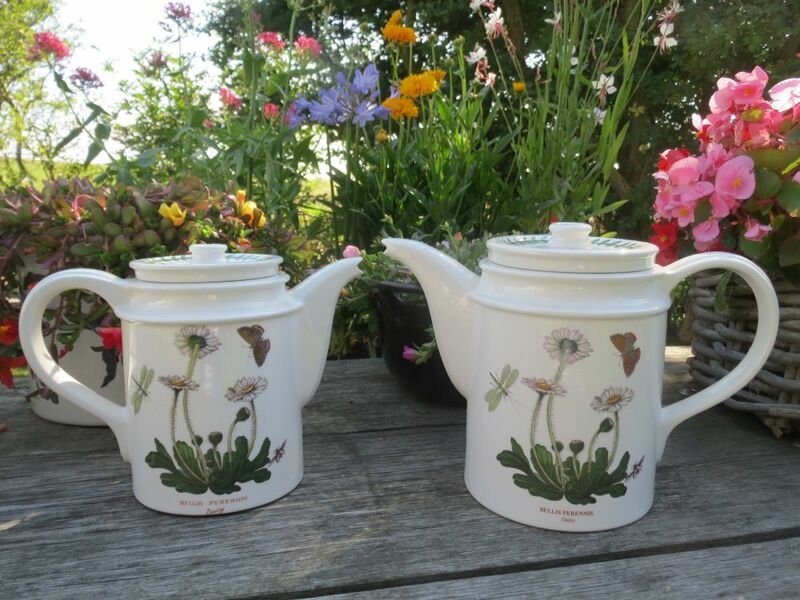 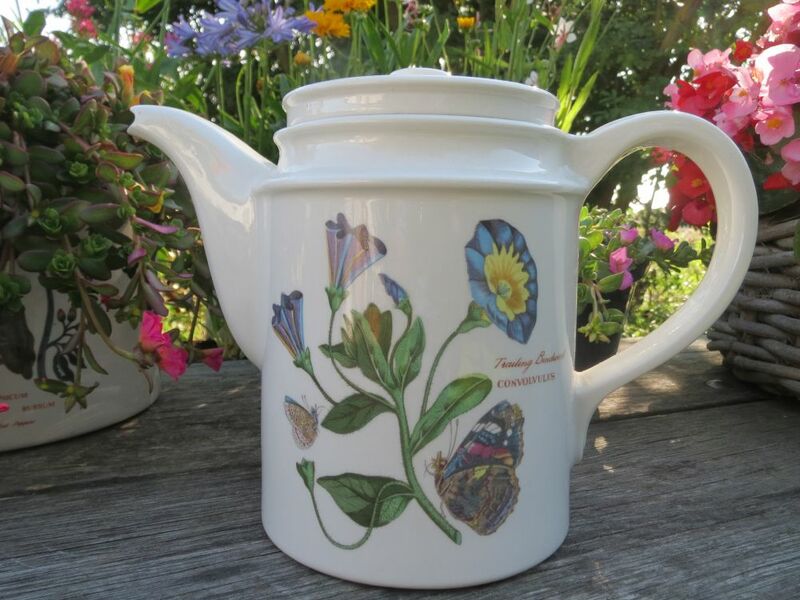 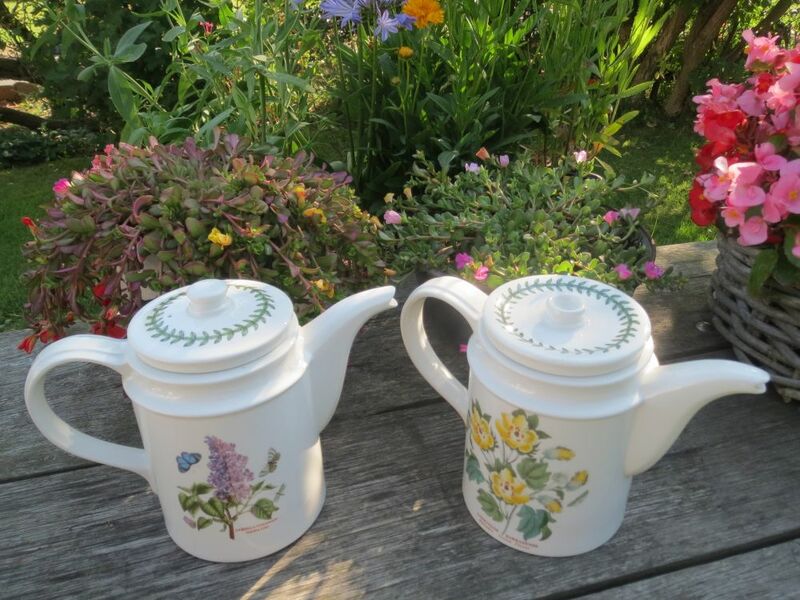 There is one tea pot I would really like to add to my collection, the one with the Spring Gentian, but so far I have not managed to get one. 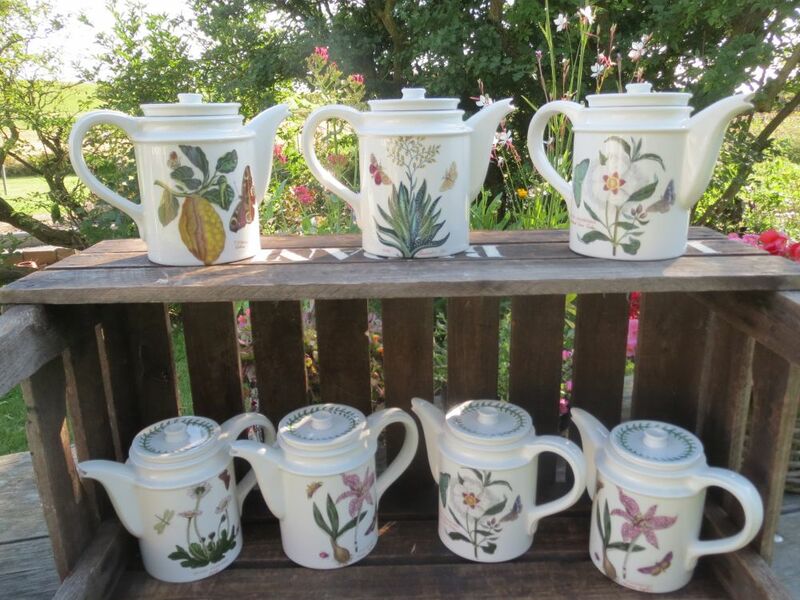 The Trailing Bindweed, the Citron, the Daisy, the Spanish Gum Cistus, the Meadow Saffron and the Barbados Aloe. 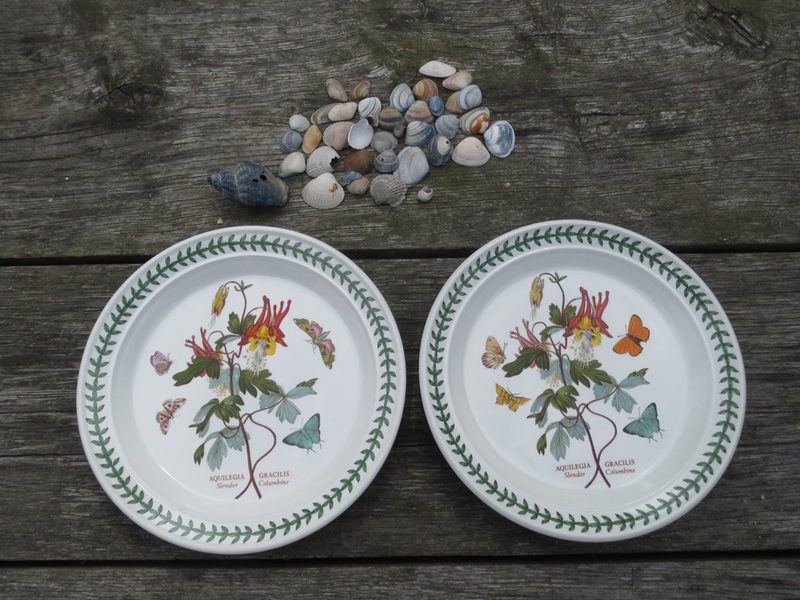 The Trailing Bindweed here with the many-coloured butterfly. 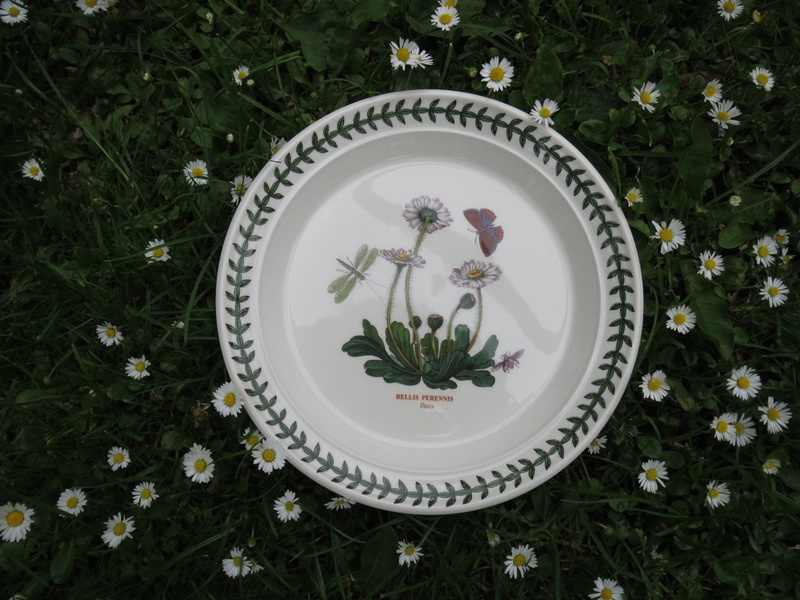 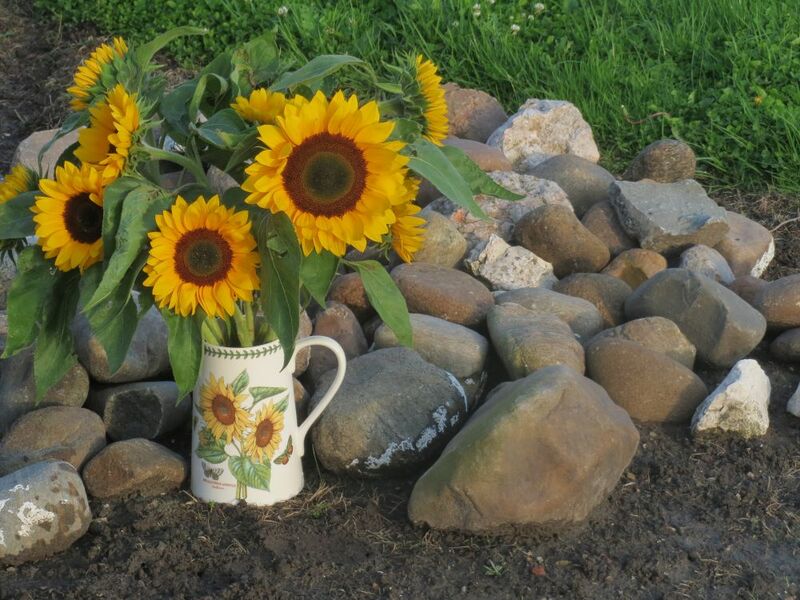 The Daisy, simple and beautiful, an original motif that is available in Botanic Garden to the present day. 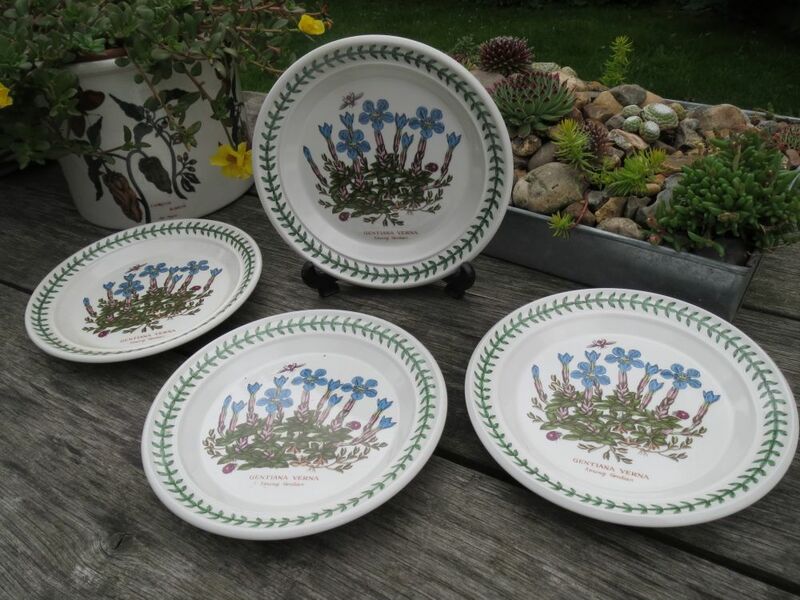 The Small Narcissus, the Ivy Leafed Cyclamen, Snow-Drop and Crocus, the Trailing Bindweed (new version), the Barbados Cotton Flower and the Blue Primrose. 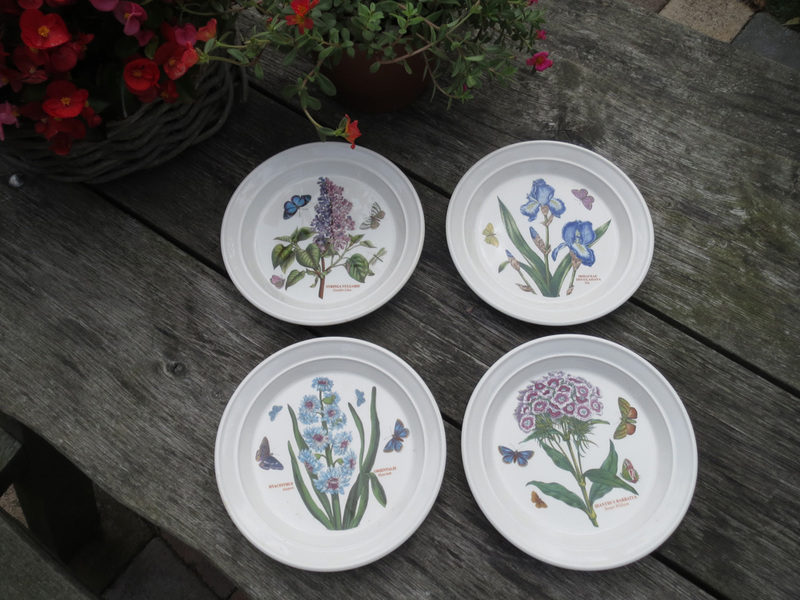 The Rhododendron, the Fuchsia, the Sweet William, Snow-Drop and Crocus (dark version), the Pansy and the Barbados Cotton Flower. 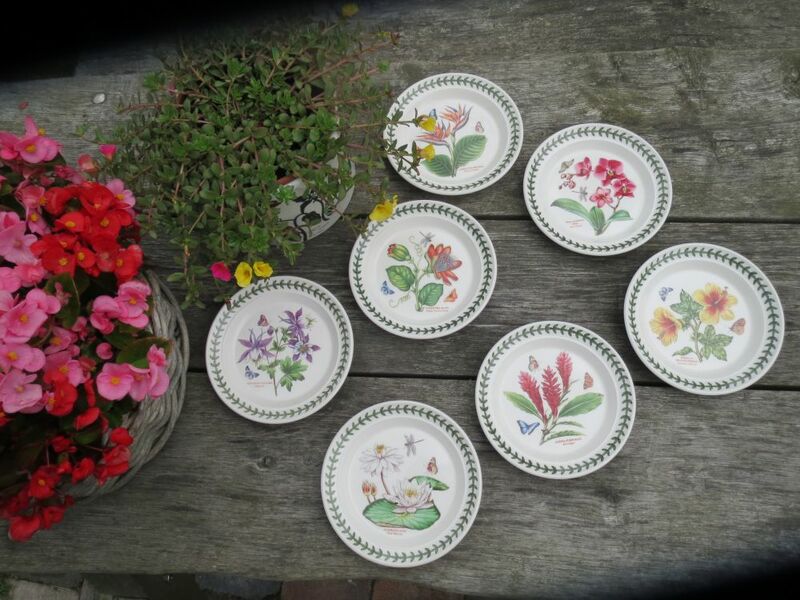 Here are the Flowered Chrysanthemum, the Lily Flowered Azalea, the Sweet Pea, the Christmas Rose and the Afican Lily. 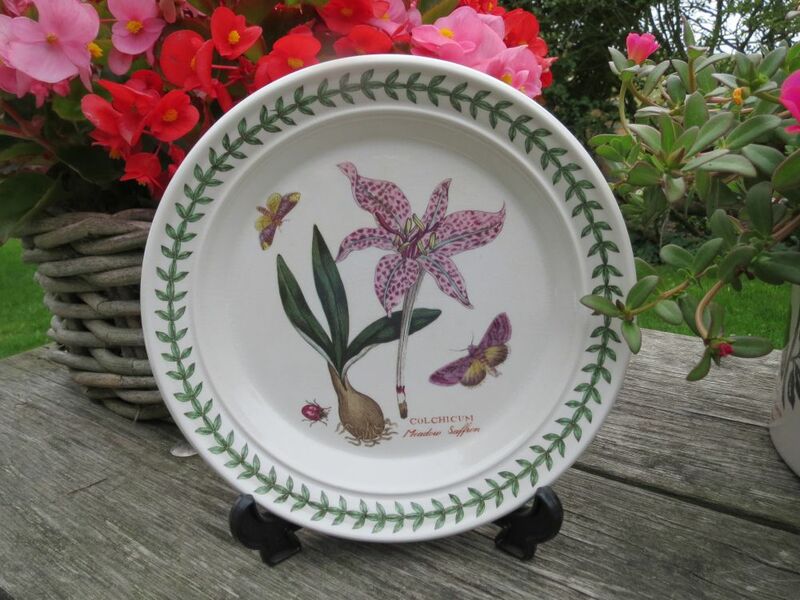 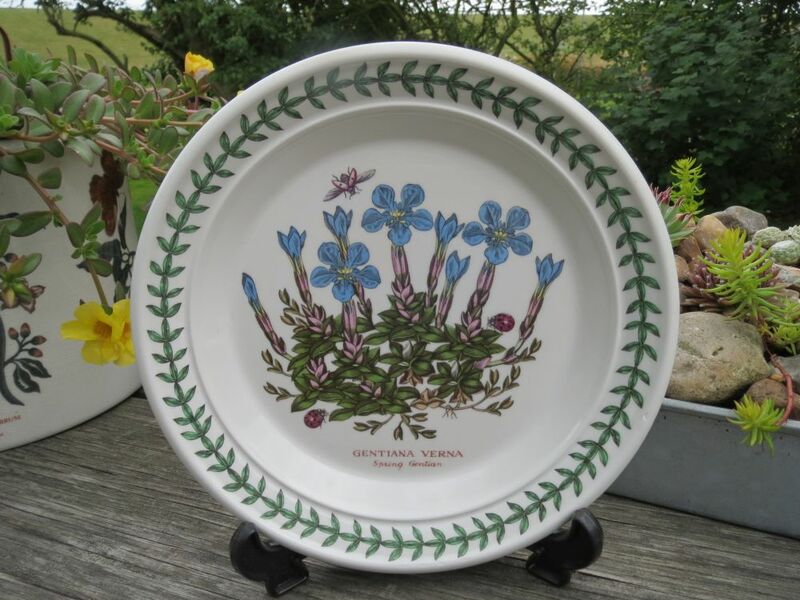 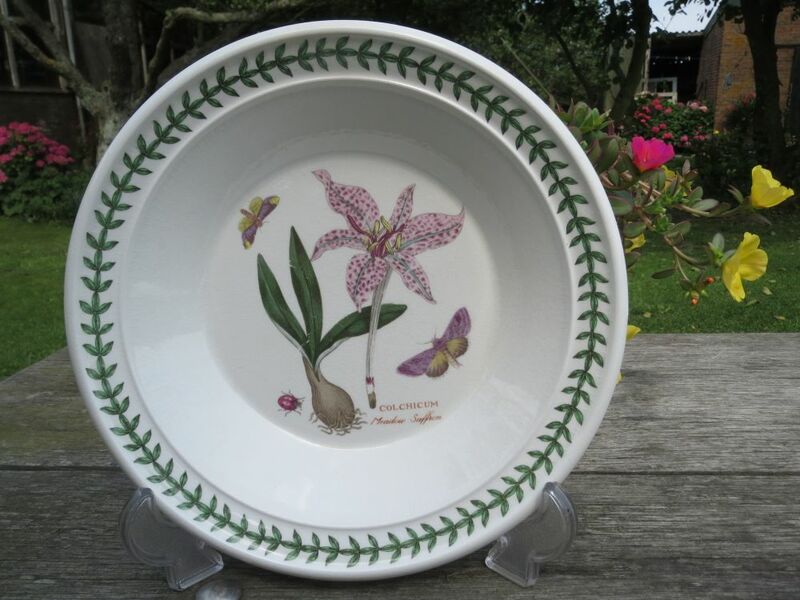 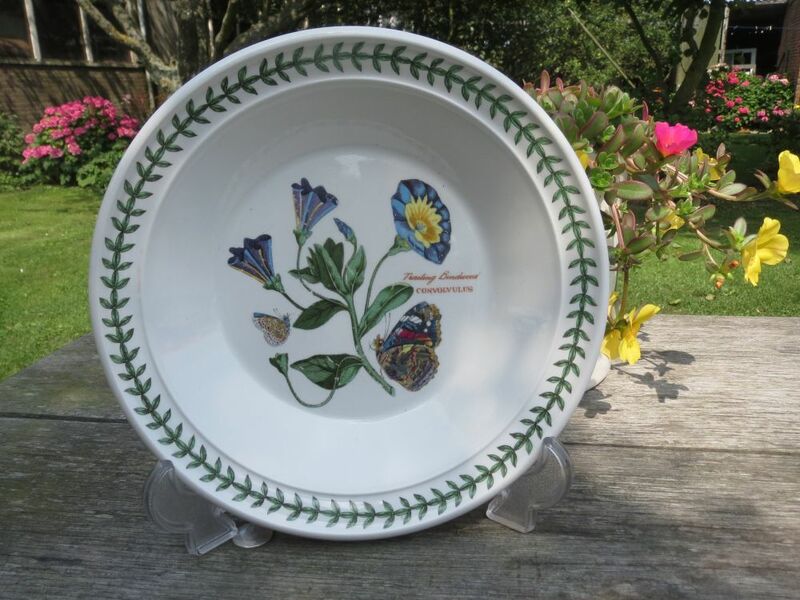 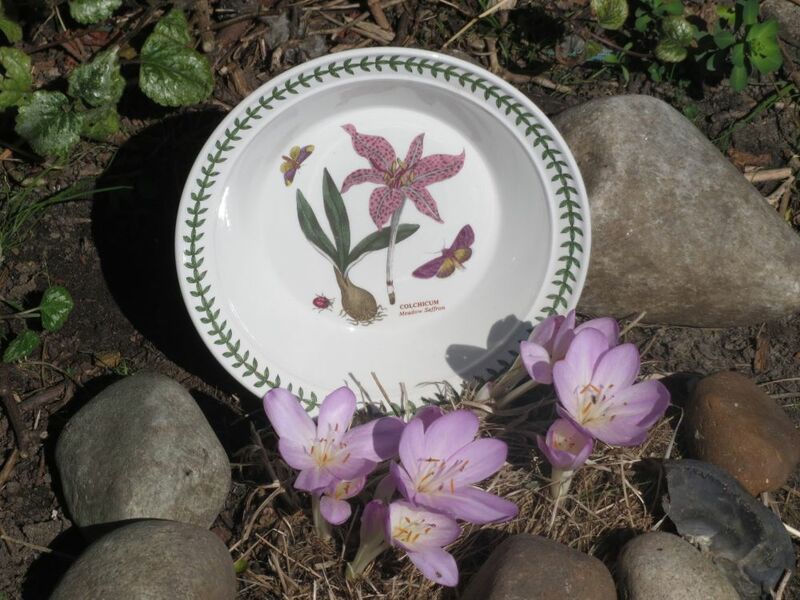 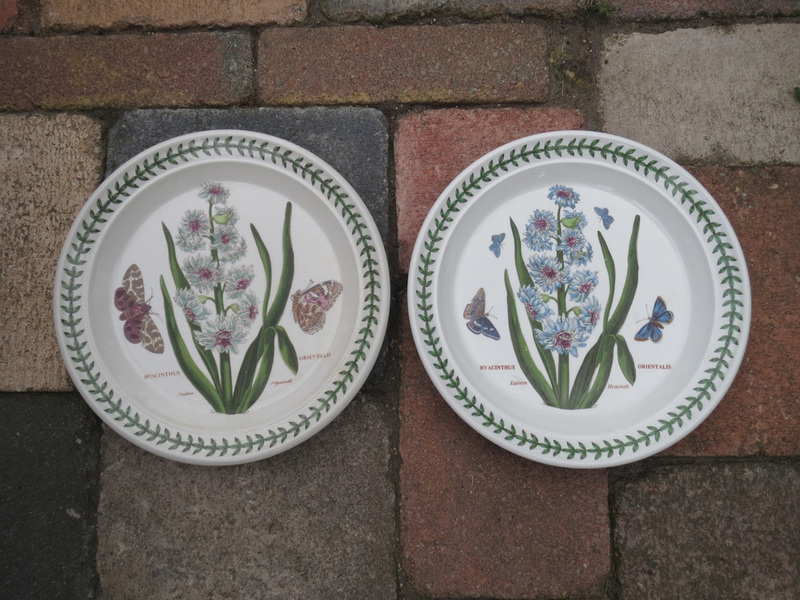 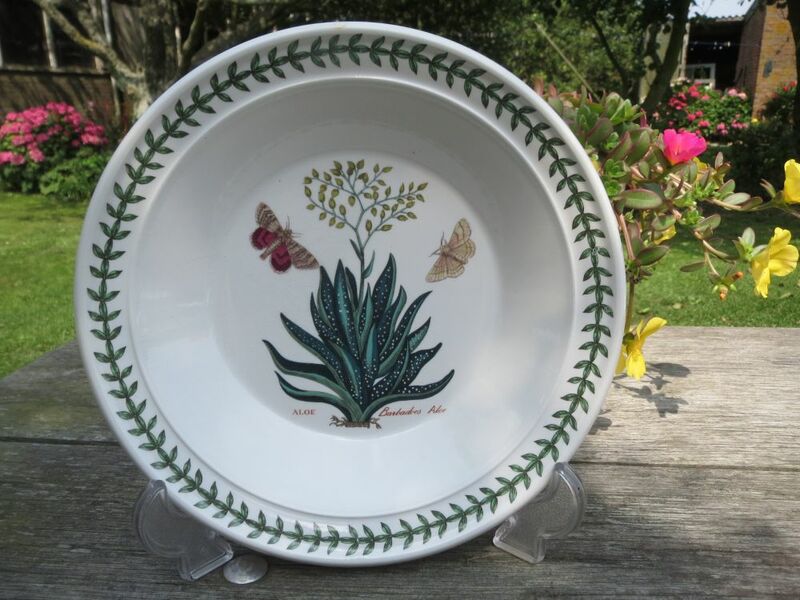 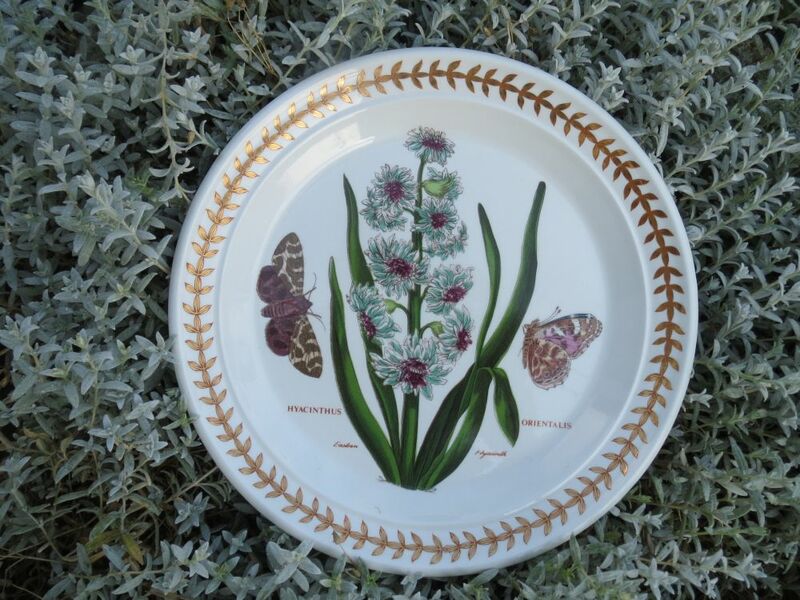 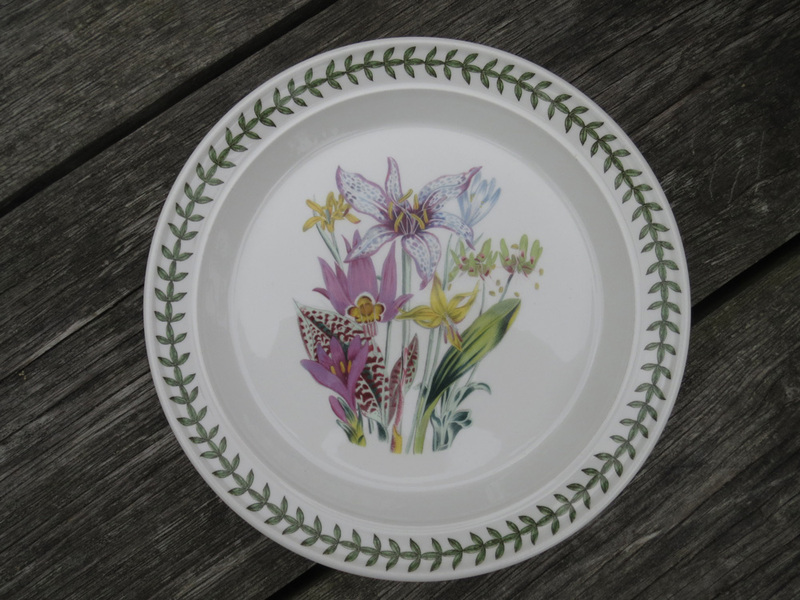 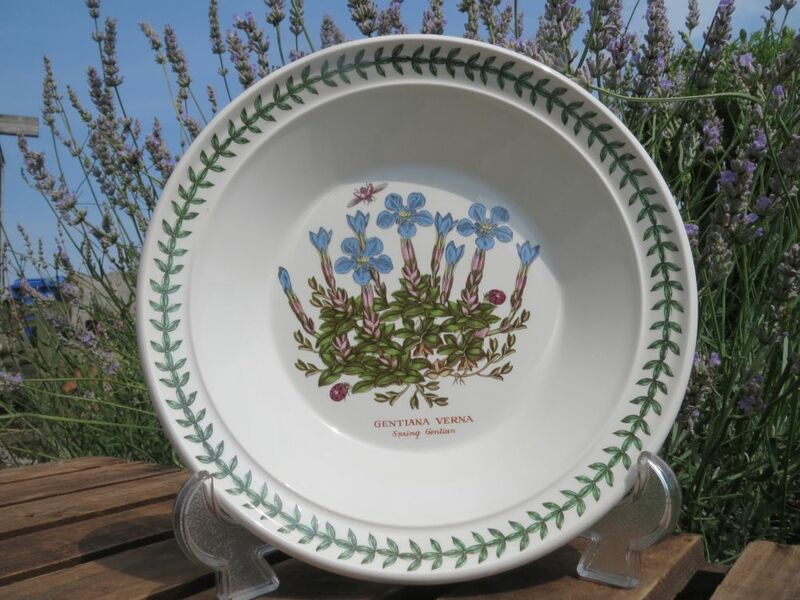 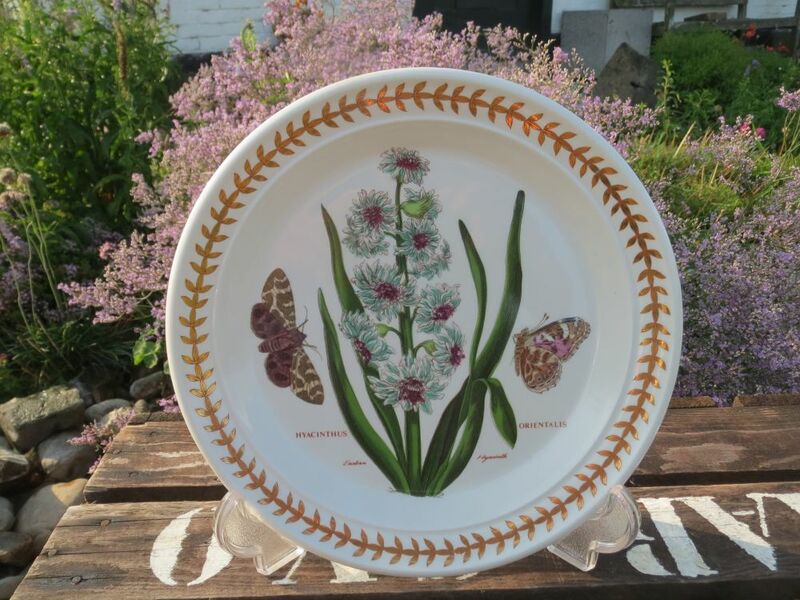 Of all the Soup plates the Spring Gentian is an all time favourite. 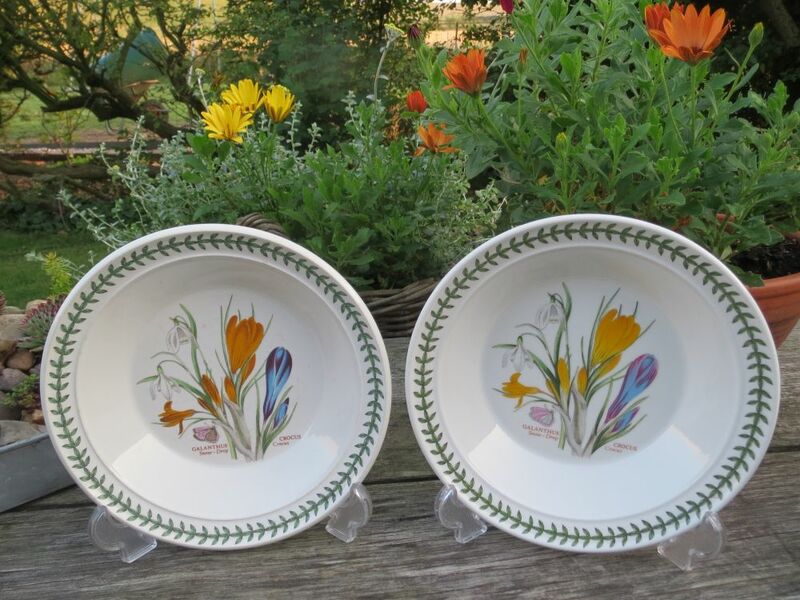 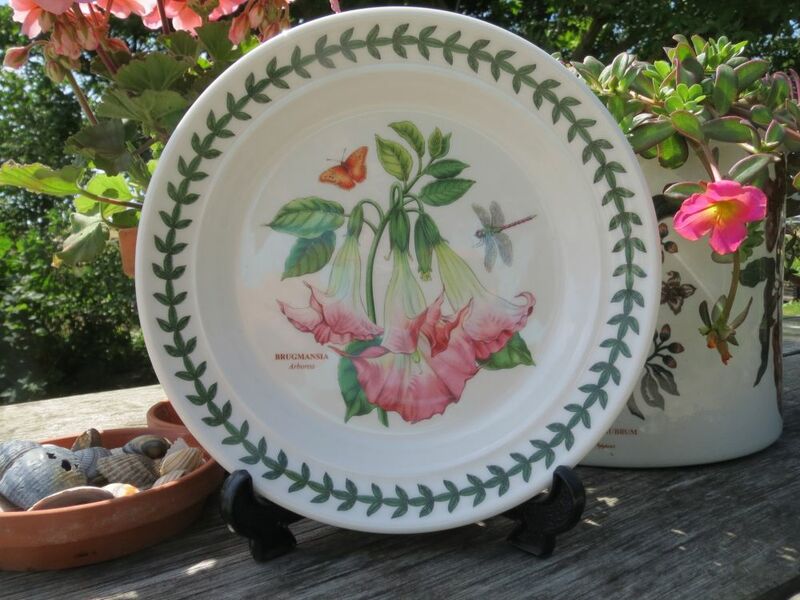 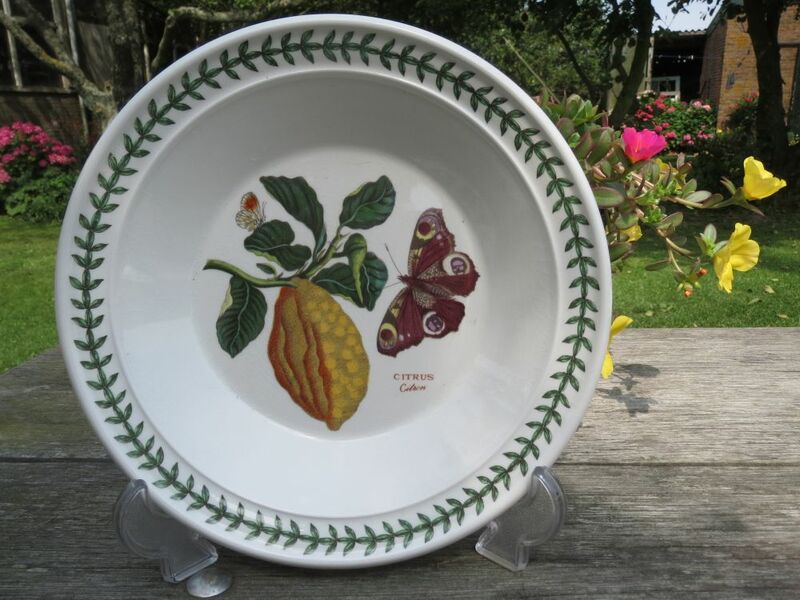 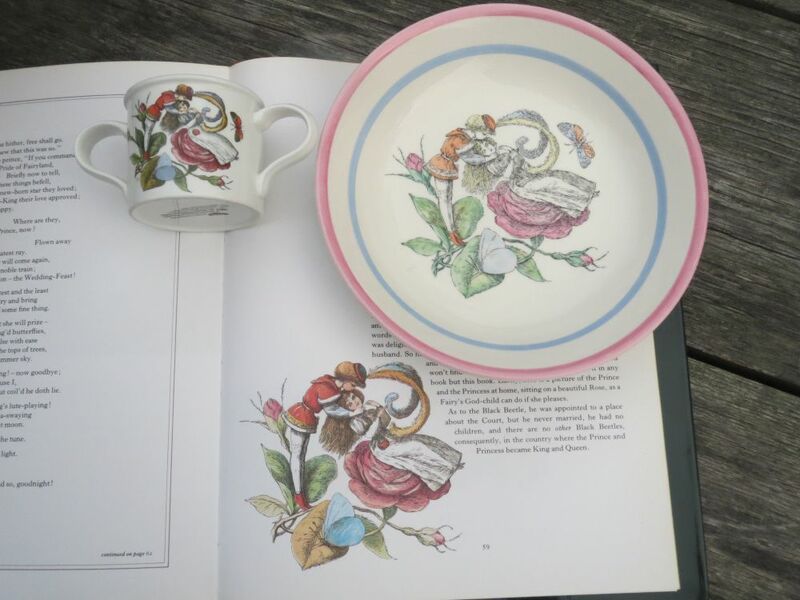 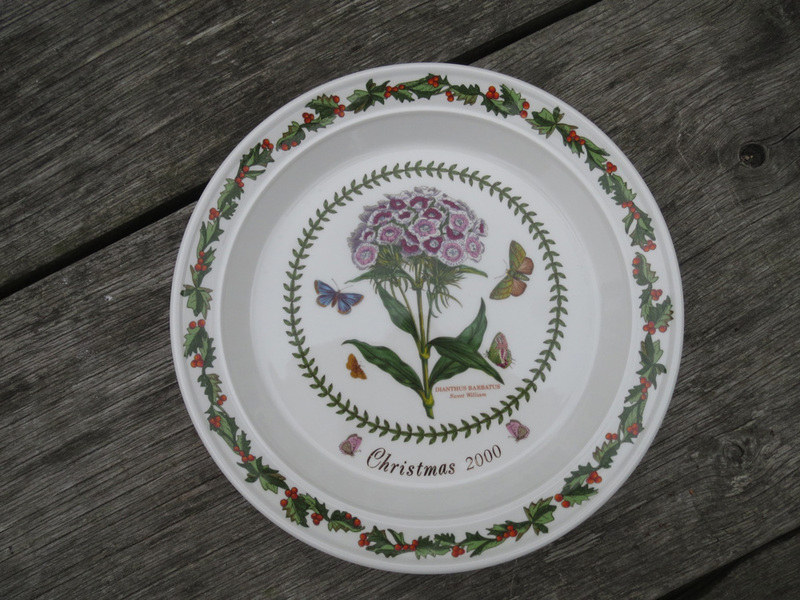 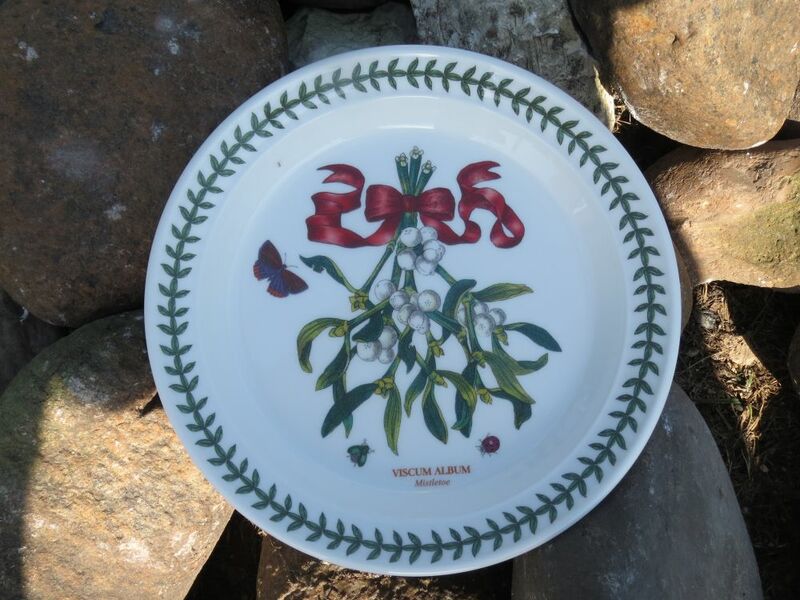 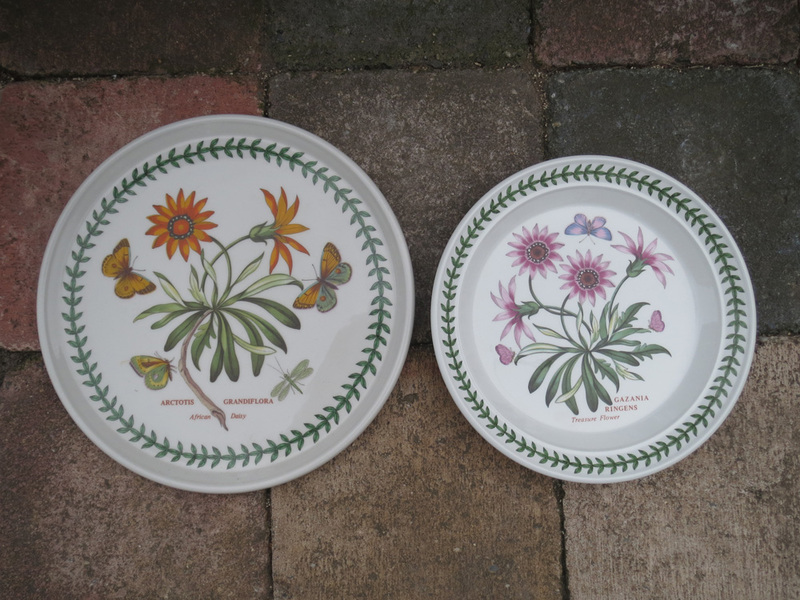 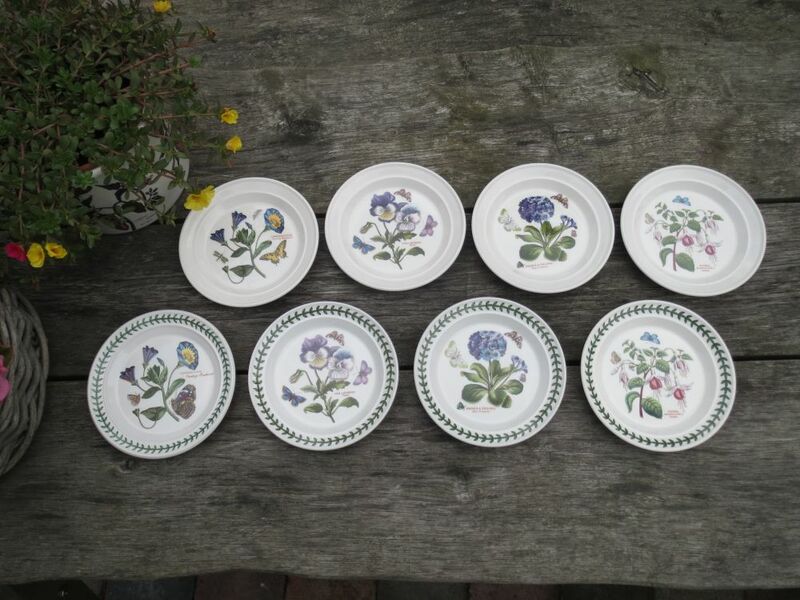 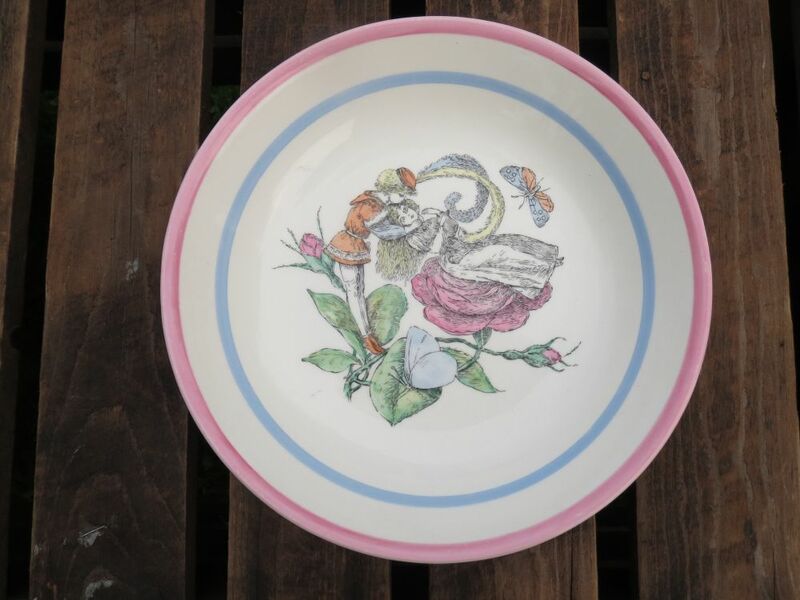 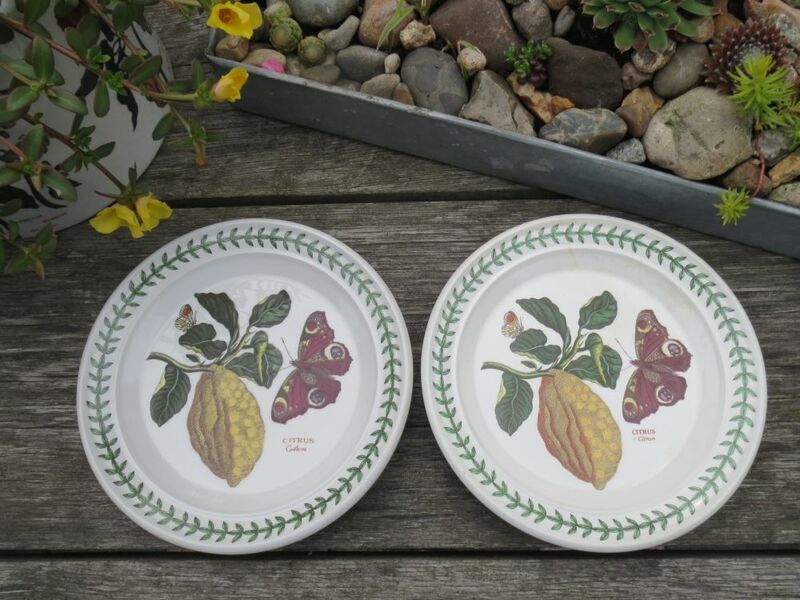 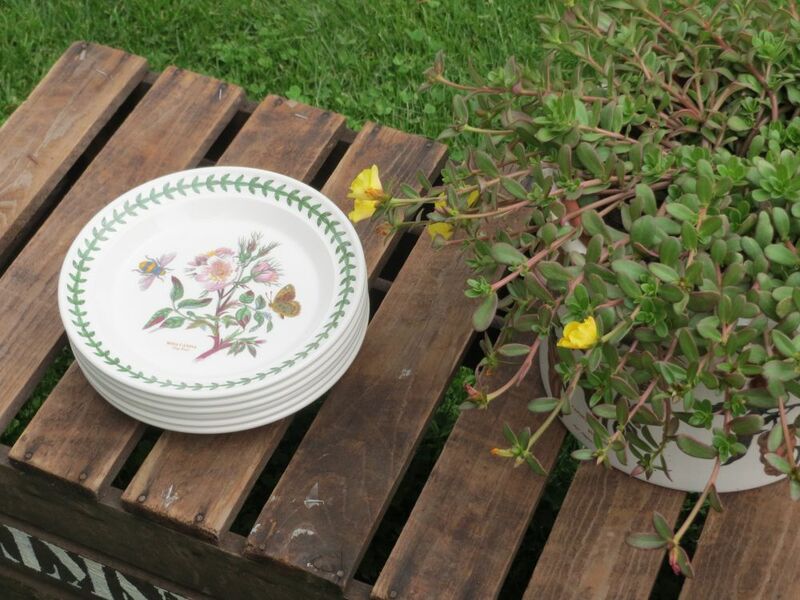 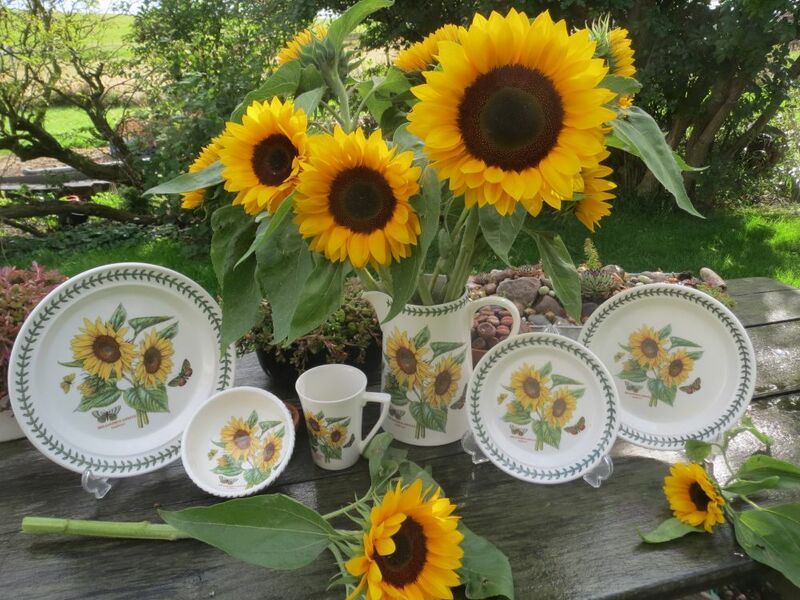 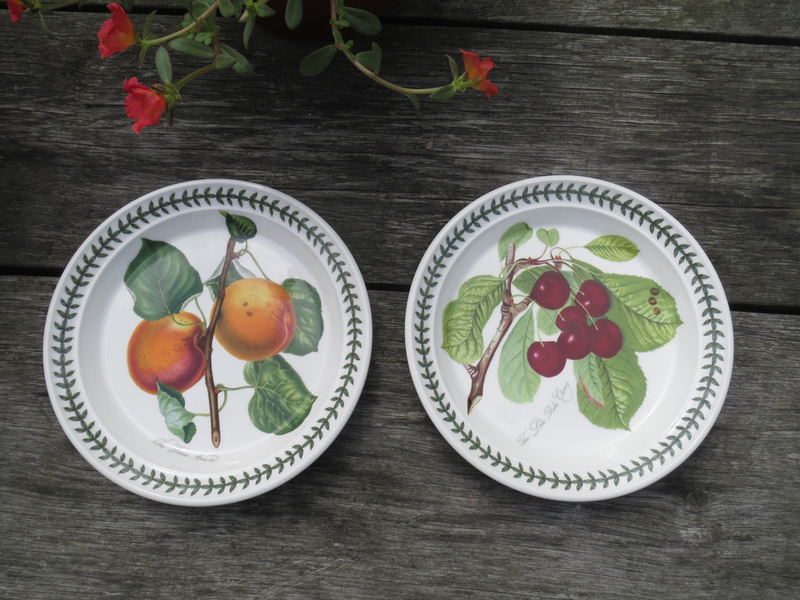 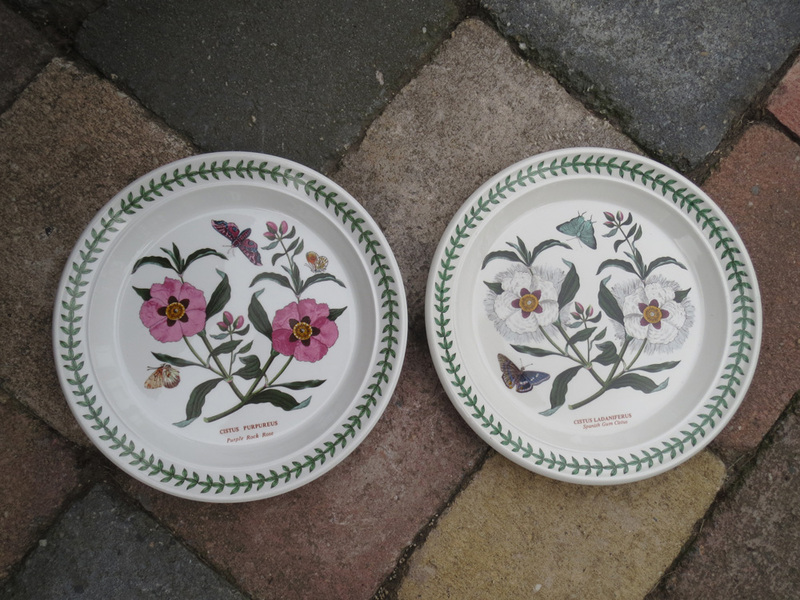 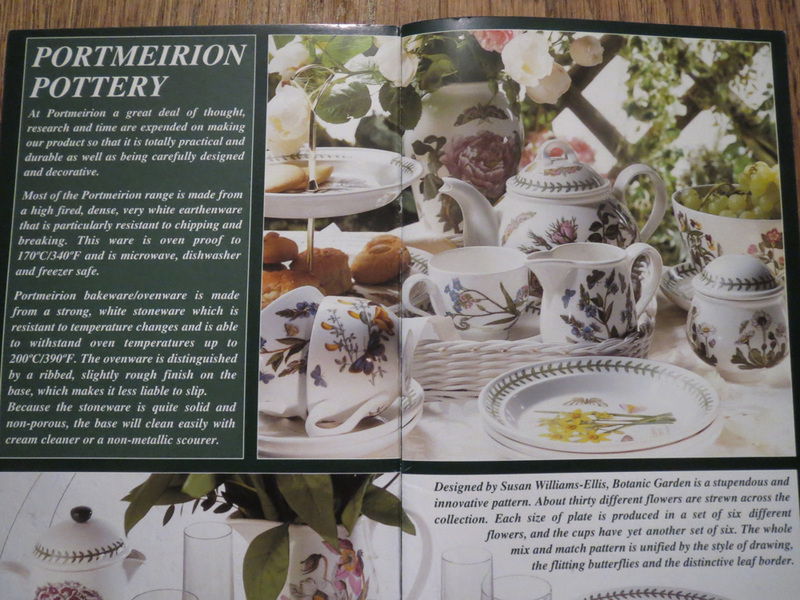 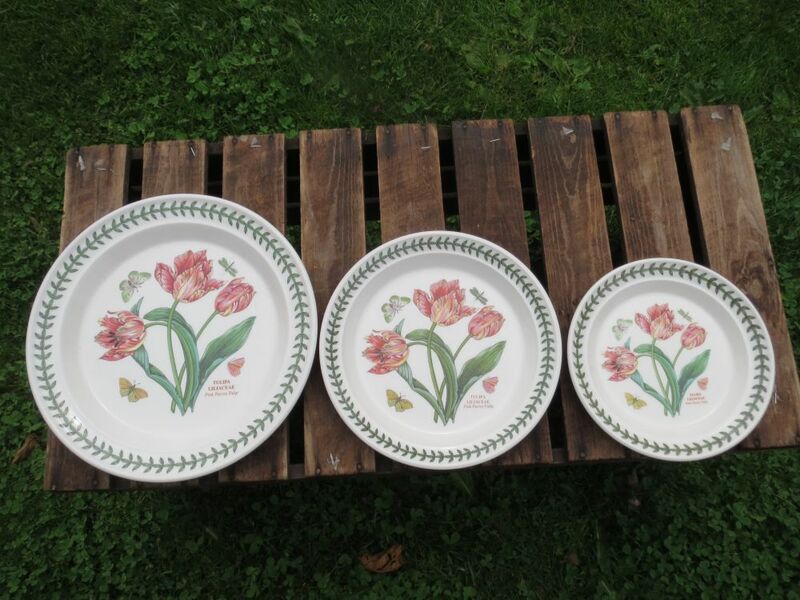 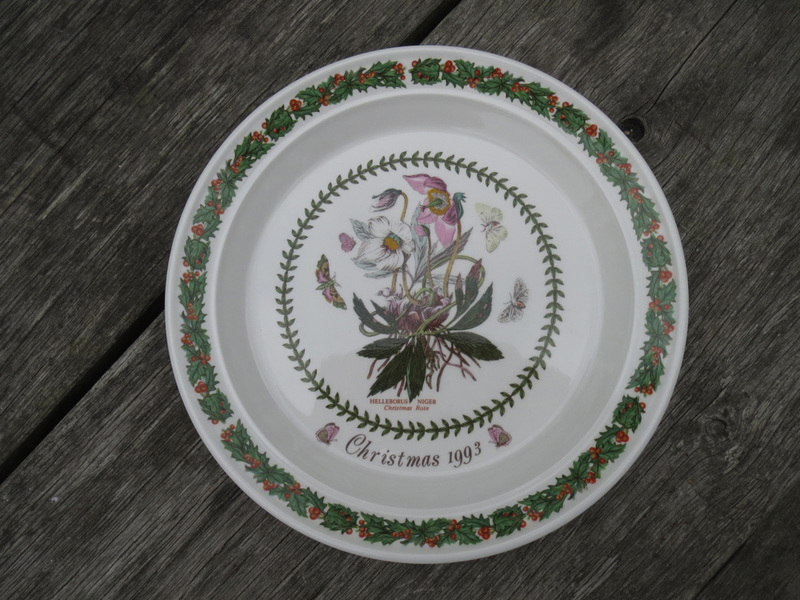 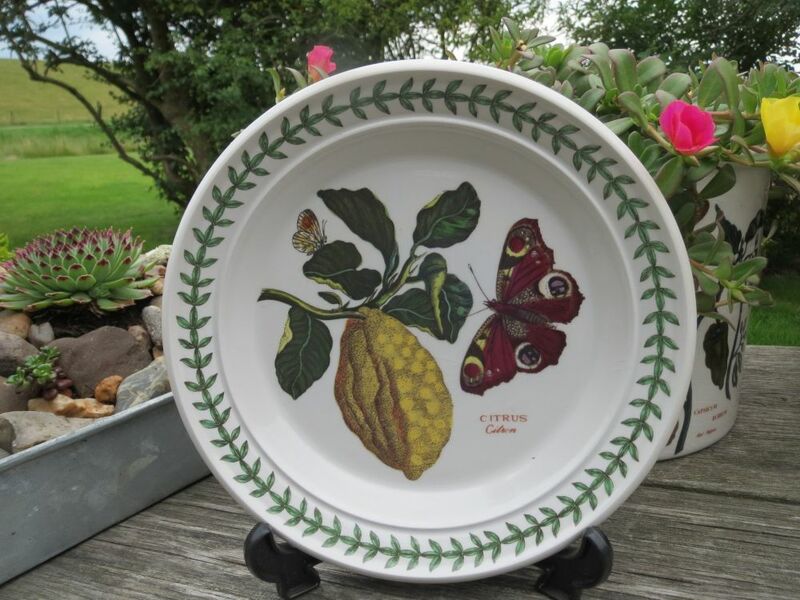 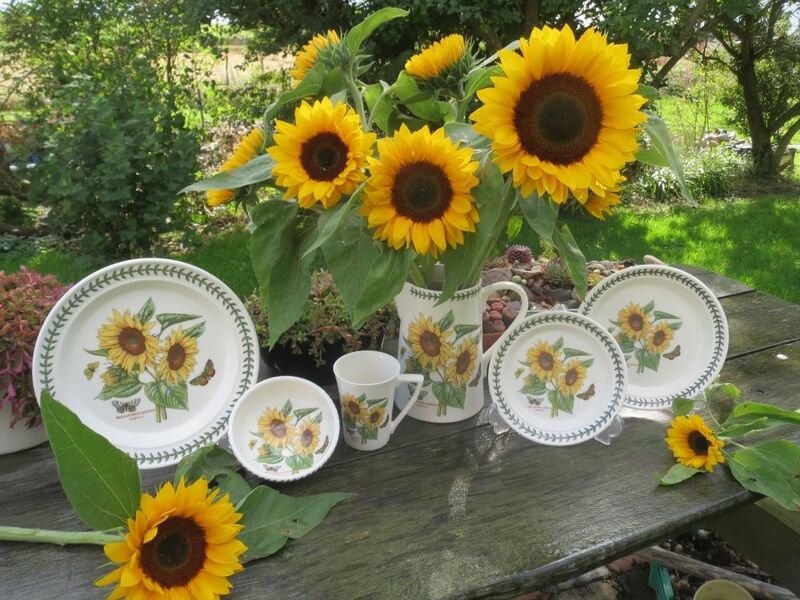 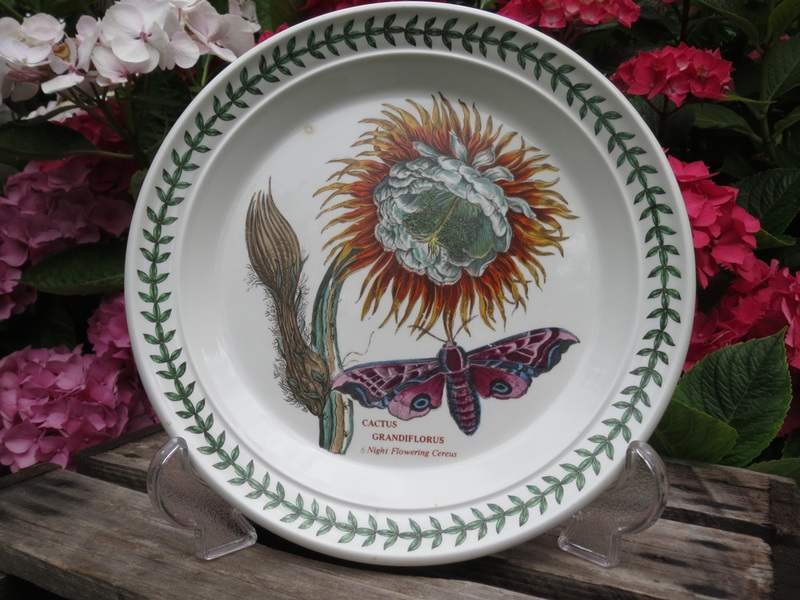 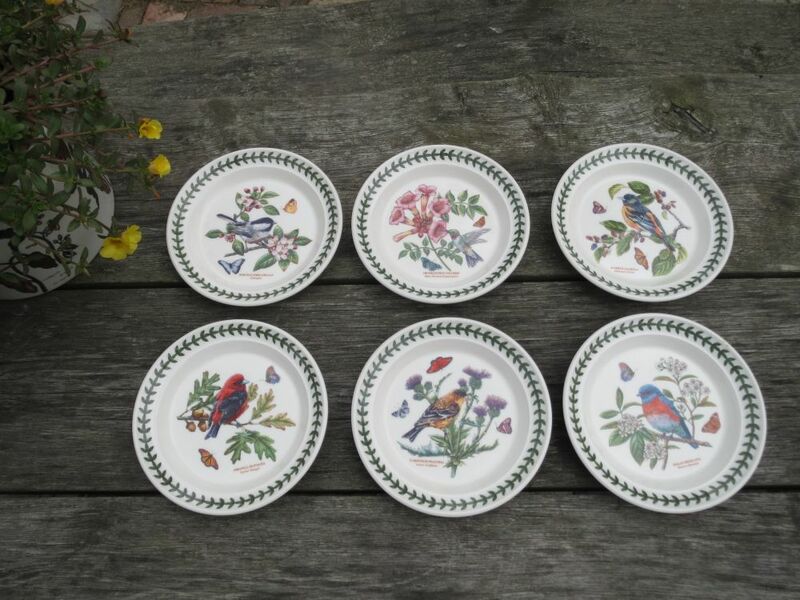 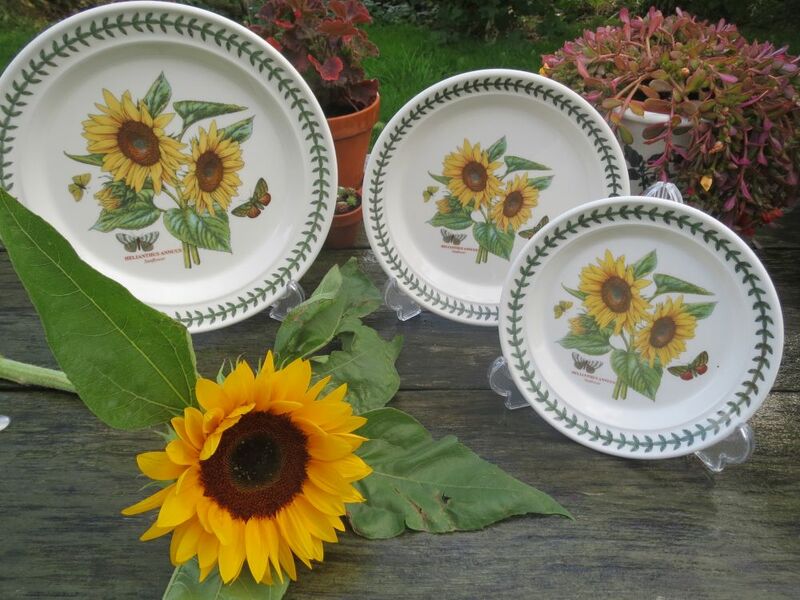 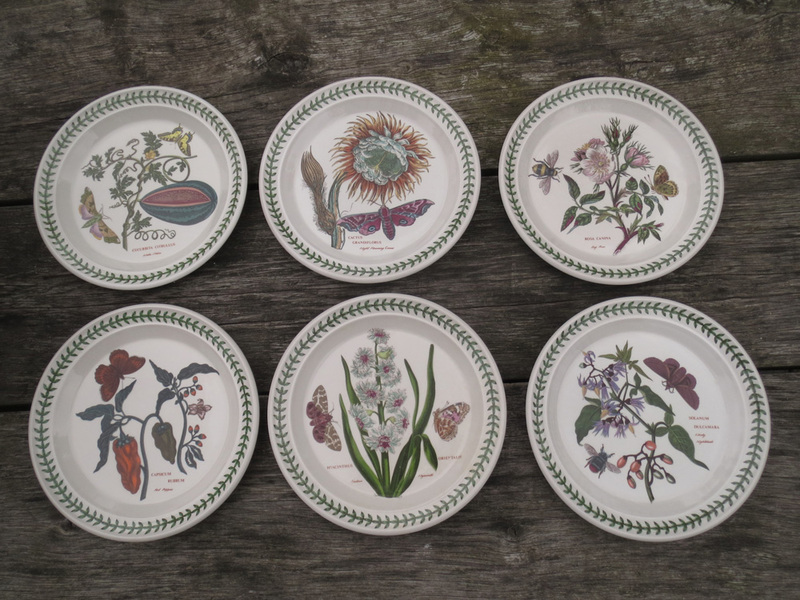 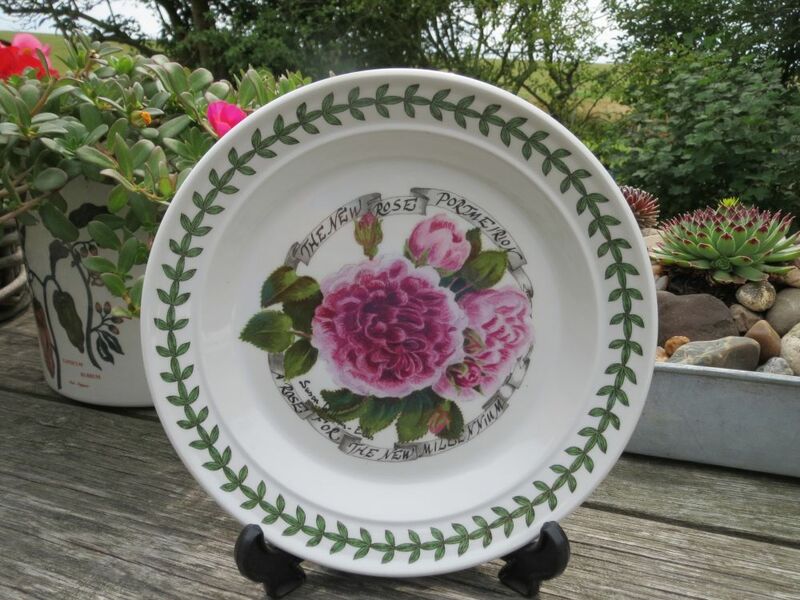 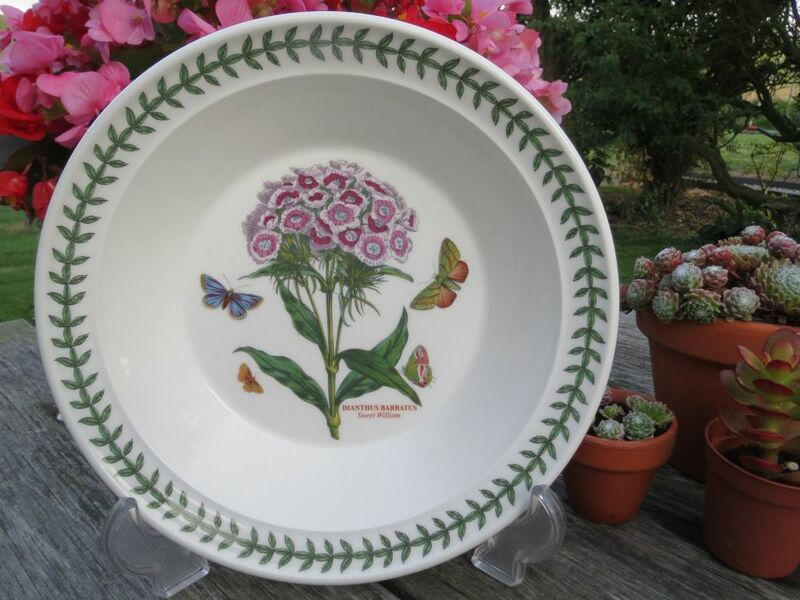 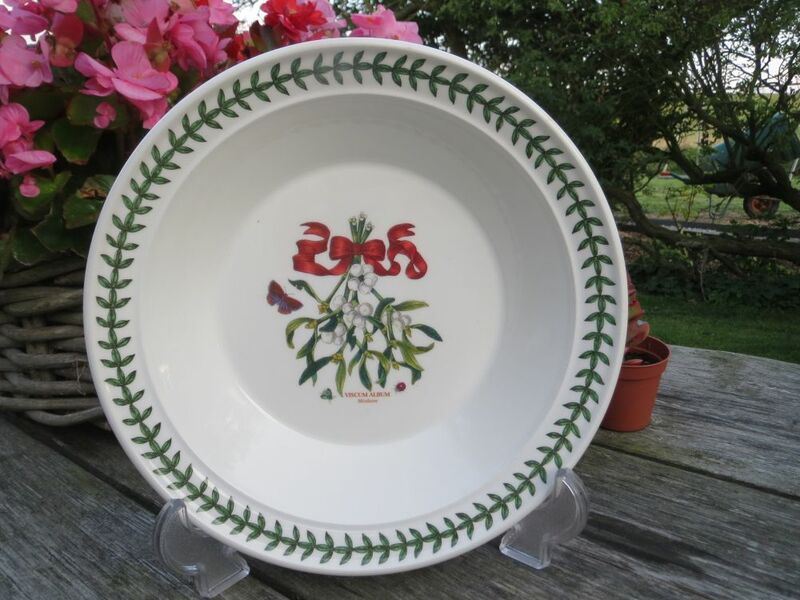 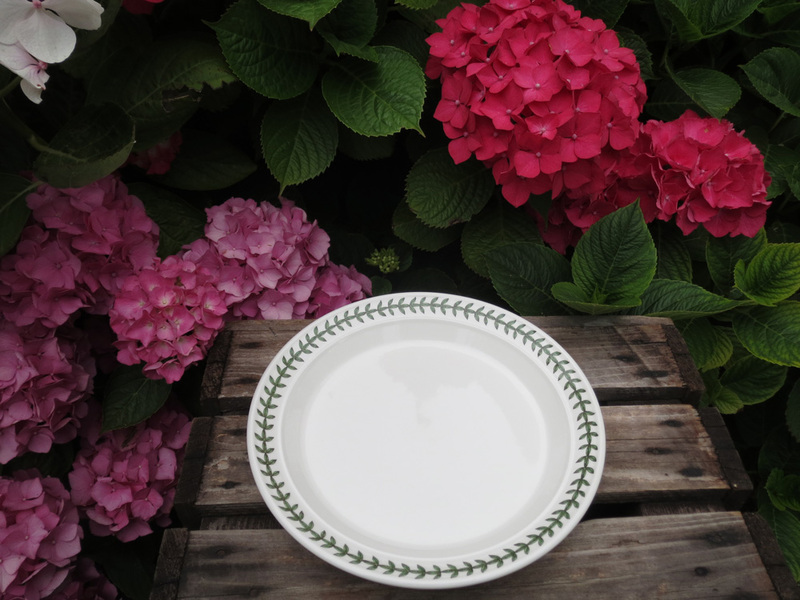 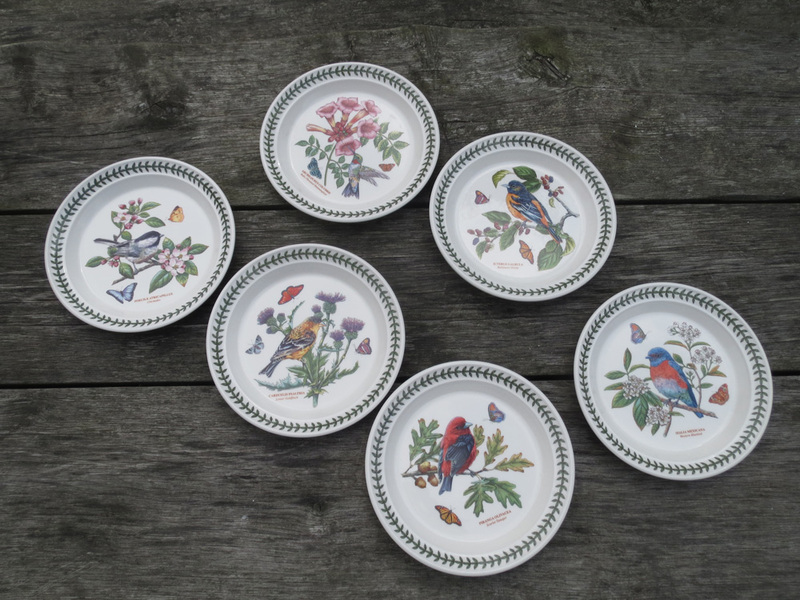 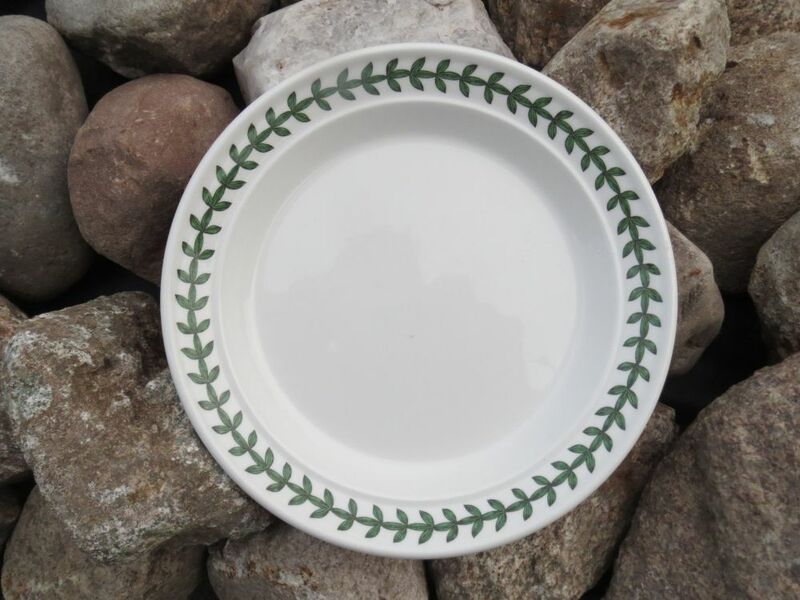 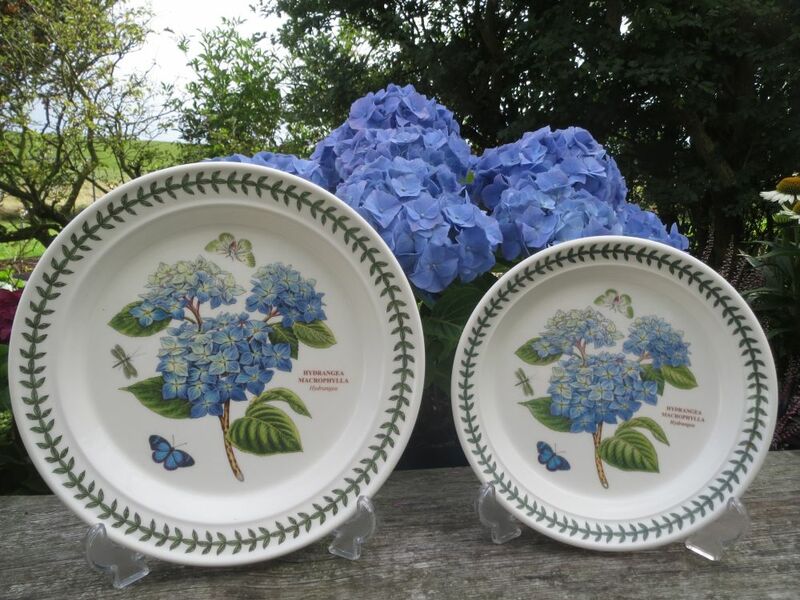 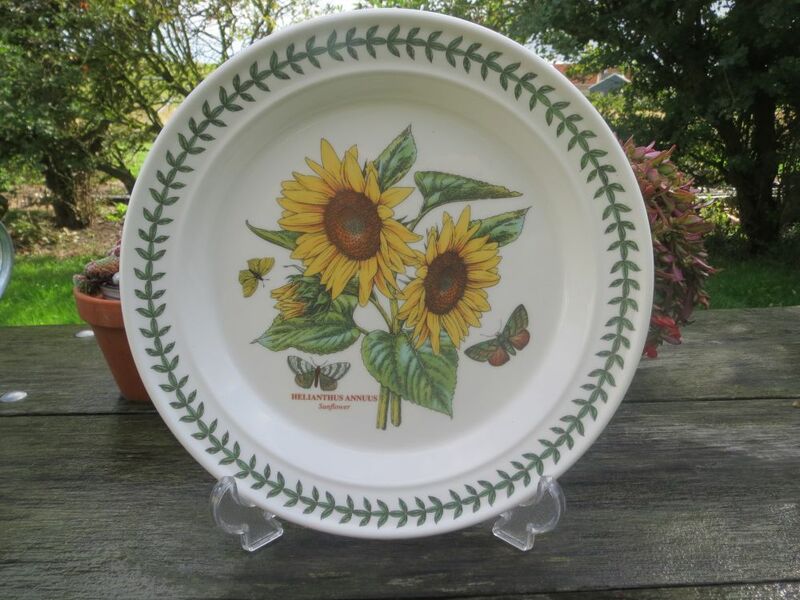 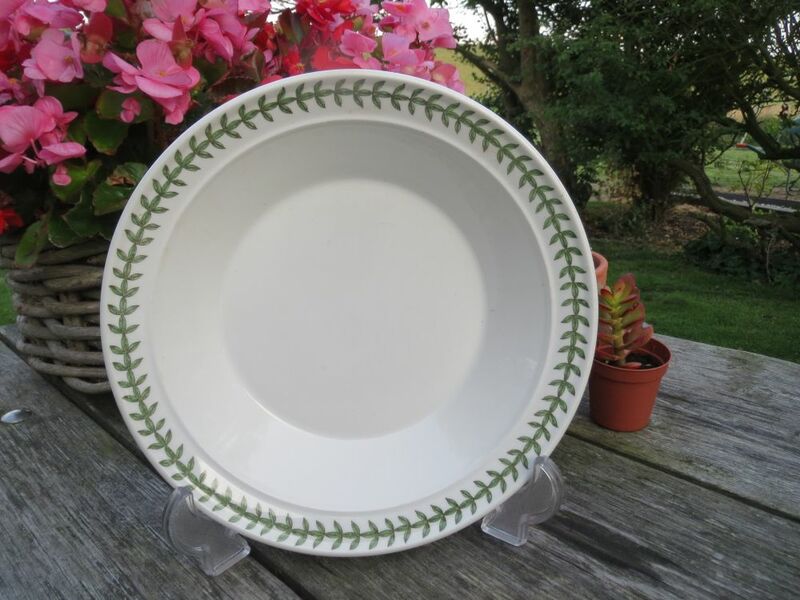 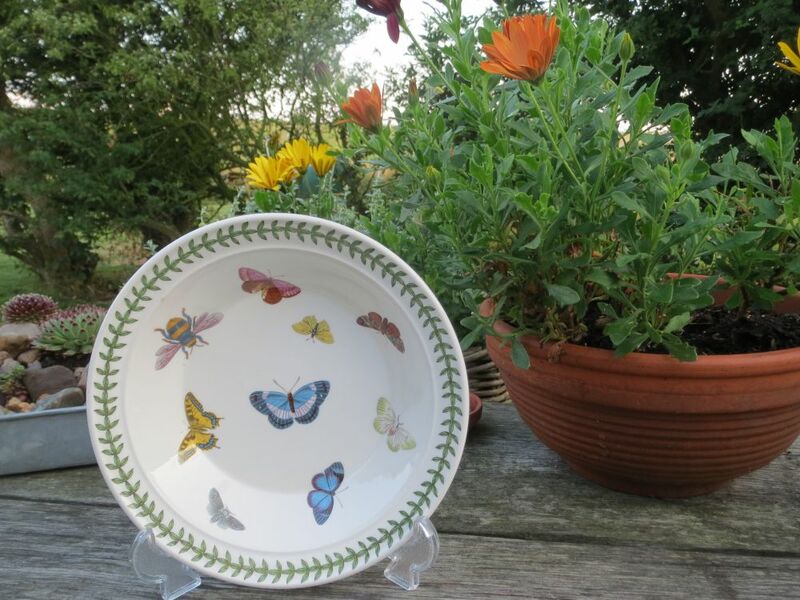 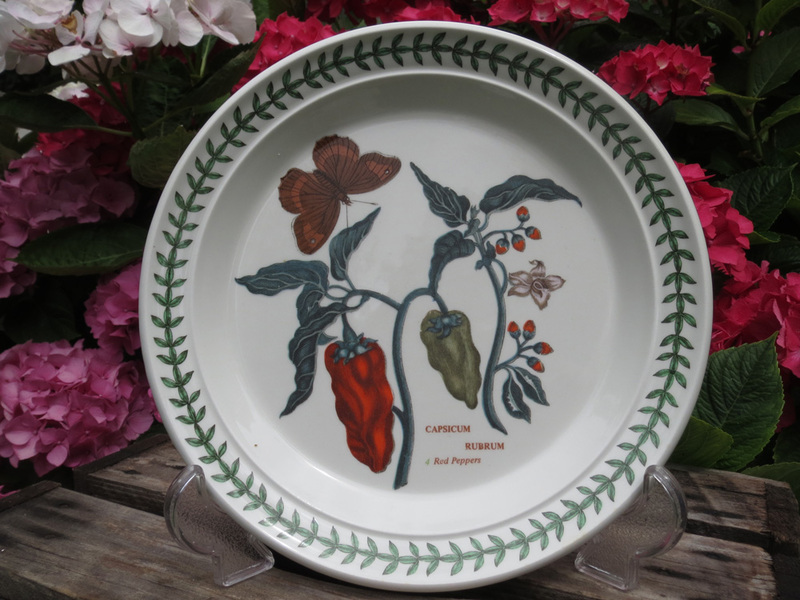 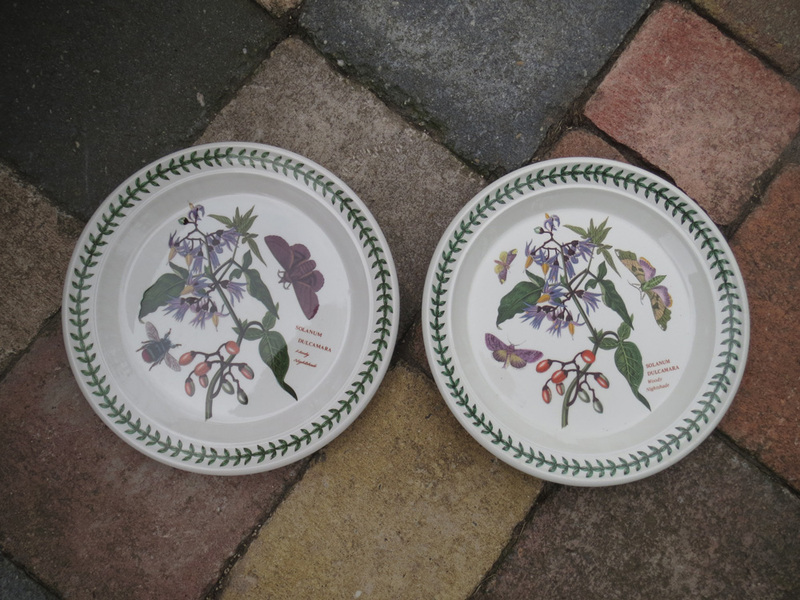 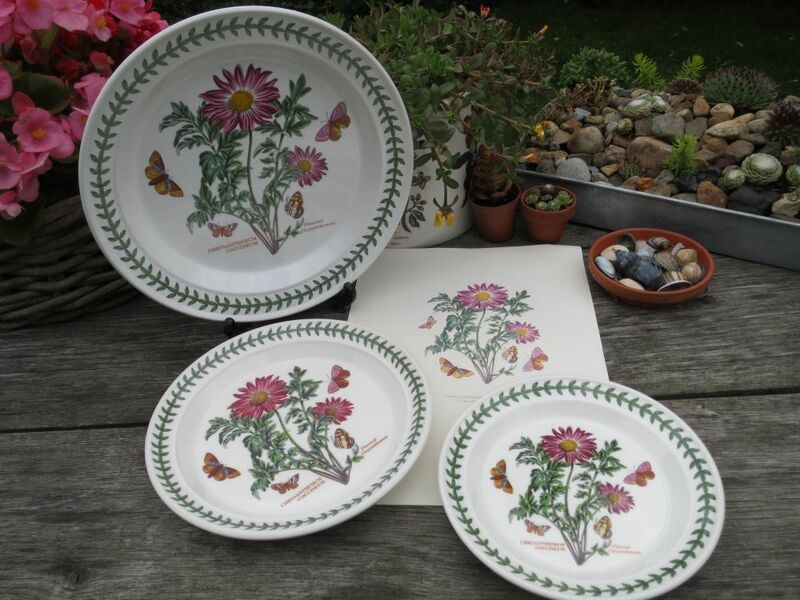 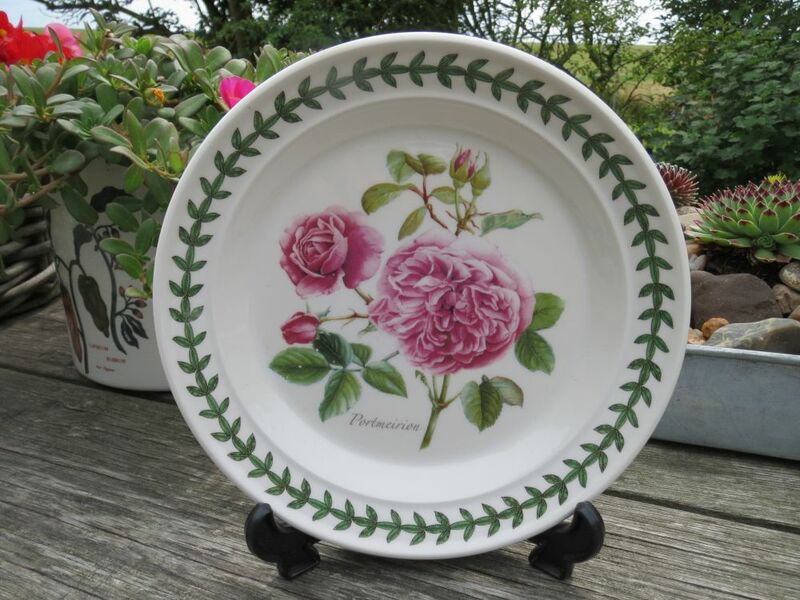 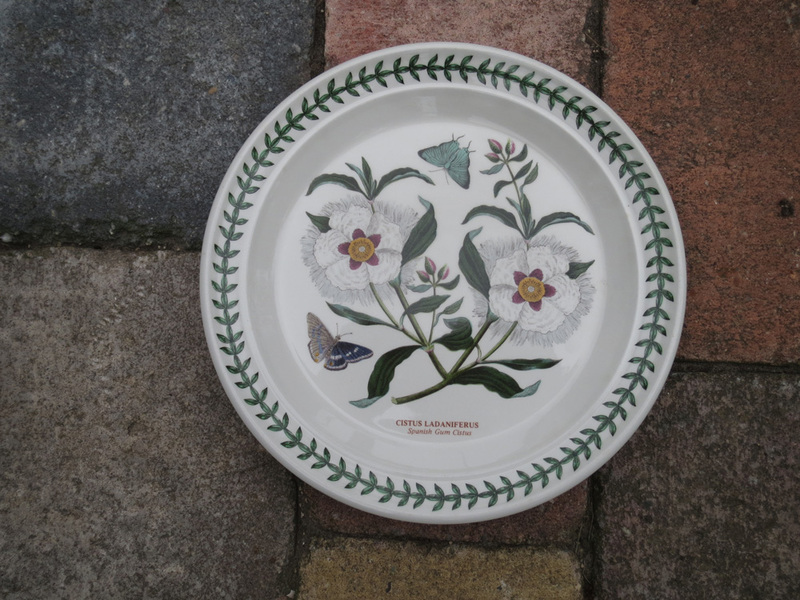 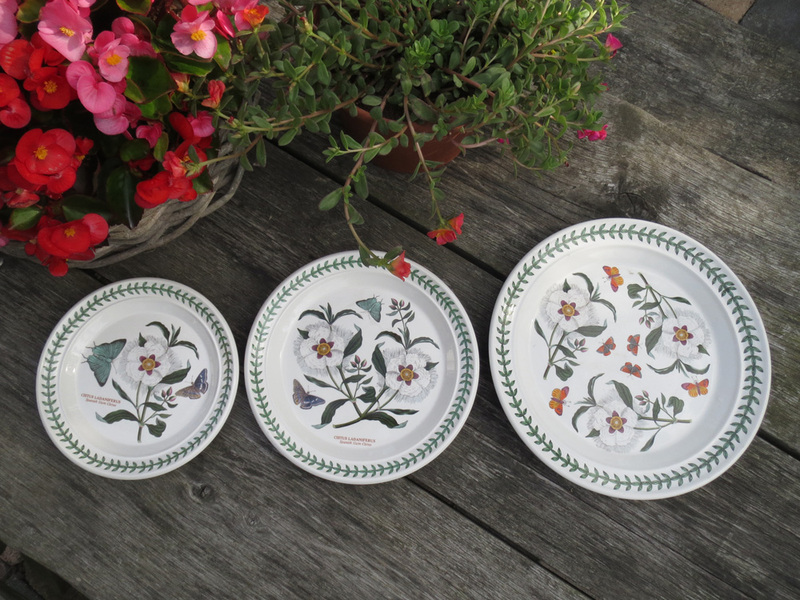 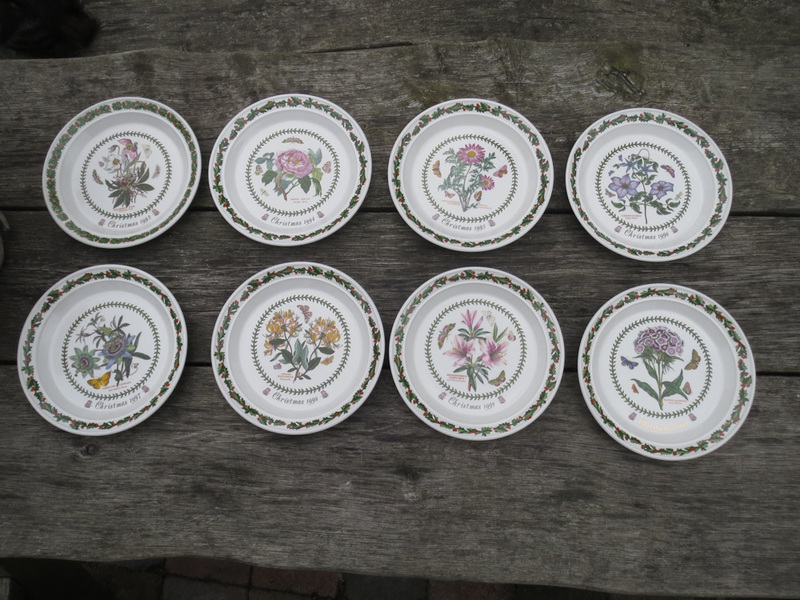 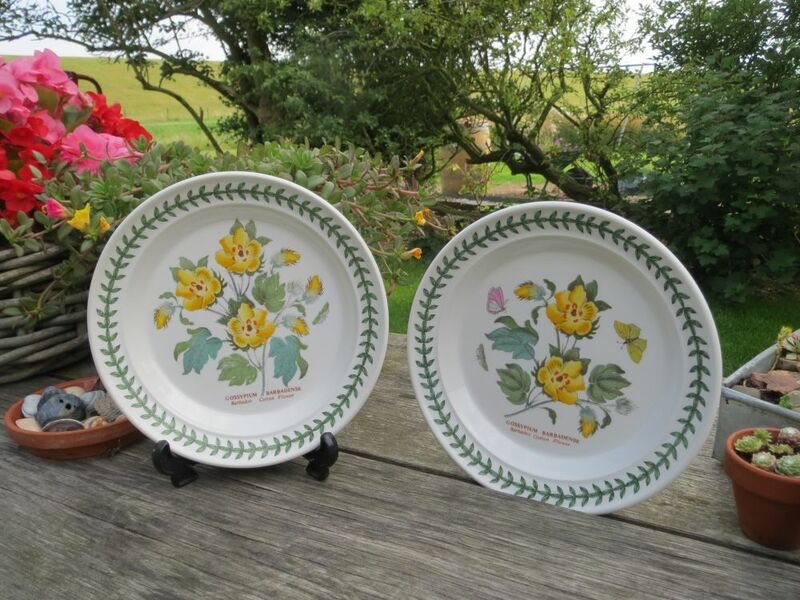 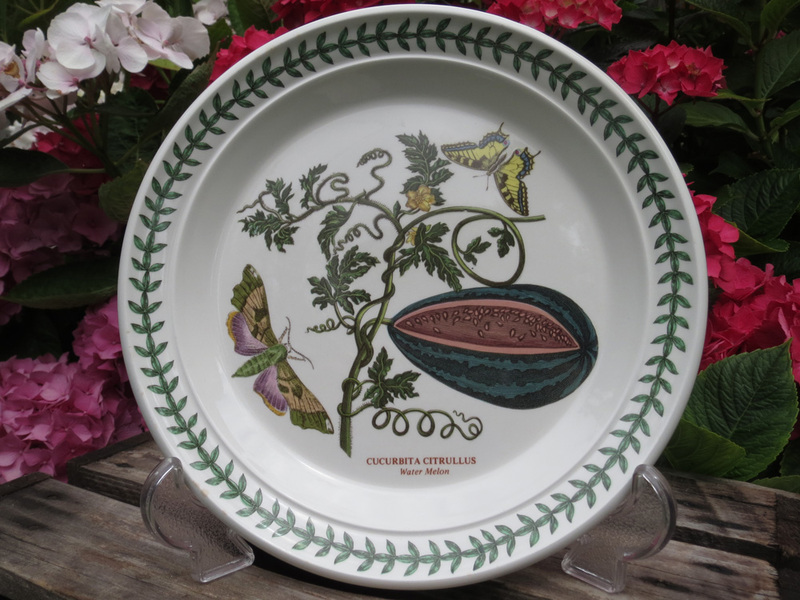 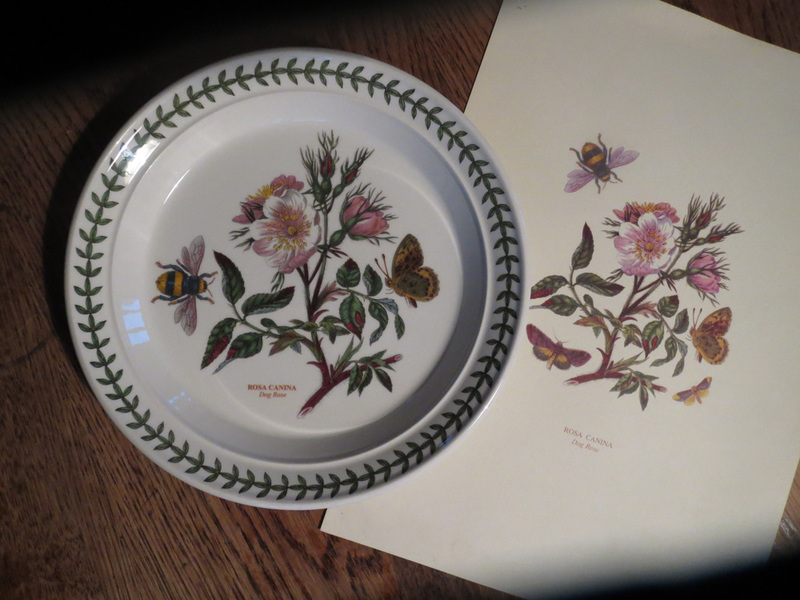 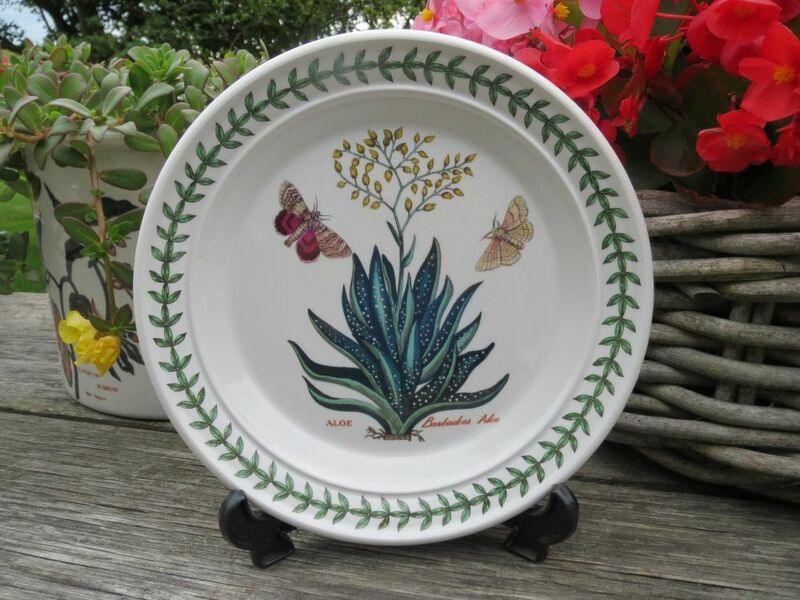 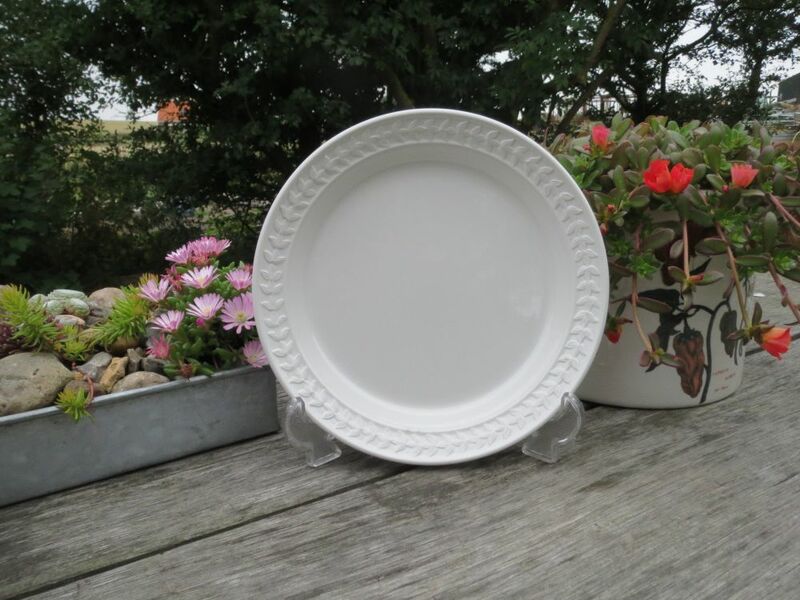 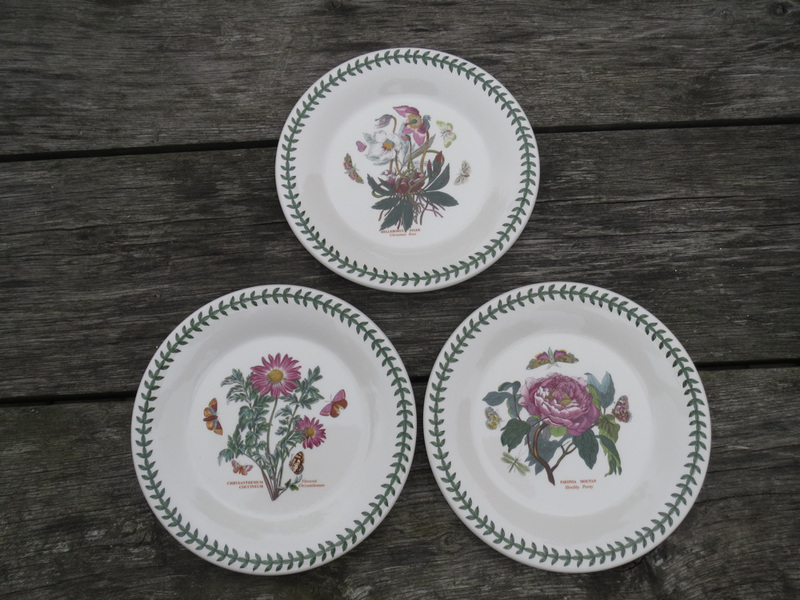 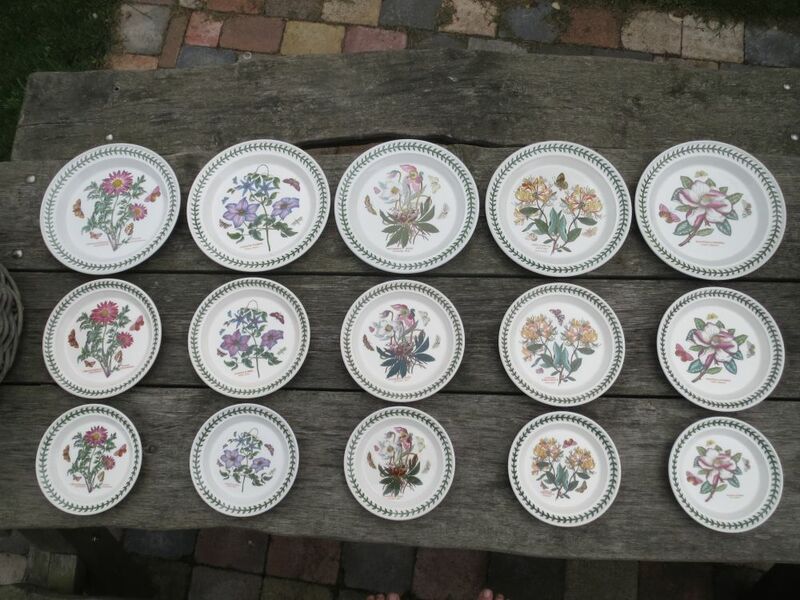 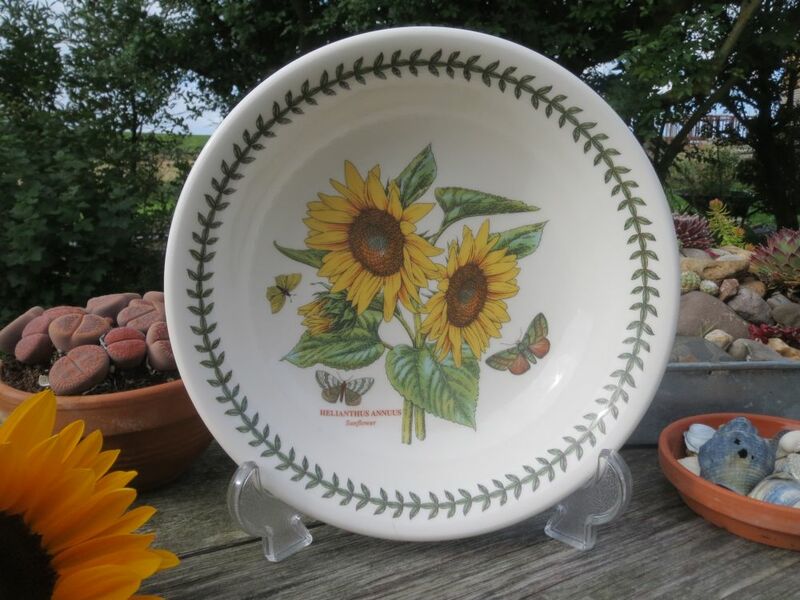 It was among my first set of six soup plates, although I did not know then it was going to be such a rare motif. 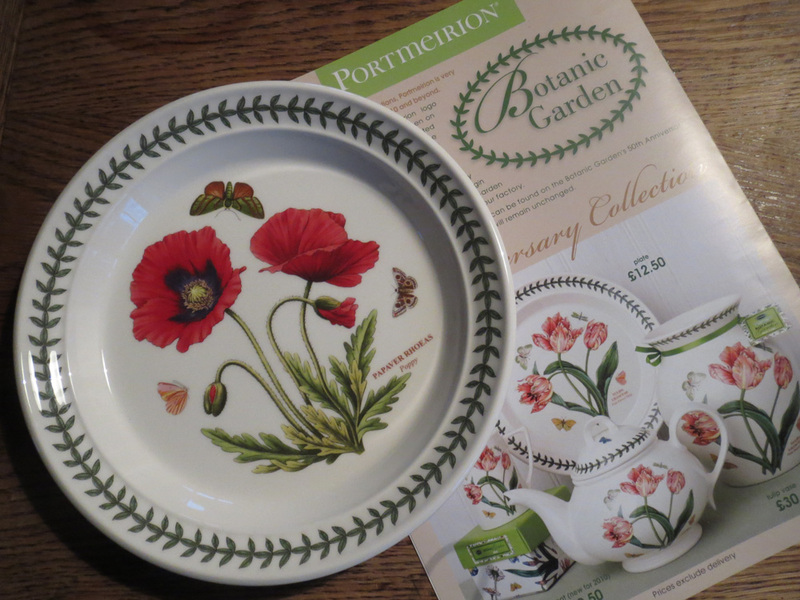 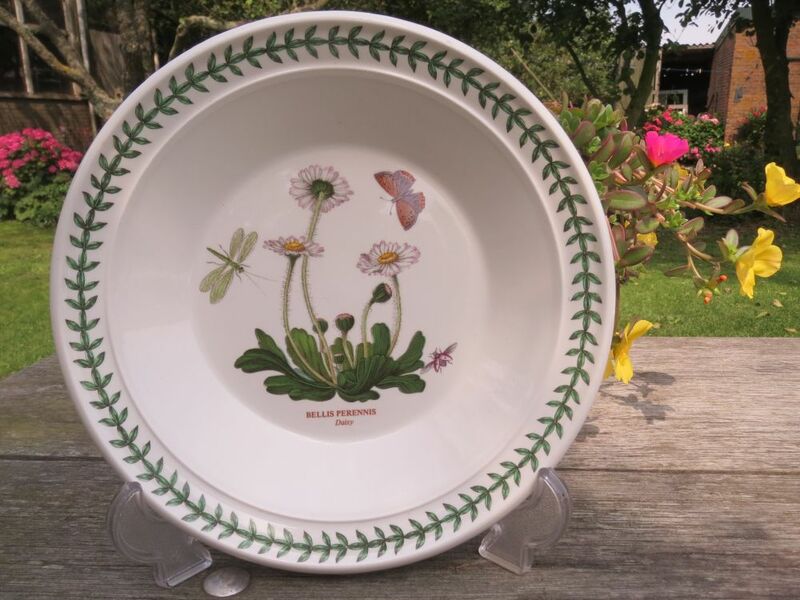 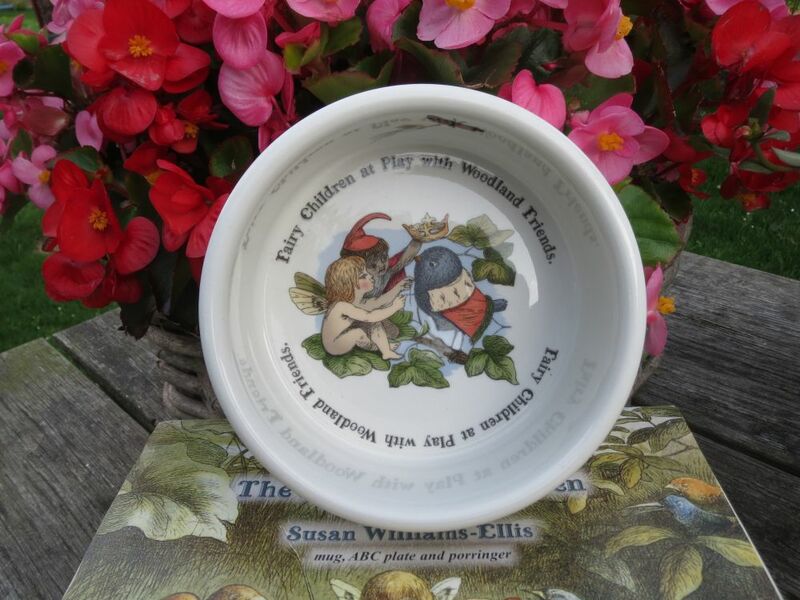 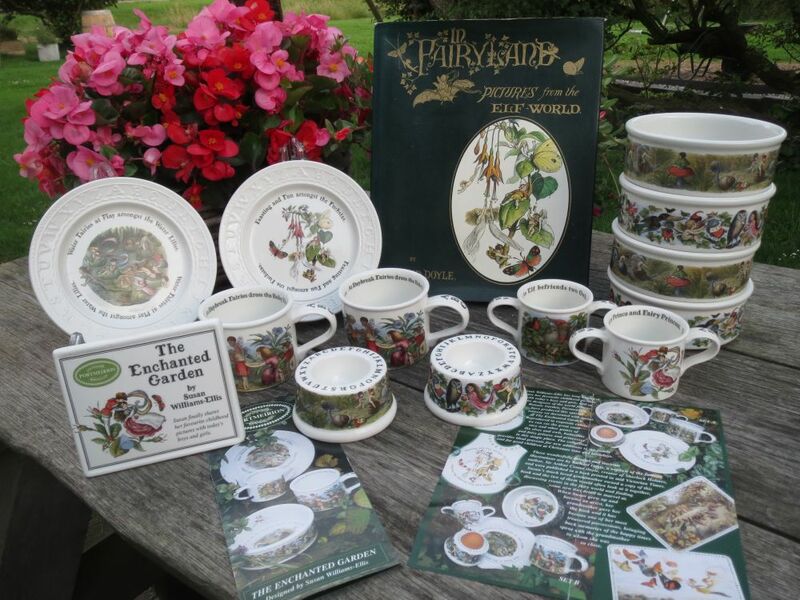 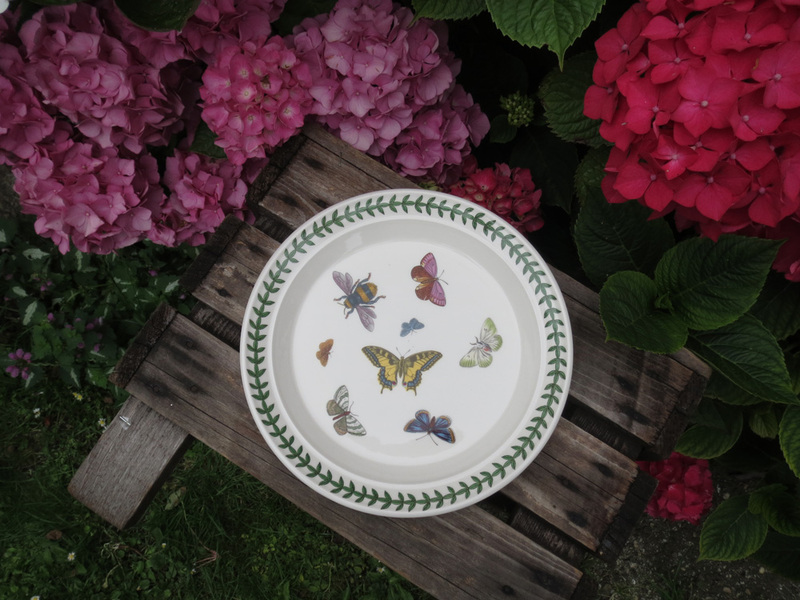 Ofcourse we now have the Very Hungry Caterpillar, but maybe it is time for a new Portmeirion childrens range with some new mischievous fairies. 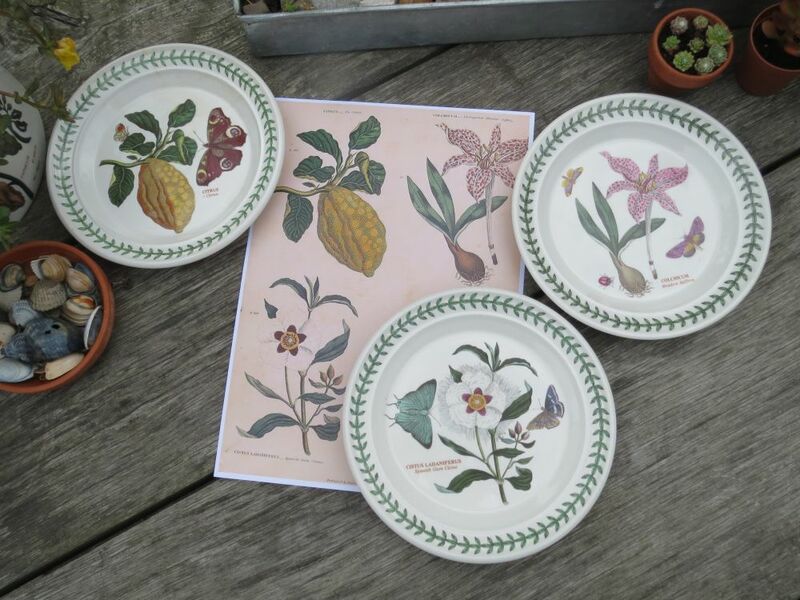 They were the Spanish Gum Cistus, the Trailing Bindweed, the Meadow Saffron, the Citron, the Daisy and the Barbados Aloe. 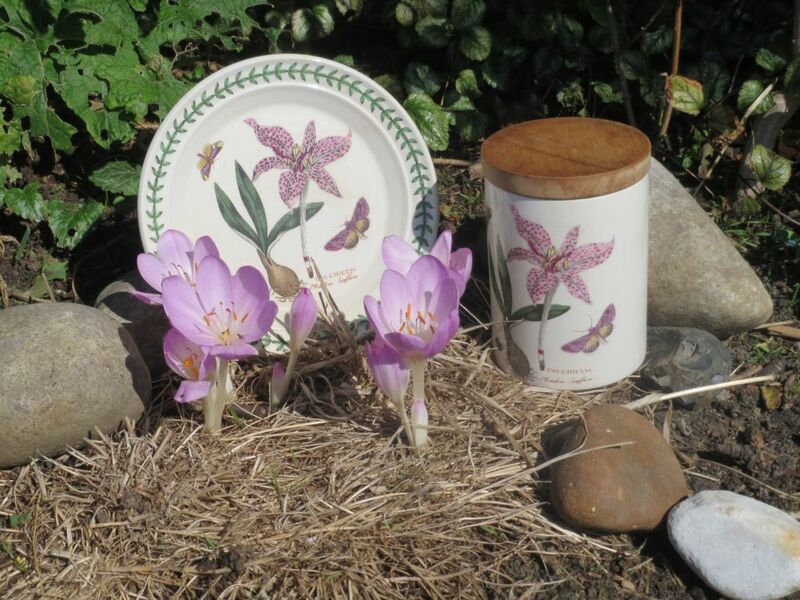 Spring Gentians now are rare and hard to find. 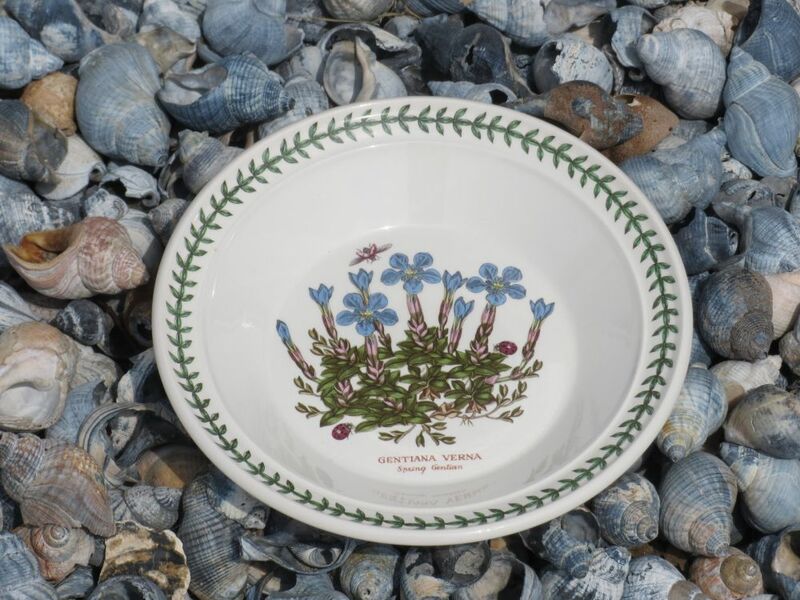 A pity, it is such a lovely motif, with its small, bright blue flowers. 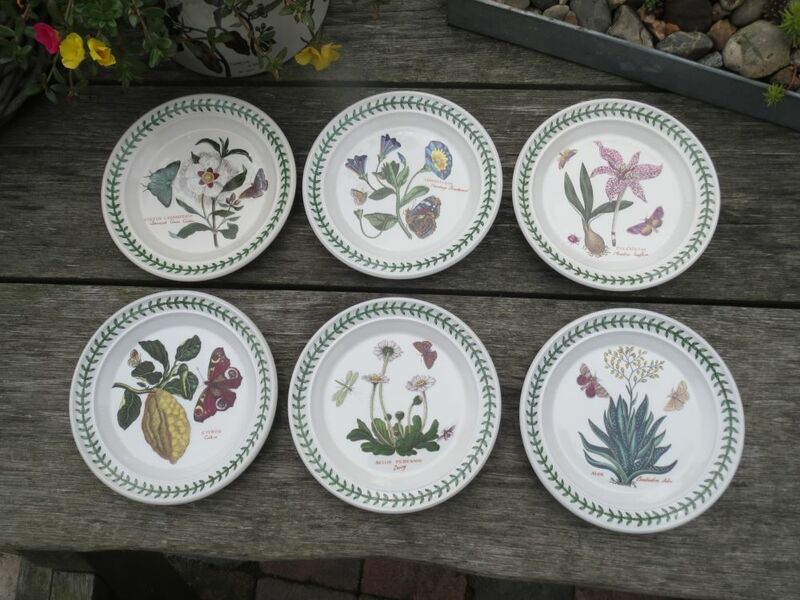 the Ivy Leafed Cyclamen, the Barbados Cotton Flower, the Blue Primrose, Snow-Drop and Crocus, the Pansy, the Fuchsia, the Small Narcissus, the Rhododendron and the Barbados Cotton Flower. 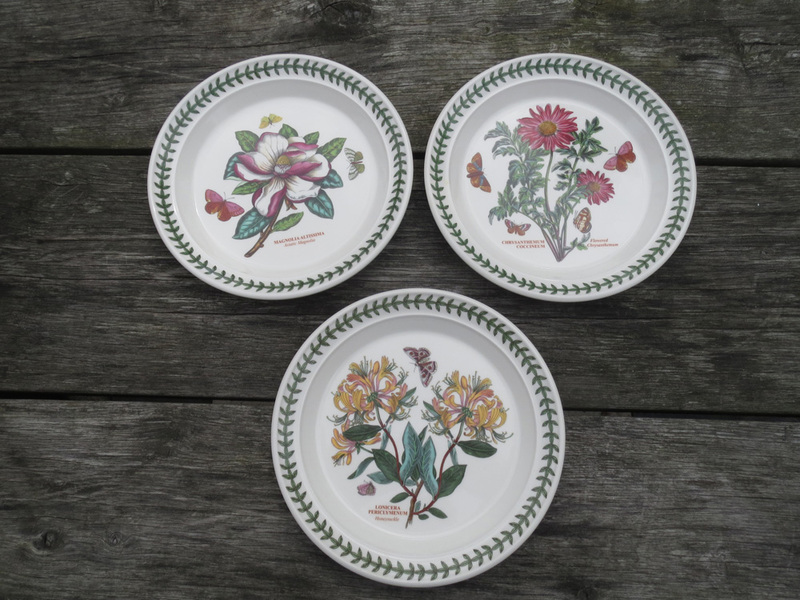 They are the Flowered Chrysanthemum, the Virgins Bower, the Christmas Rose, The Honeysuckle and the Asiatic Magnolia. 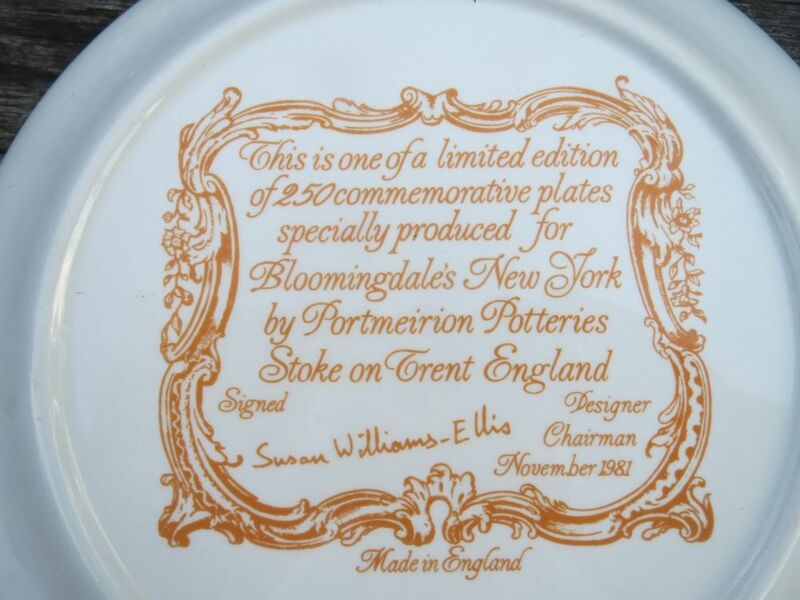 And this one, a do-it-yourself plate perhaps?